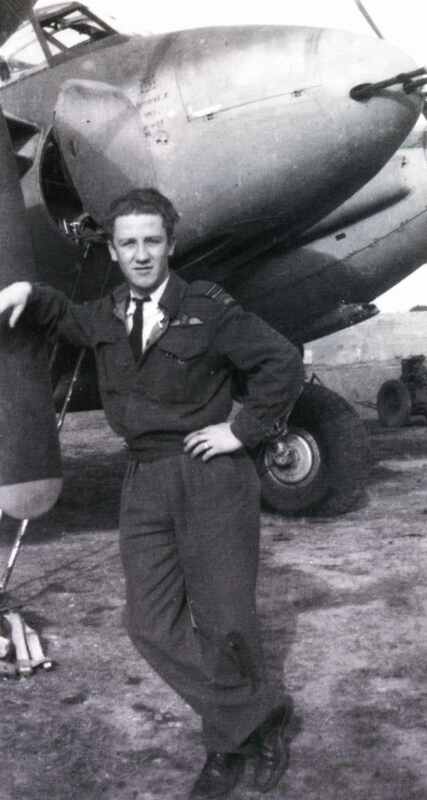 Eric Smith as a young wartime Mosquito pilot in the UK with 107 Squadron. These first two photos of Eric appear in Vol.2 of Canada’s Air Force at War and Peace. I’ve left the caption in for this one, so that you can get a sense of what such young Canadians were doing to help shorten the war. If it meant giving your life, then that was part of the deal. Eric while on secondment in Korea with the USAF in 1952. 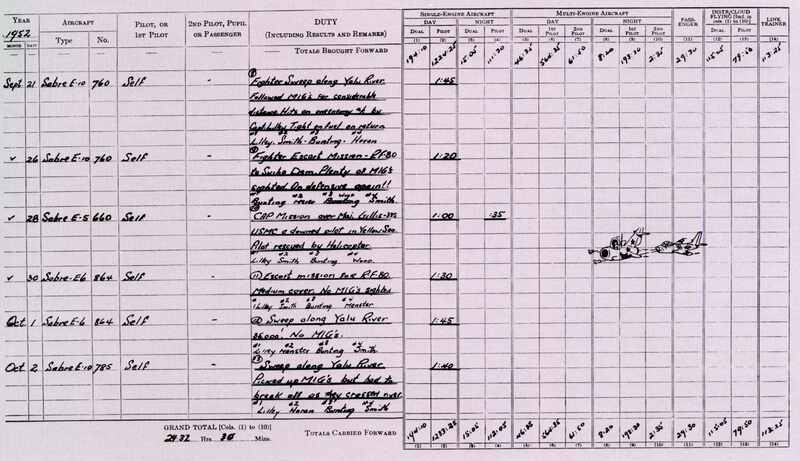 Then, a page from his log book in that period, when he was flying the F-86 Sabre, battling it out with Chinese air force MiG- 15s. While he was Chief Flying Instructor with No.1 (Fighter) Operational Training Unit at RCAF Station Chatham, teaching young pilots to fly the F-86, F/L Smith and the OTU Commander, S/L Bill Smith, flew this suitably painted “The Smith Bros” Sabre. 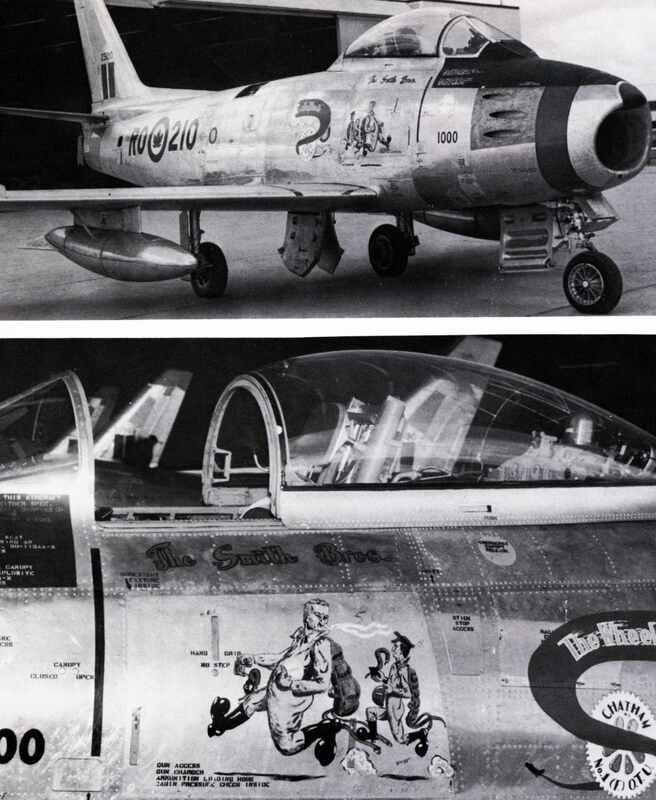 These two photos can be found in The Canadair Sabre. In 1952, Eric began instructing on Sabre F-86 jets and was invited to participate in the Korean War as an exchange pilot with the U.S. Air force going up against Russian MiG’s. In 1952, the U.S. government decorated Eric with their U.S. Air Medal : “Squadron Leader Eric G. Smith distinguished himself by meritorious achievement while participating in aerial combat as a pilot of an F-86 aircraft, 4th Fighter interceptor Wing, Fifth Air Force, flying missions against enemies of the United States, from 10 September 1952 to 14December 1952. 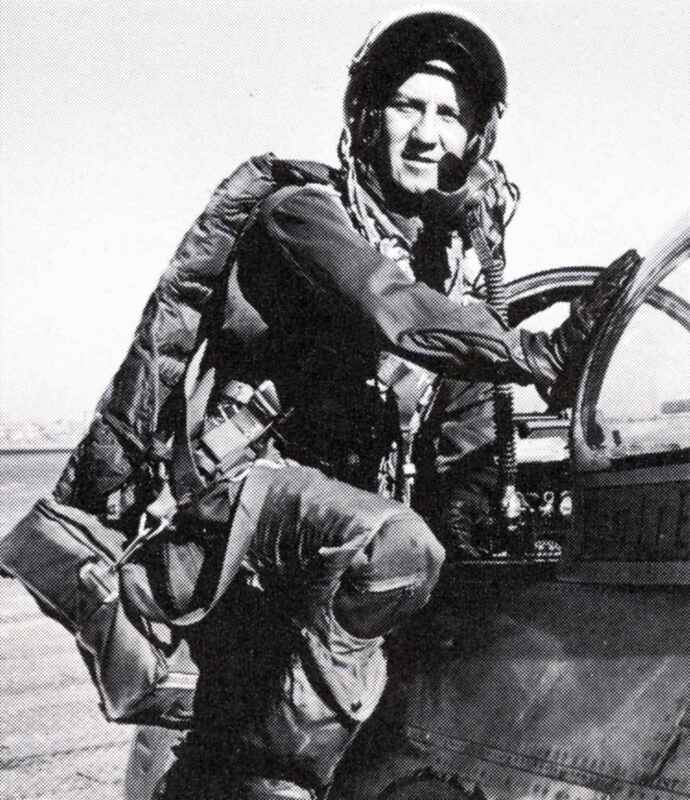 While flying combat air patrol and various other type missions deep into enemy territory, many times against a superior number of enemy aircraft, his dedication to duty and demonstrated skill were a magnificent contribution to the successful completion of the assigned mission. As a result of his fortitude and courage on these occasions he has brought great credit upon himself, the Royal Canadian Air Force and the United States Air Force.” Eric was the Commander of Sqn. No 413 from January 12th, 1959 to February 2nd, 1961. Over the course of Eric’s distinguished military career he was honoured and awarded the following medals: • Distinguished Flying Cross (DFC) • 1939-45 Star • France and Germany Star • Canadian Volunteer Service Medal and Clasp • Volunteer Service 1939-45 • Korea Medal • Canadian Volunteer Service Medal for Korea • United Nations Korea Medal • CD Canadian Forces Decoration • United States Air Medal • Korean War Veterans Association Medal • Queen Elizabeth II Diamond Jubilee Medal • French Legion of Honour at the French embassy in Ottawa. In March 1953, while stationed in Chatham New Brunswick, Eric met Dinah Rosaleen Cole. They were married in Toronto on May 16th, 1953. Eric retired from the RCAF in August 1968 and moved to a farm 7 miles south of Kemptville where he and Dinah took up farming. Eric sold real estate for Albert Gale Real Estate from 1971 until his retirement in 1991. 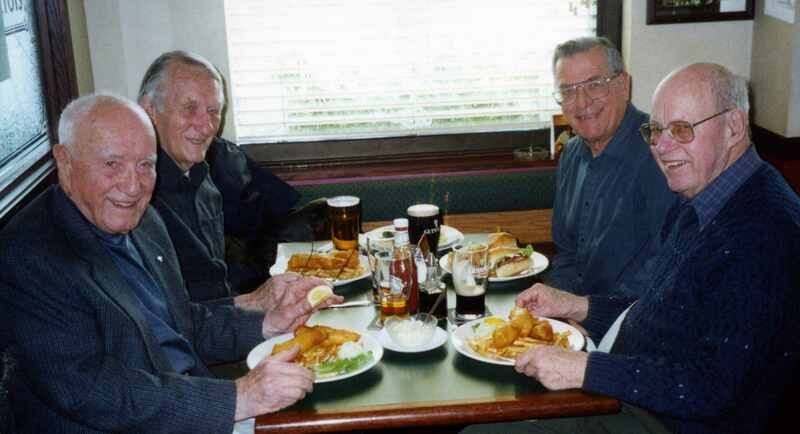 In May 2001, Eric and Dinah moved back to his home town of Navan. Eric enjoyed both playing and watching hockey. Eric played hockey for the winning Navan team in the 1946 Bradley Cup in which he scored five goals. Eric’s other favourite sport was curling which he played up until 2015. Eric was a proud member of the RCAF, SPAADS, Branch 632 Canadian Legion, Orleans, 410(William Barker VC) Wing RCAFA, Knights of the Round Table, Masonic Lodge Maitland Chapter, Tunis Shriners, Legion of Honour and the Navan Curling Club. The family would like to thank the Ottawa General 5th floor nurses and doctors and Eric’s family doctor – Dr. Bujold. The family would also like to thank the care at home from SE Health/Access Care and Champlain LHIN. Family and friends are invited to visit at the St. Laurent Chapel of Hulse, Playfair & McGarry, 1200 Ogilvie Road (at Aviation Parkway), Ottawa, on Friday, April 5, 2019 from 2-4 pm and 6-8 pm. A Funeral Service will take place at St. Mary’s Anglican Church, 3480 Trim Road, Navan, on Saturday, April 6, 2019 at 11 am. As an expression of sympathy, donations to St. Mary’s Anglican Church would be greatly appreciated by the family: P.O. Box 71, 3480 Trim Road, Navan, Ontario K4B 1J3. Interac transfers can also be sent at St.Marys.Navan@outlook.com. 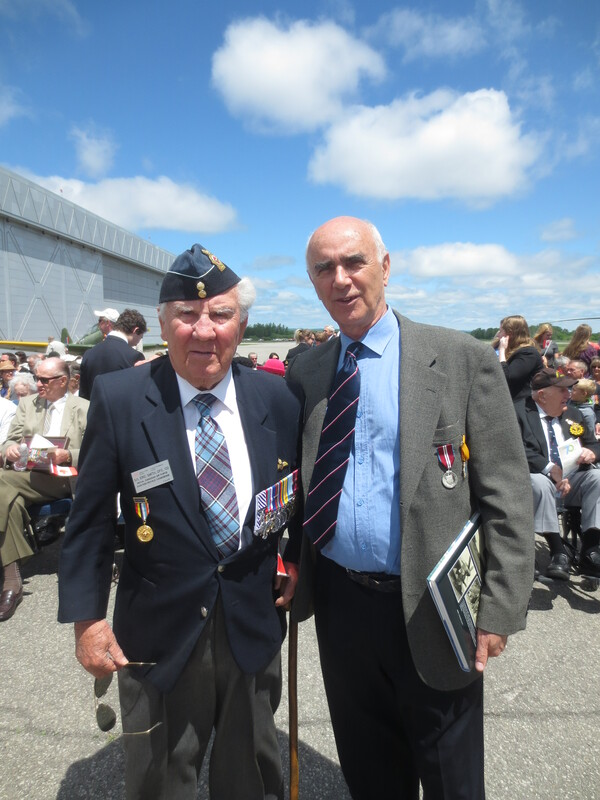 Eric and I while visiting the Canadian Aviation and Space Museum in Ottawa for D-Day celebrations on June 6, 2014. Even among fighter pilots, Eric Smith was a rare breed. The Navan, Ont. wing commander was one of the few Canadians to fly combat missions in the Second World War and Korean War — and receive decorations for both. “He was in an exclusive little club,” said Canadian aviation historian and author Larry Milberry. Smith received a Distinguished Flying Cross (DFC) for the valour he showed in flying more than 50 low-altitude night fighter missions over France, Belgium Holland and Germany during the Second World War. He received the U.S. Air Medal for “his fortitude and courage” in flying 50 combat missions in the Korean War while on secondment to the U.S. Air Force. Eric George Smith was born on Jan. 26, 1921 in Navan, Ont., about half an hour east of Ottawa. His father was a farmer and a veteran of the First World War. Eric often accompanied him as he delivered milk and cream by horse-drawn wagon to Ottawa. An accomplished student, Smith graduated from teacher’s college, Ottawa Normal School, and took a job at a small schoolhouse in Carlsbad Springs. The Second World War interrupted his fledgling career. In July 1941, at the age of 20, Smith enlisted with the Royal Canadian Air Force, determined to be a pilot. At 5’6’’, he narrowly met the height requirement. “If he wasn’t going to be a pilot, he didn’t want to be anything else,” said his daughter, Erin Zintel. Smith had heard his father’s stories about the mud and misery of trench warfare, she said, and he wanted nothing to do with the regular army. He trained in Toronto, Trenton, Belleville and Portage La Prairie before earning his pilot’s wings at Camp Borden. After still more training, Smith became a pilot instructor at No. 2 Service Flying Training School at RCAF Station Uplands — one of 231 sites opened in Canada to train pilots, navigators, gunners and flight engineers for the war. On the evening of March 5, 1945, Smith was one of only two pilots to get into the air because of dense, low-lying fog. The other pilot died that night in a crash landing. 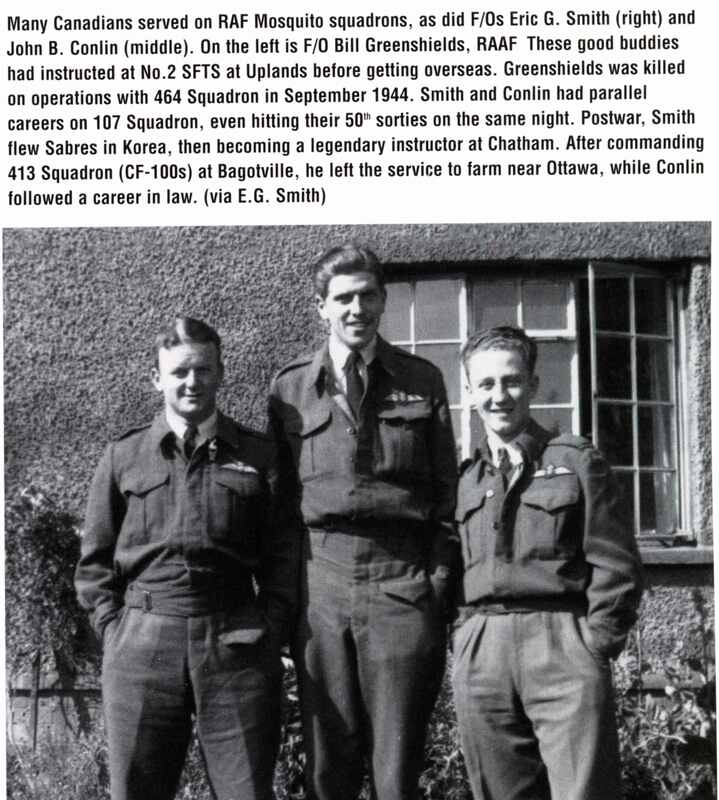 In April 1945, Smith was awarded the DFC with a citation that read: “He has at all times exhibited great determination, initiative and daring, and set an inspiring example by his fine fighting spirit and devotion to duty.” After the war, Smith returned to Canada and enrolled in university. But after a year in school, he decided to return to the air and to the RCAF. In 1952, he accepted a secondment to the U.S. Air Force to fly in the Korean War. Smith flew an F-86 Sabre jet on 50 combat missions, which took him deep into enemy territory and pitted him against Russian-built MiG fighters. Then a squadron leader, he was one of 22 RCAF pilots to fly in Korea. It’s believed he was the last surviving member of that exclusive group. Smith once told an interviewer how the high-flying MiGs would attack from out of the sky. The MiGs could climb to 50,000 feet while the Sabres couldn’t get above 42,000. On one sortie, he said, a MiG dropped right onto his tail. “But he was a very poor shot I guess,” Smith said of his narrow escape. After returning to Canada, Smith was stationed in Chatham, New Brunswick, where a late season blizzard changed his life. In March 1953, during the storm, he crashed his car into a snow bank on RCAF Station Chatham. Two women went to see if he was OK. Dinah Cole, on her way home from the midnight shift as a fighter control operator, was one of them. “He ploughed into a snowbank right in front of me,” she recalled. “I opened the car door, and I said to him, ‘Can I help you? Can I phone somebody to pull you out?’ “He took a look at me and said, ‘No, but you can keep me company until someone comes, though’ … That was smooth.” The two were married five weeks later. Cole, then 21, had to quit her job since Smith was her senior officer. There’s always some good chitchat around the circuit about books – those beloved emblems of wisdom, knowledge, art, sheer beauty and pure joy. Books have been with us for millennia. Anyone with half a brain knows that they never can be replaced, no matter how many dunderheads rant and rave against them, try to belittle publishers and authors, and boringly spew that old rot about “everything” being on the web. What a farse, eh, and talk about pitiful! Here’s a good one from this week’s “Toronto Star” (March 27, 2019). Columnist Heather Mallick is on a bit of a book tear, pointing out how, try as she might, she can’t give her personal books away, not even to the local USED bookseller. She admits, “so I’m bagging them … and dumping them beside the blue bin”. Gads … what sort of books does she read or are they contaminated by the plague? Here at CANAV, used books are beloved, and sales have been a key part of the operation for decades. 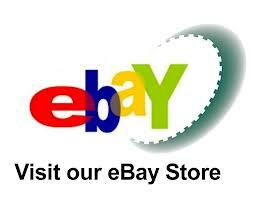 These sales help greatly in fundraising to finance the next CANAV project. Thank you, devoted readers, who can’t wait to see what’s lately been added to the CANAV used book list. Anyway, Mallick wonders if books have become “a social embarrassment to be disposed of by stealth in the dark of night”. There’s a buried suggestion here that no one with any sense would be caught with a book in the house. She mentions that, apparently, it’s now a big thing with real estate agents and house stagers to get every book out of sight when preparing a house for showing. Books just spoil everything, don’t they. Finally, Mallick drops books and wanders off to chatter about her minimalist lifestyle, the woes of Trump and China, and other far-out stuff. There’s an revealing thing about this edition of the “Star”. After plodding through the Mallick column, I flipped a few pages only to find a “Wall Street Journal” story about Michelle Obama’s recent life’s story, Becoming, published by Penguin Random House. Sales have topped 10 million copies in 5 months – a world record for this genre through all the centuries of books. So … methinks the book is probably in OK shape for at least a little while longer. Ergo … will you strange people out there please stop bothering us about the book supposedly being “dead”, “useless”, “environmentally hazardous”, etc? I doubt that you could even get Homer Simpson to agree with your moronic campaigning. 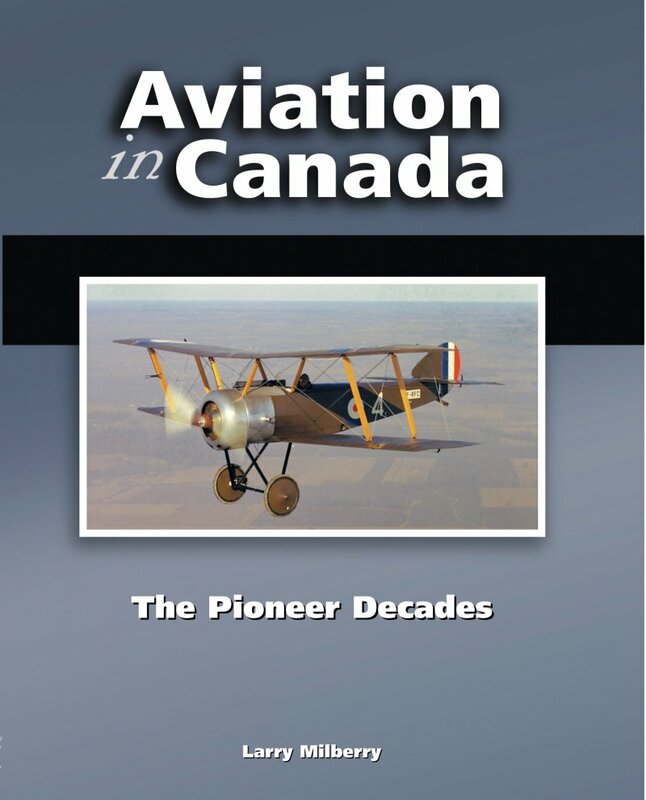 Speaking of books … probably 98% of recorded Canadian aviation history is found on the printed page. So, if you don’t have a good library of Canadian aviation books, basically, you’re in the dark about the topic. CANAV has published almost 40 titles since 1981. On the whole, these all are about people first, i.e., the folks who designed, built, flew and maintained the planes. I’ll never live long enough to write about all those who still have not yet been covered. I still have innumerable photos of these fine citizens and every once in a while, like to show you a few on the blog. That gets a little more of the story told. Here are some old photos that recently popped up. 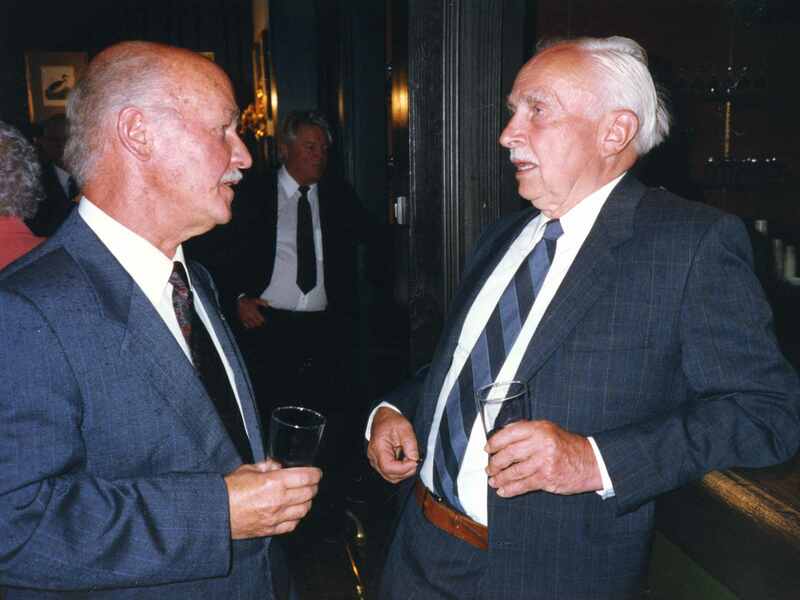 First, seen at a CANAV book launch in 1991 are two of the most important figures in Canadian aviation history. On the right is K.M. “Ken” Molson (1916-1996), the most influential man in all of Canadian aviation, when it comes to history. 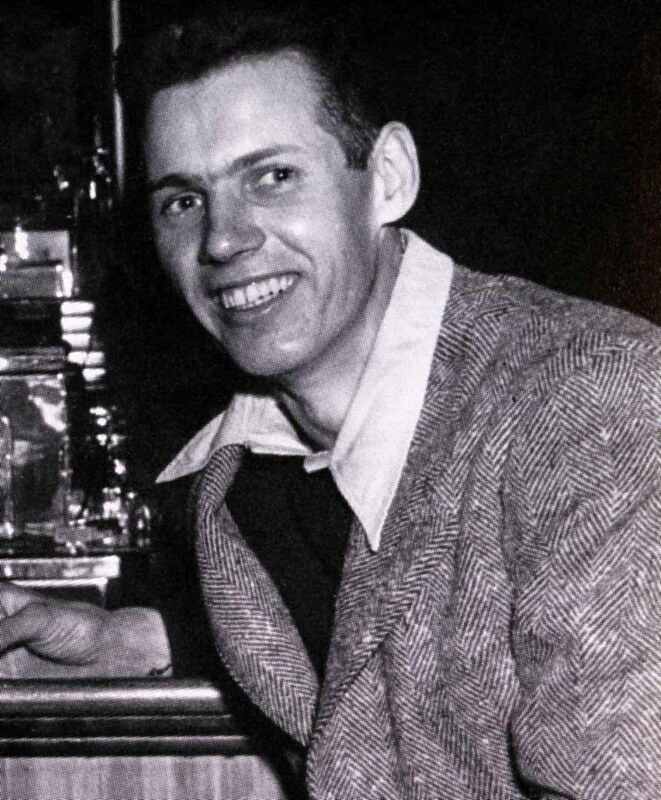 Having moved to Toronto as a boy from the “Montreal Molsons” (following family tragedies in the 1930s) Ken went on to earn his aeronautical degree at the University of Toronto. His first job was working on the Lysander line at National Steel Car at Toronto’s old Malton airport. There he remained through the CF-100 and CF-105 eras, then went to Ottawa to establish Canada’s national aeronautical collection. As the collection’s first curator, Ken set the tone that you still get when touring it more than half a century later. It all starts with the magnificent collection that Ken passionately assembled of the classic planes that “made” modern Canadian aviation back in the day – the HS-2L, Bellanca, Fairchild, Junkers, then on to the Norseman, Stinson, Beaver, Lockheed 10, DC-3, etc. Ken also laid the foundation for such other museum themes as the great aircraft of WWI. His influence is astounding. The museum as you see it today is a glorious tribute to Ken Molson, but you’d hardy know it – the man barely (maybe not at all?) is even mentioned in the place, considering that it ought to be named in his honour. 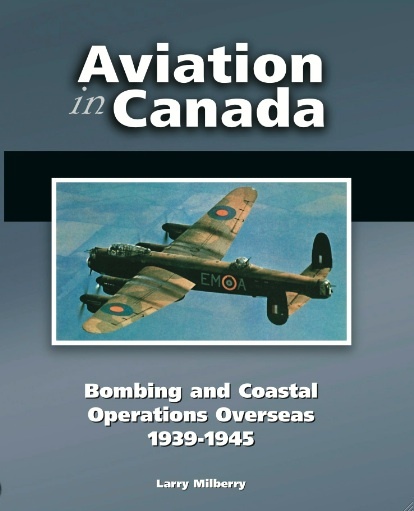 Ken also wrote several of the seminal histories of Canadian aviation, books that should be on your shelves. If you don’t have them yet, check under “K.M. Molson” at http://www.abebooks.com, where you can also order your personal copies. Ken became a true supporter of my own efforts. As the years passed, he was gradually keener to supply material I needed for various projects (it took a few years for anyone to be embraced by Ken). Here, Ken is chatting with another King of Canadian Aviation, Robert “Bob” Bradford, who succeeded Ken at the museum. A wartime RCAF pilot and to this day an active aviation artist in his 90s. Bob has an Order of Canada and is a member of Canada‘s Aviation Hall of Fame. There’s finally a move afoot to get Ken inducted in the Hall. Strange that he’s not yet a member, right. The funny thing is that he only recently was nominated and you can get in until someone starts the ball rolling. Here’s another old snapshot that grabbed my eye lately while flipping through some files. This one dates to our 1990 book launch for The Royal Canadian Air Force at War 1939-1945. On the right is William Harold David “Wild Bill” Meaden, DFC, whose story as a Bomber Command pilot is told in the book. On the left is the great aviation artist, Ron Lowry, who painted the front cover art of this best-selling title. Centre is Robert Finlayson, who painted the back cover art (which depicts a scene from Bill’s tour – the night his crew shot down a Ju.88). All three of these fine citizens have left us. Such old pictures are intrinsically important, but sure can be melancholic at the same time. Last Saturday (March 23) we attended Carl Mills’ funeral. Carl saved so much of our history from the trash heap, as with his magnificent history of the Banshee jet fighter in the RCN. He also did a massive amount of original work unearthing all the details about Canada’s airmen who fought in Korea. 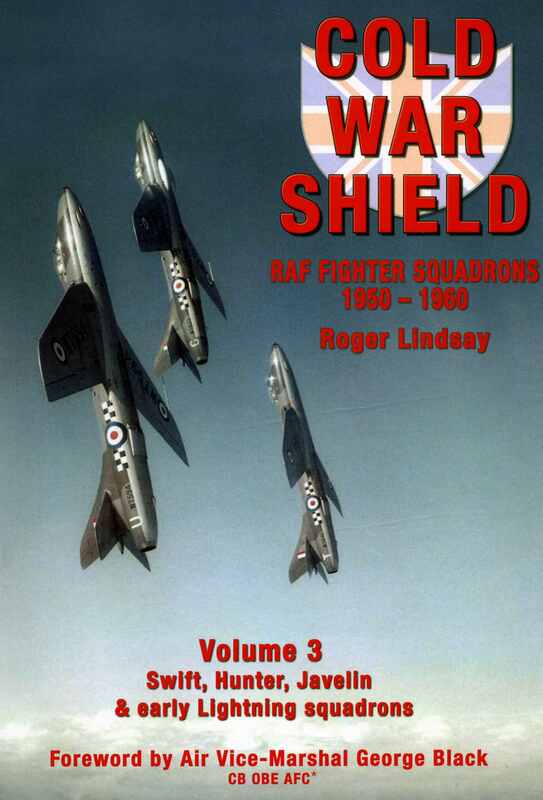 In recent years he had been working diligently on the history of 400 Squadron. Included in that task, he built several important scale dioramas (masterpieces of art) and commissioned several wonderful paintings by some of Canada’s top aviation artists. Just a few days earlier, I learned that the great Peter Mossman, the artist who painted the cover art for our first three books, also had died. The Canadian Aviation Historical Society was founded in 1963 to preserve Canada’s aviation heritage. I attended the second ever CAHS meeting and have membership No.11. The society thrived through the decades with chapters across Canada, a magnificent quarterly journal, newsletters and annual conventions. Sad to say, but the CAHS has been up against a lot in recent years. Like many such organizations, it’s hard hit by the aging (and passing) of members, and the difficulty of pulling in new members. Not helping matters, the society was riven by unnecessary internal strife in more recent times. How dumb was that, just when CAHS people should have been extra supportive and out there beating the bushes for members, etc., instead of fomenting civil war in its own ranks. But such things happen when folks lose sight of the big picture and start beating their own irrelevant little drums. Here’s a historic photo going back to early CAHS days (1960s) in Toronto. In front in this group of CAHS pioneers are Art Marcopoulis, John Ham, Roger Juniper, Charlie Catalano, Bruce Gowans and Doug MacRitchie. Behind are (standing) Ernie Harrison, M.L. “Mac” McIntyre, Jeff Burch, George Morley, Al Martin, Frank Ellis, Elsie Ellis, Terry Waddington, Clint Toms, Bill Wheeler, Don Long (in front Bill) and Boris Zissoff. 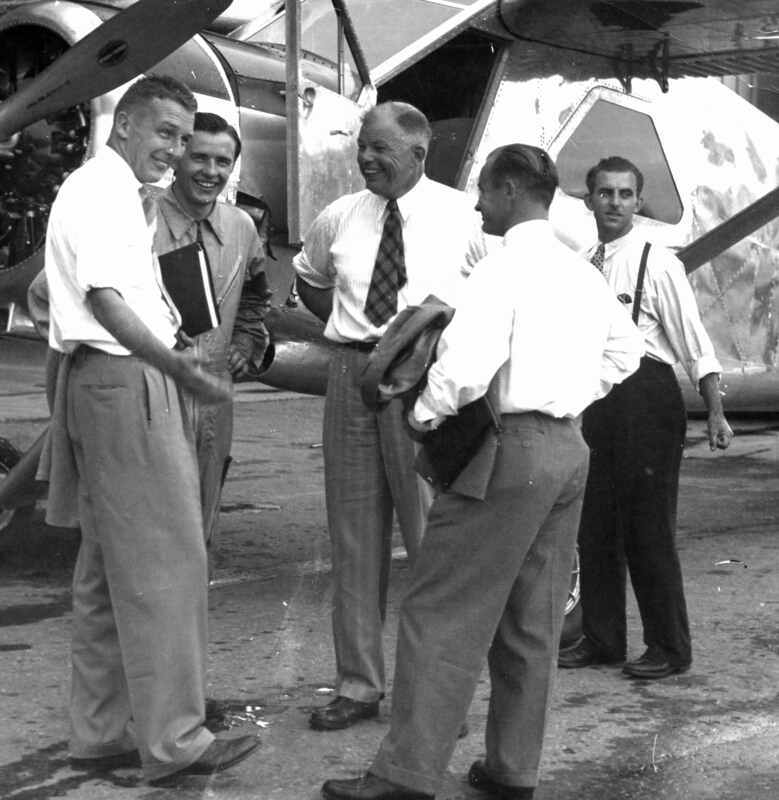 Each of these brought a unique aviation background to the society, and each worked diligently to build the society into a world-class organization. To my knowledge only Bruce, Ernie and Bill are still with us in 2019. Love the Beech 18? Then This Is for You! If you scroll back a few pages you’ll see our blog item “The Enduring (Indestructible?) Beech 18”. Well, as any true fan knows, we can never get enough Beech 18 coverage, so this week I’ve put together a series of superb photos taken mainly in the 1970s by the great Toronto-based photographer, Joan Turner. Almost annually, Joan and her brother, Bill, would make a driving tour across Northern Ontario to cover the bush flying scene. Invariably, they would find a good number of Beech 18s. Of course, they could be sure of finding the usual old standards, as they clocked up the miles from Sudbury westward – to Chapleau, Sault Ste. Marie, Wawa, around Lake Superior to the Lakehead, then westward to such haunts as Ignace, Fort Frances, Nestor Falls, Sioux Lookout and Red Lake. The whole experience must have been 100% fun. Take a look at these wonderful stock Joan Turner photos. Some 50 years later, several of the fine old Beechcrafts that Joan covered are still at work, still turning heads with their classic great looks … and still making money, right. As to the captions, you might wonder from where so much Beech 18 trivia possibly could originate. There are many important sources, as any aviation bibliophile will know – just look in the books. Yes … in those actual amazing things made out of paper, ink and glue. Try on Air Transport in Canada, for example, where you will find 100s of references to Canada’s Beech 18s (ATC presently is on sale at CANAV Books at $60 off, check right here: 2 Blog CANAV Booklist Spring_Summer 2019 Then (as mentioned in our earlier Beech 18 item) there’s the world’s top Beech 18 book, Beech 18: A Civil and Military History by Robert Parmerter. By far the single most important website is that of Australian historian, Geoff Goodall. For this goldmine, google “Beech 18 Production List”. There are so many other sources for the keen reader and fan (weenies need not apply, of course). So … strap in good and tight, here comes “The Joan Turner Beech 18 Gallery”. To see a photo full screen, just click on it. One of Canada’s Beech 18s that served longest with the same owner was CF-HHI, which had served originally with Florida Airways in 1946. 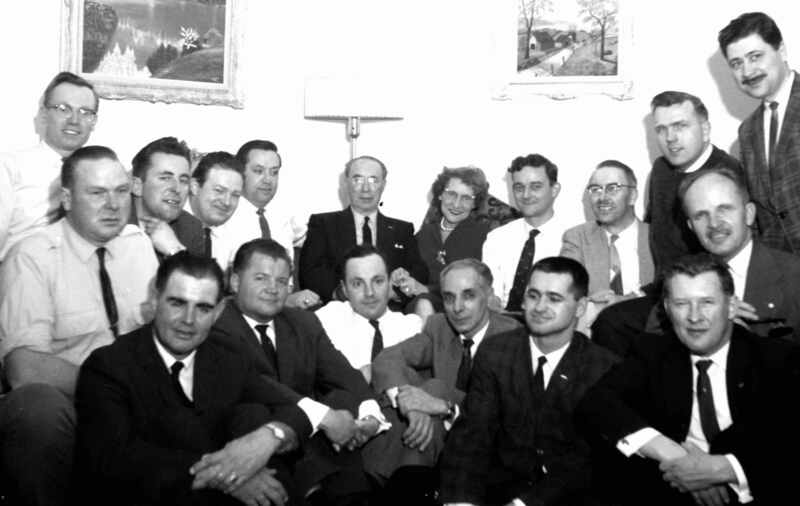 Having joined International Nickel/Canadian Nickel Air Services of Sudbury in 1953, “HHI” served the company in the exploration and executive roles into 1974. The great George Cramer, who had flown Sunderlands through WWII, was chief pilot for most of this Beech’s career. Today, “HHI” is C-GZCE. Painted in RCAF wartime colours, it flies airshows and hops passengers with the Canadian Warplane Heritage of Hamilton. Joan photographed “HHI” at Ramsay Lake, Sudbury on August 8, 1970. Visiting Sudbury on August 5, 1972, Joan photographed this lovely privately-owned Beech “Super 18”, CF-ZYT. 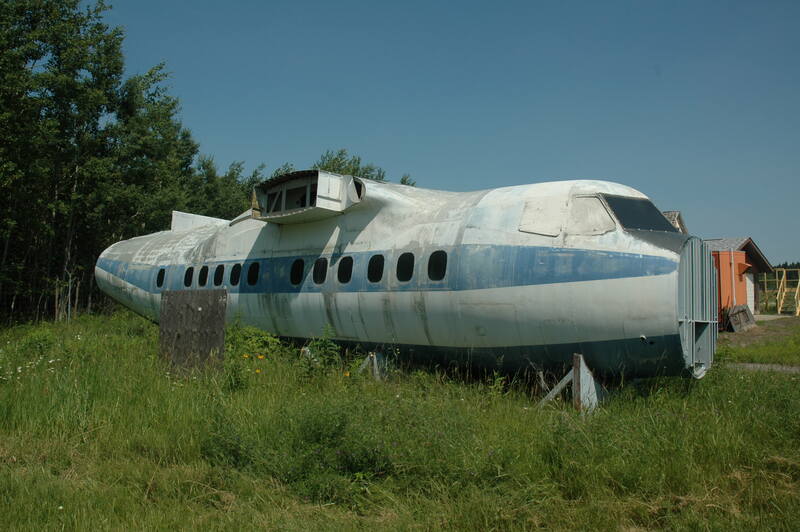 Built in 1960, it initially had been N9941R with Wiles-Holloway Inc. of Baton Rouge. 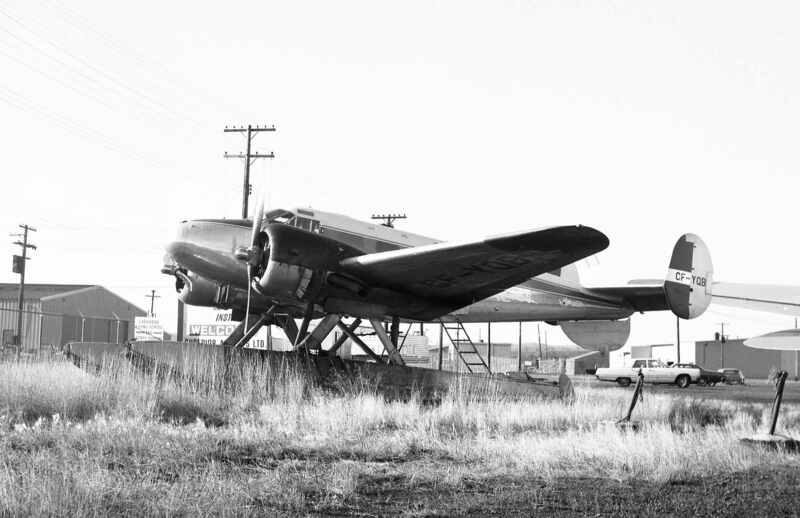 It next served a Houston drilling company, then was sold to Don Plaunt of Sudbury, whose business interests ranged from forestry to radio/TV to a mysterious fleet of DC-6s in California. In 1977 “ZYT” was sold in Alaska, becoming N741GB. Soon after, however, it suffered a forced landing and never flew again. 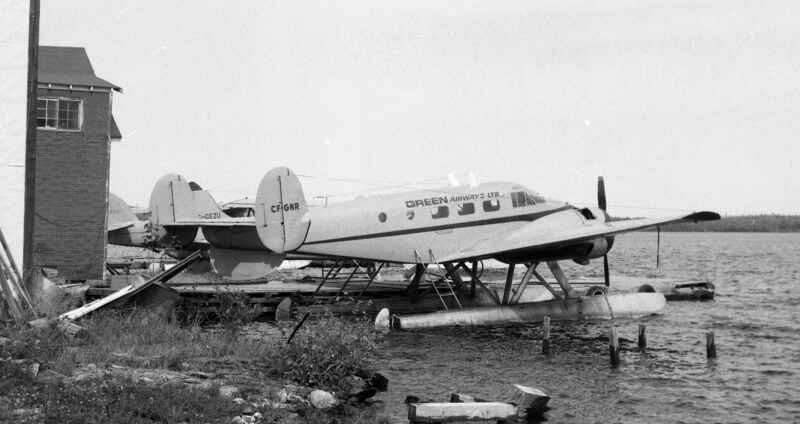 On September 16, 1977 Joan found George Theriault’s lovely Beech 18 CF-KAK looking photogenic at the dock at George’s tourist base near Foleyet, northeast of Chapleau along Hwy 101. “KAK” is a really historic Beech, having begun in 1944 as RCAF 1418. 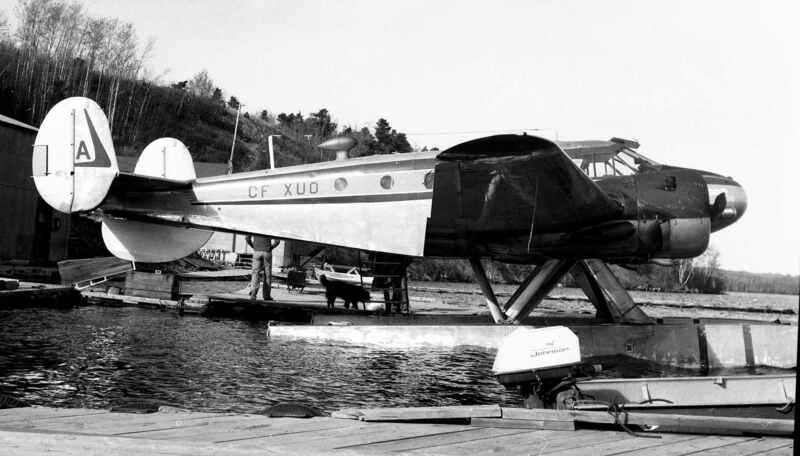 After serving several other carriers over the decades, in 2019 “KAK” was with Pacific Seaplanes of Nanaimo, BC. In 1994 George Theriault published his personal story all about life and flying in the Canadian Shield. 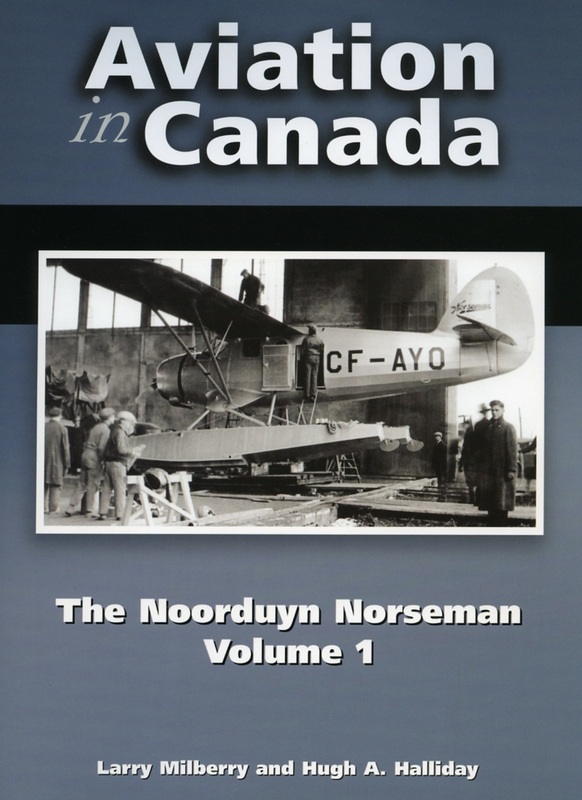 I recommend that you track down a copy — Trespassing in God’s Country: Sixty Years of Flying in Northern Canada. It’s a beauty. Much earlier (September 12, 1971) Joan had spotted “KAK” at Toronto YYZ soon after George Theriault acquired it from Keir Air Transport of Edmonton. “KAK” was always noted for its pointed nose — different for the average Beech 18. Retired bush pilot Joe Sinkowski of Red Lake points out that Green Airways’ Beech CF-GNR also had this off-beat mod. 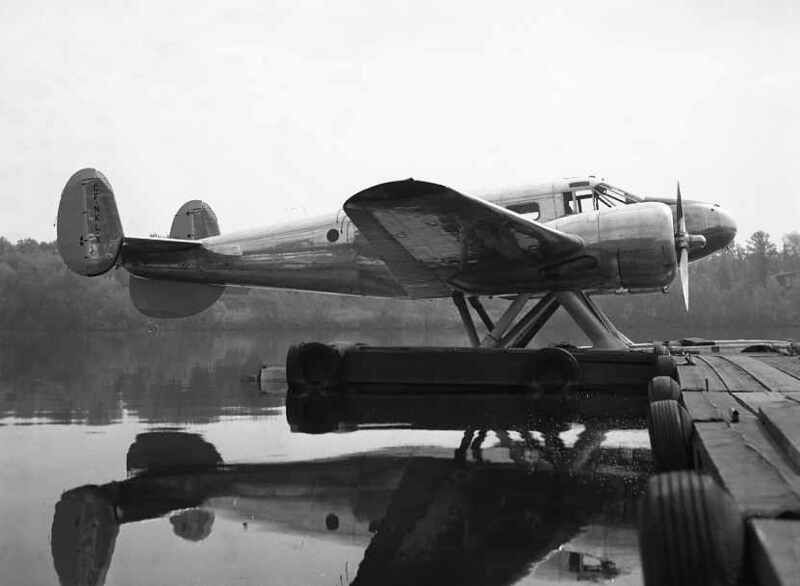 That same day at Air-Dale (always a key stop for any spotter touring Northern Ontario), Joan photographed CF-AIR-X. 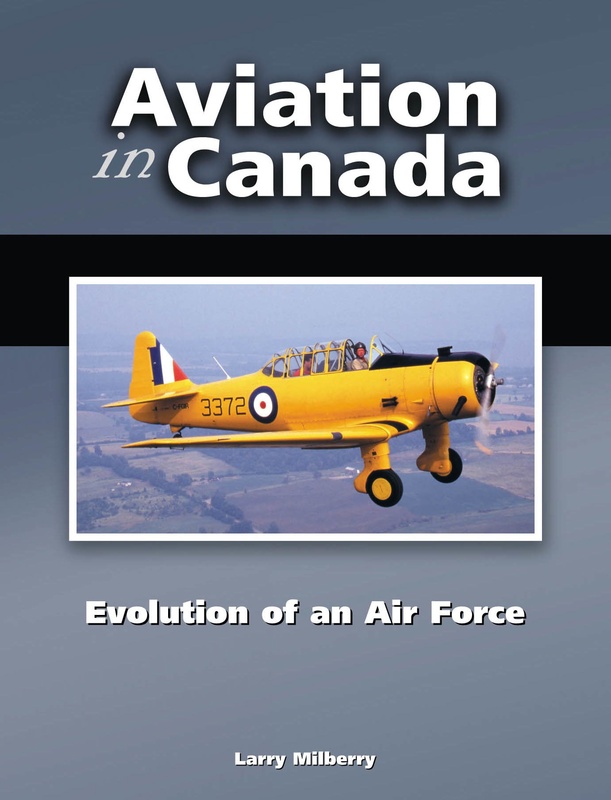 “AIR” had begun in 1952 as RCAF Expeditor 1506, and first appeared on the Canadian Civil Aircraft Register in 1967. By this time it had been consigned to the weeds at Air-Dale. Why it carried an “X” registration isn’t know. However, take a look at the airframe. It looks as if it might comprise two different Beech 18s. Something like that could have required an “X”. The rudder paint job suggests a former Royal Canadian Navy Expeditor. There always are these mysteries for the spotters to research. Westward we go … another Beech 18 in Joan’s files is CF-YQB. She took this shot on September 27, 1976 at Thunder Bay/Lakehead Airport. “YQB” had been RCAF 1553 from 1952 to 1968, when it was declared surplus. In 1970, O.J. Weiben (Severn Enterprises, Superior Airways, etc.) of Thunder Bay acquired it from Crown Assets Disposal Corp. — the government agency in charge of selling off surplus Canadian military equipment. In this period Beech 18s were selling for as little as $2000. “OJ” operated “YQB” in the bush until selling it in Florida in 1987. There it briefly was N9062Z, then returned to Canada a year later, picking up its former ID. Based at Inuvik near the Arctic coast, it operated under various banners, finally being with Arctic Wings and Rotors. In July 1994 it was reported destroyed by fire. 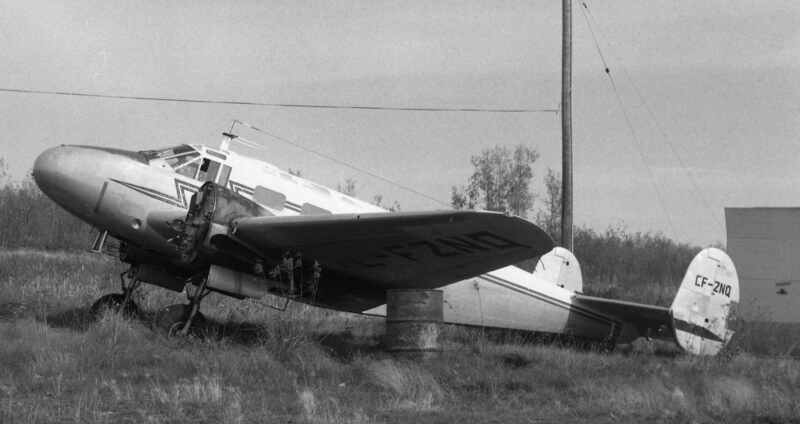 Formerly RCAF 2379, CF-ZQH was another of the many Expeditors acquired cheaply by O.J. Wieben. This Expeditor must have been extra nice, for “OJ” used it as his personal plane from 1971. “ZQH” crashed on October 4, 1981. Retired bush pilot, Joe Sinkowski, recalls: “It was Orville’s personal airplane for getting around from Thunder Bay to places like Pickle or Wiebenville. There were very few whom he trusted to fly it, mainly some of his DC-3 captains. ‘ZQH’ was operated only on wheels. It was sold with the company after Orville passed away. I can’t recall the exact details, but someone put it into the bush somewhere north of Armstrong, when flying from Fort Hope to Thunder Bay.” Joan photographed “ZQH” at Thunder Bay on September 27, 1976. 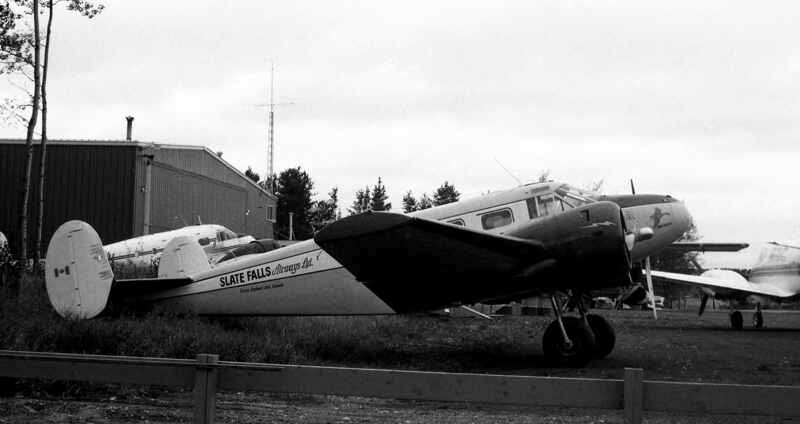 Beech 19 CF-RVR of Slate Fall Airways at Sioux Lookout on September 19, 1977. “RVR” began in 1944 as a USAAF UC- 45B, then was delivered under Lend-Lease straight to the Royal Air Force. Next, as fast as the paperwork could be stamped, it was transferred to the RCAF as Expeditor 1402. It served into 1964, then was struck off charge. It was purchased in 1965 via CADC by Manitoba’s Ilford Airways. 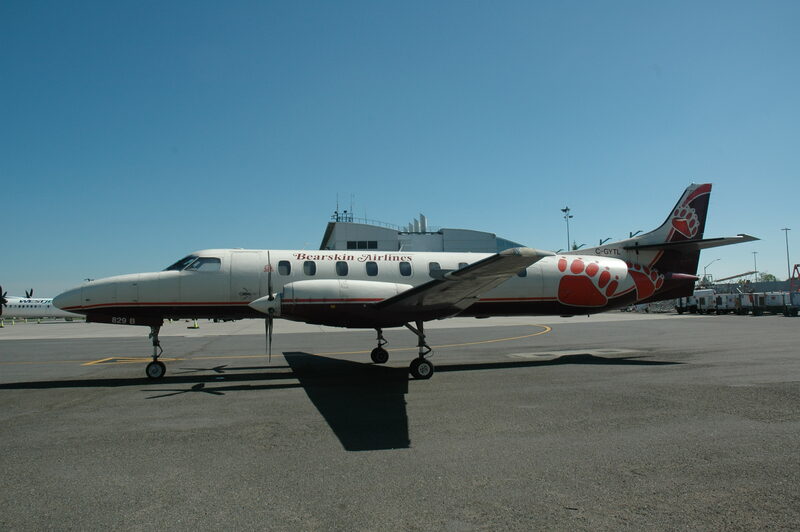 It next served Slate Falls (1970-84), then other outfits until joining Air Rainbow of Nanaimo, BC in 1991. While taking off from Nanaimo on January 27, 1992, it crashed disastrously, killing seven of the nine people aboard. Airplane boneyards are always fascinating places to visit for spotters, photographers, artists and other aviation fans. 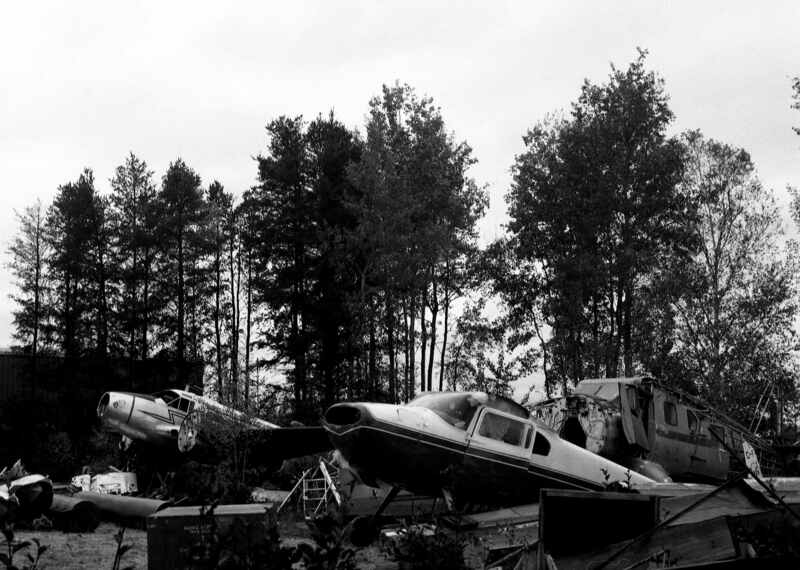 On September 19, 1977 Joan Turner dropped by this old bushplane “cemetery” in Sioux Lookout. Included in the general mayhem was a Cessna, a very tired old Norseman, and Slate Falls Airways Beech CF-DLN (ex-RCAF 2334 1952-70). Joan photographed Green Airways’ famous Beech 18 CF-GNR in its yellow-and-green paint job at Red Lake on September 20, 1977. 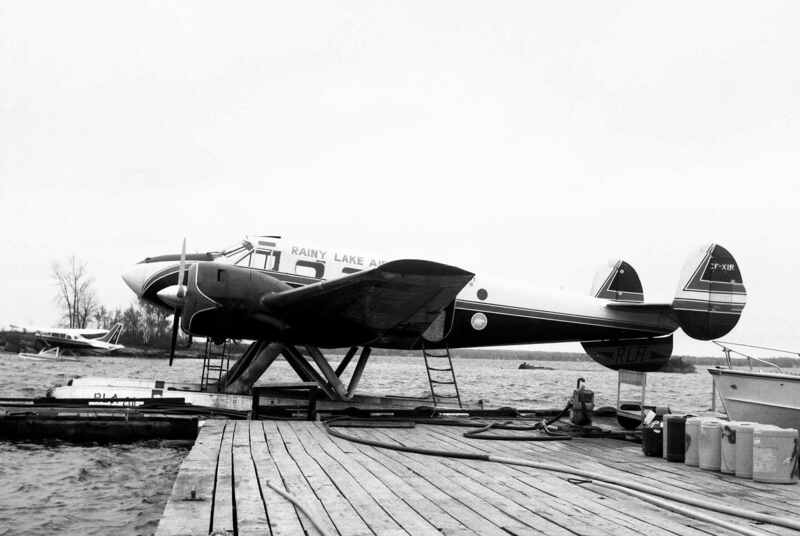 Formerly RCAF 2318 (1952-65), “GNR” later served Larry Langford’s Vancouver Island Air. In August 2013 it was noted as having logged 18,173 flying hours. In 2014 it was sold. At that time, Larry told me, “Our last Beech C-FGNR went to a collector in Belgium of all places. She flew 50 hours on that trip without a problem. Longest leg was over 8 hours Iceland to Scotland. Owner, Taigh Ramey, and a Canadian pilot, Brad Blois, did the trip. Still the nicest aircraft on floats I have flown.” With this odyssey “GNR” became the only Beech 18 to have flown the North Atlantic on floats. Its registration today is N1XW. CF-XUO of Ontario Central Airlines at Red Lake also on September 20, 1977. 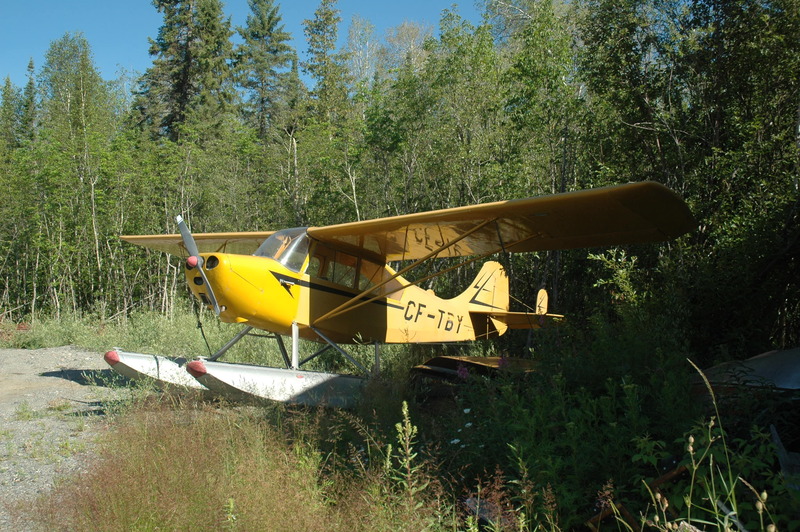 Ex-RCAF 2329, it served OCA 1974-84, then wandered all over the place from Nunasi-Central Airlines to Green Airways, Pickle Lake Air Service, Kelner Airways, Beaver Air, Ignace Airways and (today) Showalters Fly-In of Ear Falls not far south of Red Lake. Yet another clapped out ex-RCAF Expeditor (or, “Exploder”, as some called it back in RCAF days), CF-ZNQ had been RCAF 2339. It briefly was listed to Pembina Air Services of Morden, Manitoba in 1972, then joined Harvey Friesen’s Bearskin Airlines in 1974. Joan saw it at Red Lake/Cochenour airport on September 20, 1977. Doesn’t look as if Bearskin ever flew it, but probably just used it for spare parts. 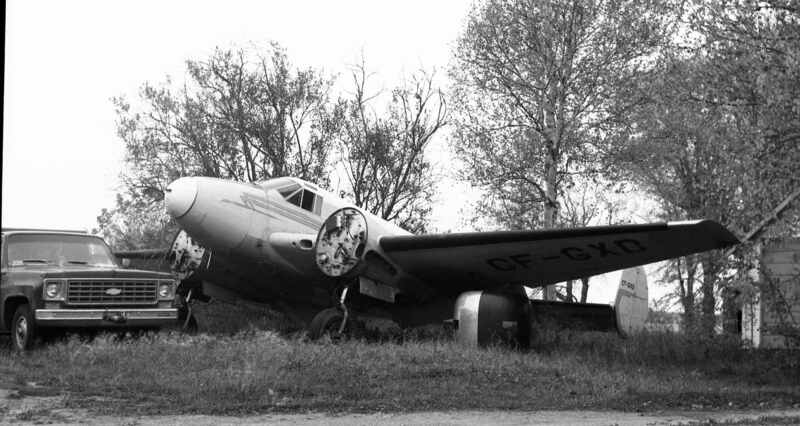 CF-PVC was another well-known northern Beech 18. As RCAF 1546 (then 5186) it was one of the last RCAF Expeditors in service. From Crown Assets Corp. storage in Saskatoon, in 1971 it was sold to Northern Stores, mainly to serve the 219 nm route between Red Lake and Big Trout Lake, hauling groceries and supplies. 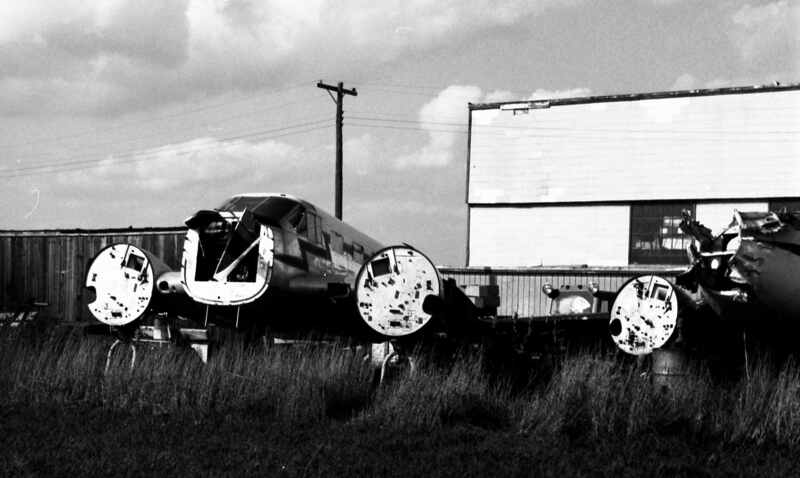 Here it is derelict at Red Lake on September 20, 1977. It’s a fair guess that it finally went for pots and pans. Lake-of-the-Woods country. One of Rusty Myers always-handsome Beech 18s: C-FERM at Fort Frances on September 25, 1976. “ERM” had been RCAF 1487 from 1951 to 1967. Rusty Myers picked it up in ’67, then operated it into the 2000s. It was only the advent of the Cessna Caravan that spelled the end of the classic Beech 18 at Fort Frances. To this day “ERM” sits derelict at Fort Frances alongside “BGO”, “RVL” and “ZRI”. Ex-RCAF 2336 CF-BGO at Fort Frances on September 23, 1977. It served Rusty Myers from 1970 until a disastrous accident on July 6, 1996. I don’t know the details other that that “BGO” apparently crashed in the bush. Happily, all 5 aboard survived. An unknown ex-RCAF Expeditor at Fort Frances on September 23, 1977. At this late date, this could only have been a Rusty Myers “hangar queen” used for the occasional spare part. Joan walked around it looking for any sign of former ID, but found nothing. When tallying all the superannuated RCAF Expeditors in Canada, it’s clear just how resourceful/prudent Canada’s (usually tight-fisted) northern air carriers were when it came to an opportunity such a military surplus Beech 18s. Everyone knew how tough and reliable the Expeditor was, and how cheap it was to buy in via Crown Assets Disposal Corporation. Also, by 1968 people knew how a Beech could do just about any ordinary job on floats or skis, whether on the BC coast, in the mountains, across the prairies or anywhere northward all the way to the Beaufort Sea or Ungava. Just for fun, if you check the March 31, 1972 Canadian Civil Aircraft Register you’ll see the following Beech 18 versions listed: AT-11 – 3, C18S – 7, C-45 – 13, D18S – 40, E18s/G18S – 12, ex-RCAF 3N, 3NM and 3T trainers – 62. Total 137. These were based everywhere from Victoria to Prince George, Watson Lake, Calgary, Edmonton, Yellowknife, Hay River, Inuvik, Winnipeg, Morden, Pine Falls, God’s Lake Narrows, Flin Flon, Fort Frances, Red Lake, Sioux Lookout, Kenora, Big Trout Lake, Pickle Lake, Thunder Bay, Sault Ste. Marie, Timmins, Sudbury, Toronto, Ottawa, St. Félicien all the way east to Gaspé and Dartmouth. Truly, the Beech 18 deserves its place as one of Canada’s great general-purpose air transports and bushplanes. CF-GXD in Rusty Myers’ “Back 40” at Fort Francis on September 23, 1977. I can’t find much about this Beech 18, other than that it had served Canada’s Department of Transport in the 1950s-60s (it’s still in the standard gray-with-white-and-yellow DoT colours). Its Rusty Myers stint was 1970-76. C-FTBX was flying for Canadian Voyageur Airlines when Joan spotted it at the dock at Fort Frances on September 26, 1976. A 1952 Model D18S, it began as N481B with Ohio’s Aetna Freight Lines. 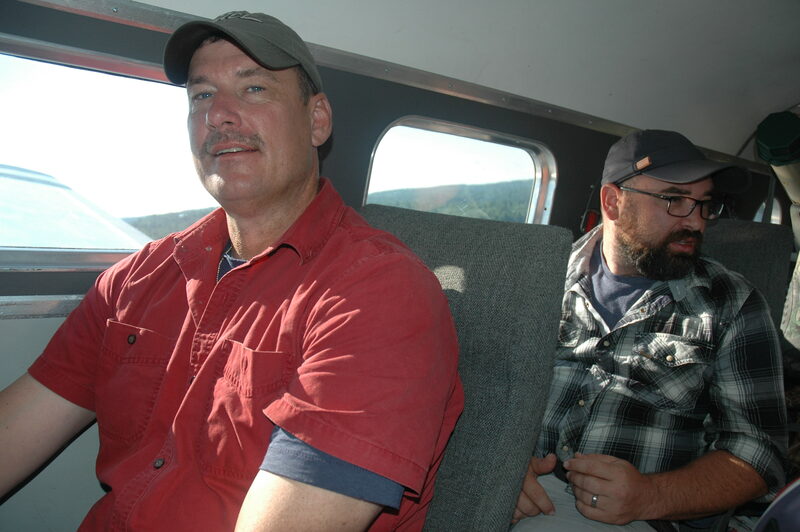 Owned these days by veteran bush operator Neil Walston, “TBX” has been dormant in Nestor Falls in recent times, but can quickly go back to work any day some work materializes. A fine view of CF-SRE (ex-RCAF 1486) at Nestor Falls, Ontario on September 25, 1976. Since joining Silver Pine Air Services of Pine Falls, Manitoba in 1970, “SRE” has been hard at work. It’s presently dormant at Selkirk, Manitoba. C-GEHX in the colours of Warren Plummer’s famous NWT sport fishing operation, Great Bear Lodge. “EHX” had been RCAF 1512 from 1952 to 1968. It later was listed to Minto Airways of Edmonton. I’m not certain about the lineage thereafter, but Minto seems to have owned the plane to about 1986, leasing it out to such operators as Silver Pine Air Services, Sabourin Lake Airways, North Caribou Flying Services and La Ronge Aviation Services. In this period it might have been on a sub-lease from Silver Pine to Plummer. Joan photographed “EHX” at Pine Falls, Manitoba on September 4, 1982. It’s presently based at Nestor Falls and expected to be at work this season. The famous Arthur Fecteau operated various Beech 18s over the years from his base in Senneterre, Quebec. These would have been important connecting his mining industry clients (and others) with Quebec City, Montreal, Noranda-Rouyn, Timmins, etc. 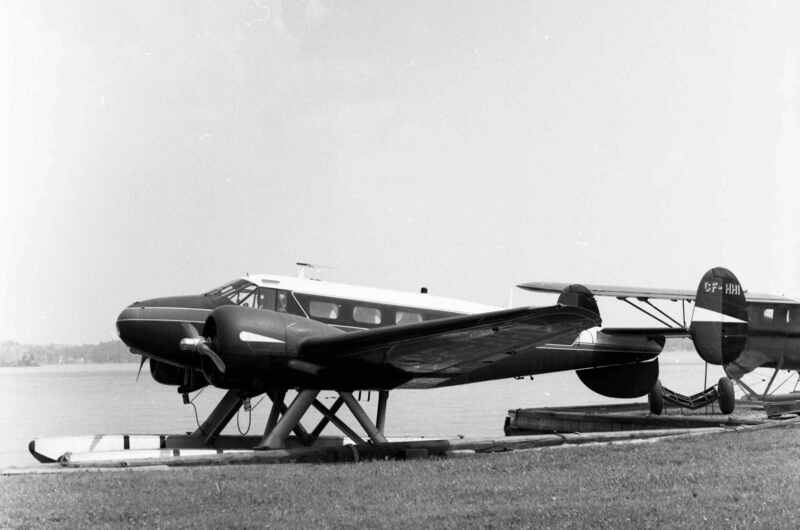 Here is his Beech 18 CF-JIR at Amos, Quebec on August 19, 1954. Too bad for us, but Joan didn’t often get into Quebec. Who was covering that vast domain aviation-wise? “JIR” was ex-RCAF/RCN 1449. Arthur operated it from 1974, then sold it to George Theriault. George quickly sold it to a US buyer, Jeno F. Paulucci, a famous Beech operator in Florida. After many years as freighter and tanker N792LP in Florida, it made its way to Minnesota in 2006. 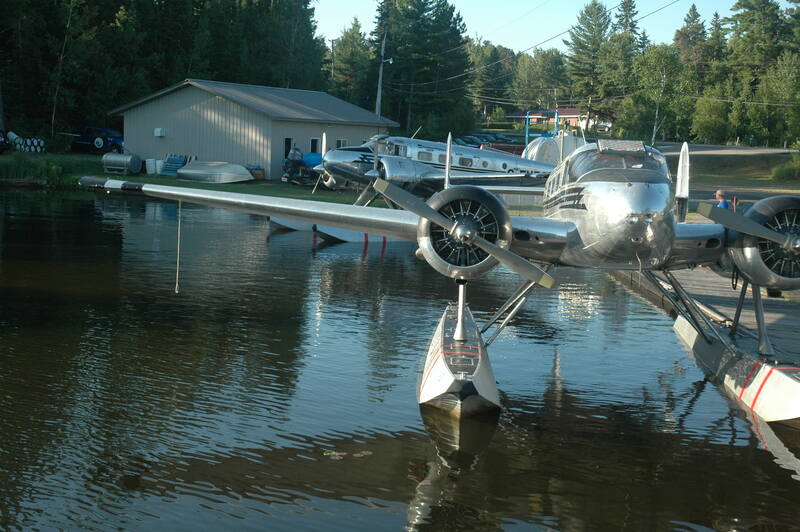 Alongside Beech 18 N33JP, it still spends its summers serving the tourist trade from its base near Duluth. Millardair’s CF-SIJ (ex-RCAF/RCN 2312) at Toronto YYZ on July 5, 1969. Check all the re-skinning recently done, plus the newly-installed cargo door (the RCAF did not have cargo doors on its Expeditors). Carl Millard also beefed up his Beech 18 wings with a wing spar mod developed by his old pal, Dave Saunders, one of Canada’s genius aeronautical engineers (father of the Saunders ST-27, etc.). 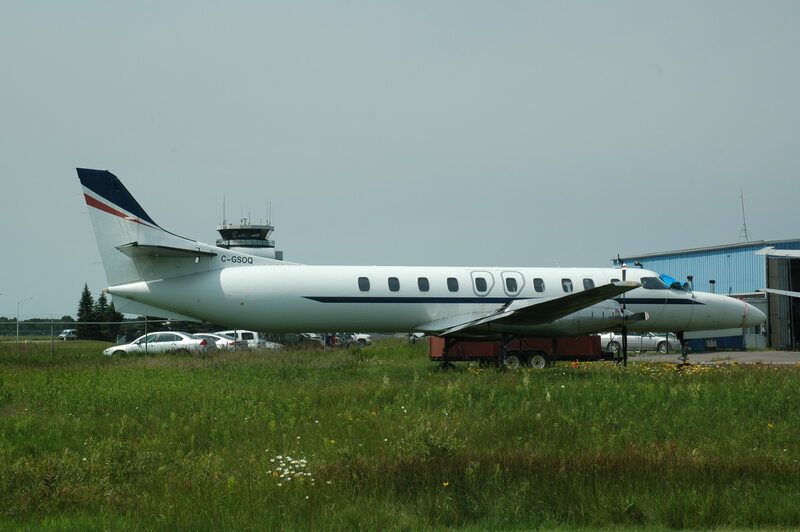 “SIJ” later had a string of Quebec operators from Airgava of Schefferville to Transfair of Sept- Iles, Para-Vision of St-Jérome and finally (in the 2000s) Aero-Dynamic of Mascouche. What in the world, eh! This super-modified Beech 18 had been RCAF 2301 in 1952-66, then became CF-URS with Joe Lucas’ Aircraft Industries of St. Jean, Quebec. This company had a dream of offering the old Expeditor –- so many of which were flooding the market –- in a revitalized form powered by Canada’s new PT6 turboprop engine. 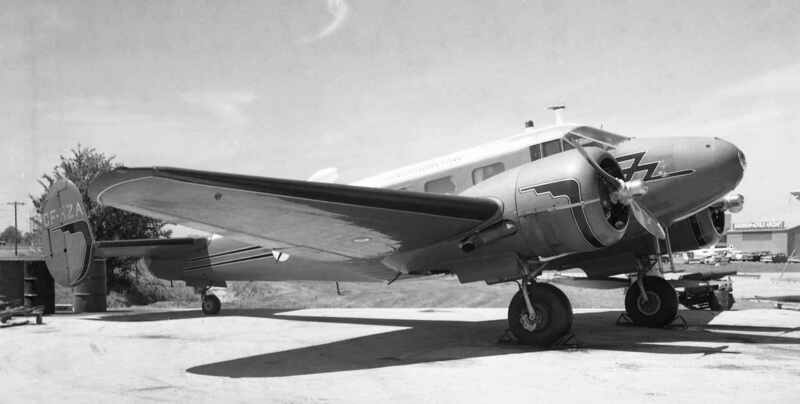 Although several US-made PT6 Beech 18 would follow, “URS” was the original. First flown with a pair of early PT6A-20s, “URS” was called the Jobmaster. Later, it was converted to Volmar tricycle undercarriage. 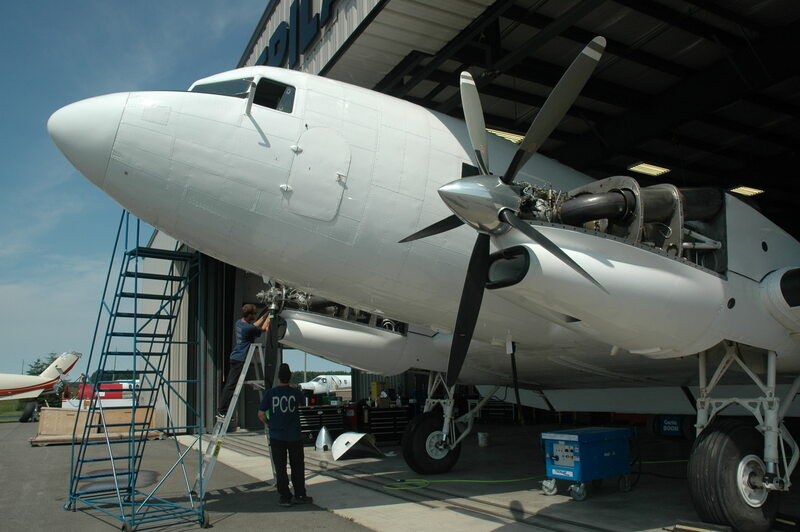 Aircraft Industries, meanwhile, folded its tent after many years as a Canadian leader in aircraft maintenance, repair and overhaul. “URL” migrated to the USA in 1970, becoming N10VT. It went into the air cargo business and, oddly, reverted to its tail wheel configuration. The Hamilton Aircraft Co. extended nose was added in 1976. 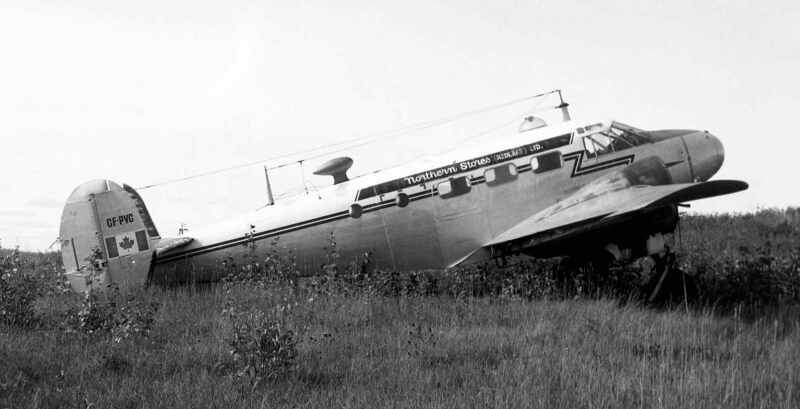 On June 19, 1978 N10VT (operating with Great Western Airlines) had an engine failure and crashed on nearing its destination of Windsor Locks, Connecticut from Albany, NY. The crew survived. The turbo-Beech 18 really was not a huge success. The mod cost a pile of money and the PT6 burned a lot more fuel than a Beech 18 with standard R985 engines. In this Joan Turner photo “URS” is at Hamilton, Ontario on September 7, 1968. Beech 18 N3199 owned by K&S Aircraft of Fort Lauderdale at Cape May, New Jersey on August 23, 1971. N3199 had begun as a wartime USAAF AT-7. The USAF had it remanufactured in 1952, then it became N3198G in 1959 with the Pittsburgh Institute of Aeronautics. It may have been converted to a tri-gear Beech in that period. In 1972 it became N106A and disappeared from the US Civil Aircraft Register in 1988. There were not that many tri-gear Beech 18s by comparison with the standard tail draggers. Another visible mod with N3199 is the 3-bladed props. Joan Turner always was happy to photograph anything with wings. This set her apart from (and above) those photographers who would boast “I only shoot Canadian civil” … or US military, or F-16s, or B-52s, or airliners. You get the idea. These latter would never know the enjoyment that Joan got in shooting homebuilts, Aeroncas, Bellancas, Cessna, Pipers, and – if the chance arose – a B-52. So the sight of a US civil Beech 18 was a pure opportunity. While Joan was revelling in Hamilton, Ohio at the Waco convention on June 29, 1980, she happily shot off a few frames on this E18S Super 18. N87HA had begun in 1956 as N3787B with Southern Airways. It joined Hogan Air in 1980, hence the new registration with an “HA”. In 2019 this historic Beech is N8711H in Puerto Rico with Seven Stars Air Cargo. As I was writing this on March 27, FlightAware noted that N8711H that day made a return flight from San Juan to Beef Island, logging 1 hour 16 minutes. 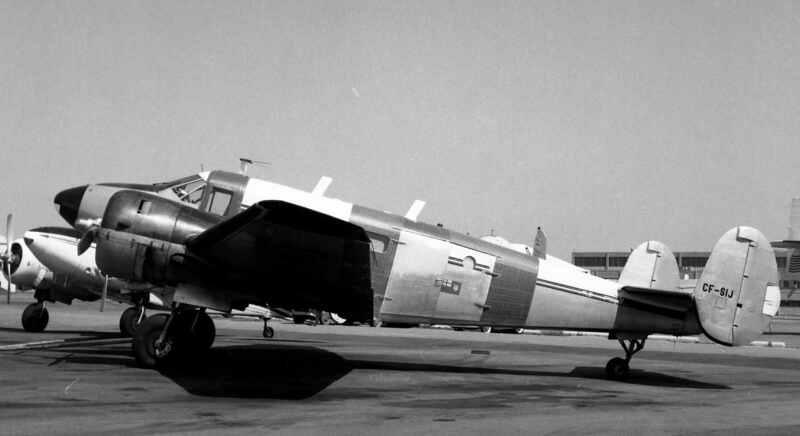 Another remanufactured wartime Beech, this example served the US military again from 1953. 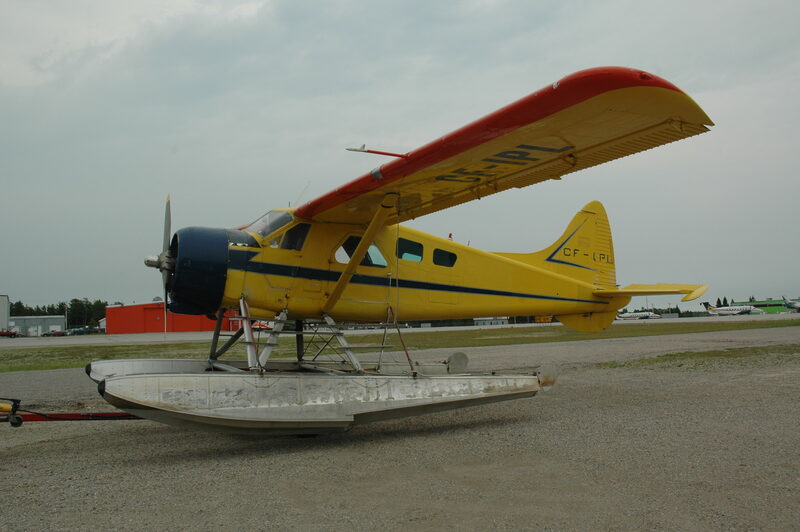 In 1960 it became N3734G then quickly came to Canada and was converted for aerial surveying by Spartan Air Services. I first photographed “MJY” at Kenora on September 6, 1961. Joan’s shot dates to Ottawa International Airport on September 9, 1973. Looks like a derelict Queen Air just beyond. You can see “MJY” today on display at the Canadian Bushplane Heritage in Sault Ste. Marie. Through the 1970s-80s ex-RCAF Expeditors could be spotted from coast to coast. Some went on to useful careers in civil aviation, but many eventually were parted out and scrapped. While visiting Rockcliffe airport in Ottawa on June 4, 1972, Joan spotted CF- ZYH and ‘YI. Here is “ZHY” still bearing RCAF serial 2302. Note the lovely Citroen Ds19 in the background. “ZYH” seems to have done no further flying, but “ZYI” was sold into the US in 1994, becoming N20R. It’s listed as struck off the USCAR in Mission, Texas in 1991. Former DoT Beech 18 CF-DTN was in Joe Kohut’s Capital Air Surveys markings when Joan saw it at Carp on August 22, 1970. Earlier, “DTN” had been RCAF 1500 (1951-1959). Following a contract somewhere in Africa, it ended in Scotland and today is G-BKRN over there, painted in US Navy colours (google Beech D-18S G-BKRN Naval Encounter). 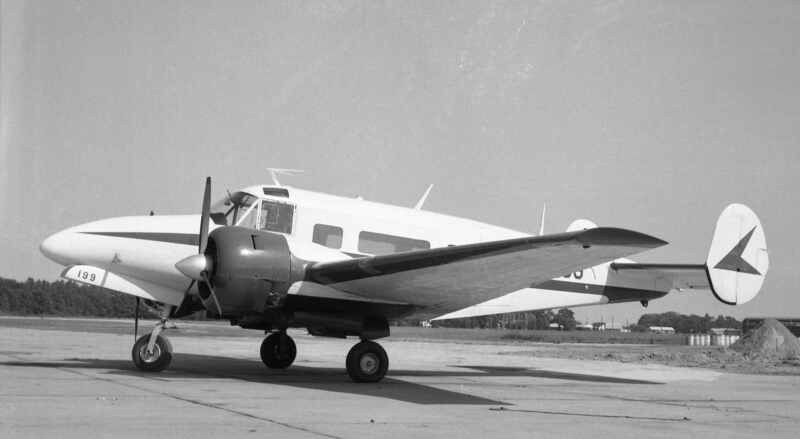 Another important Beech 18 operator in Canada was Bradley Air Services of Carp, Ontario – an airport a bit west of Ottawa. 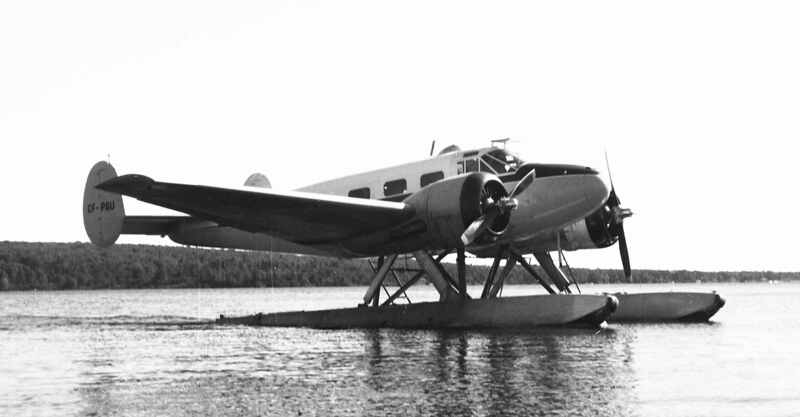 Bradley pioneered in the Arctic starting in the 1950s, then built up its fleet to include the DC-3, Twin Otter and HS748 (see Air Transport in Canada). Bradley eventually evolved into today’s First Air of Ottawa. Joan Turner saw CF-TAE at Carp on October 9, 1972. 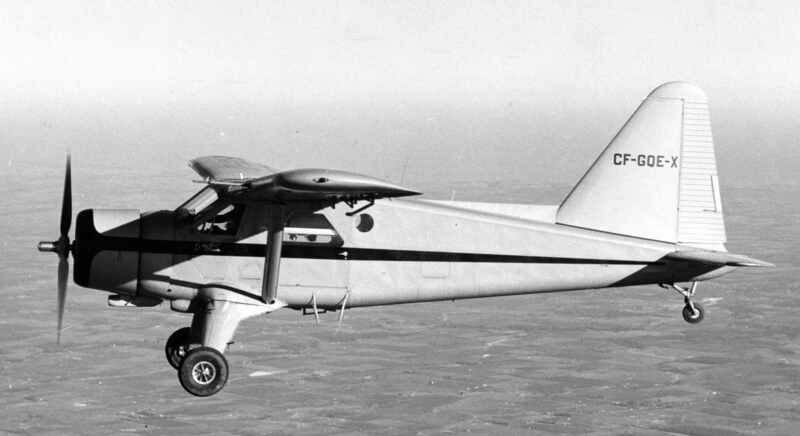 A G18S “Super 18”, “TAE” had come to Canada in 1960 for Transair of Winnipeg. It later served Bradley 1970-85, so would have had enough adventures to fill a book. In 1985 it joined Toronto-based Air 500, a small company set up by former Millardair pilot Dennis Chadala (author of Millardair and Me). Having been parted out due to wear and tear, “TAE” was struck from the CCAR in 1989. Being expert in the air photo business, Bradley made good use of the AT-11, the WWII US military bombardier/gunnery/navigation training version of the Beech 18/C-45. It acquired CF-KJI in 1957 and seems to have operated it for about a decade. Joan photographed it derelict at Carp on October 9, 1972. Even in the 2000s the bones of a Beech 18 sometimes still can be found moldering away. Joan photographed these ruins at Carp on August 22, 1970. You can see how the good old phrase “in the weeds” applies in this case. Not long after the RCAF declared its classic Canadair F-86 Sabres surplus in 1968, a large flock of them was bought up by civil operators. Most migrated to California, where they became target drones, chiefly for Flight Systems based at Mojave. Many of these eventually were shot down during “SAM” (surface-to-air-missile) development trials. Others ended with museums and warbird collectors, and even found work as chase planes. 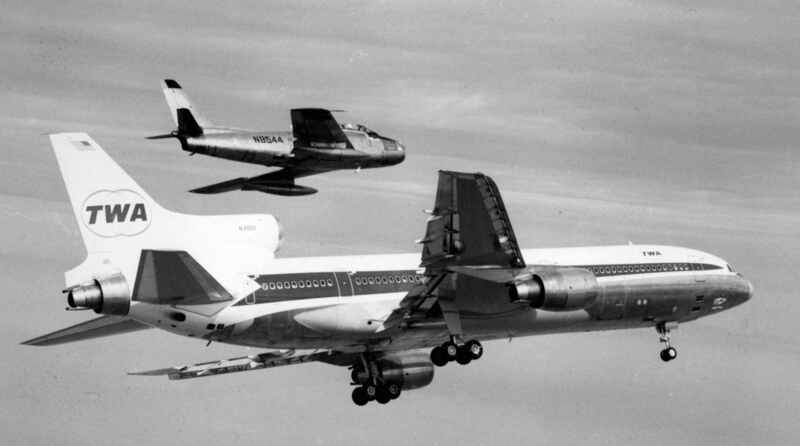 Boeing operated both the Canadair Sabre and Canadair T-33 as chase and photo planes during many airliner development programs from the 747 onward. Lockheed used an ex-RCAF Sabre chase plane during the L1011 program. Show here from the CANAV Books Collection is Boeing Sabre Mk.6 N8686F (ex-RCAF 23363) accompanying 747 prototype N7470. If this was on the first flight, the date was February 9, 1969. The 747 is hanging its gear, so the Sabre is using loads of flap plus speed brakes for low-speed control. Both these super-historic airplanes now reside with the Museum of Flight in Seattle. In the second photo, L1011 N31001 is accompanied by Sabre Mk.5 N8544 (ex-RCAF 23241). This was the second L1011 to fly (first flight February 15, 1971). It later served Eastern Airlines, then a list of other global air carriers. It was scrapped in Miami around Y2K. While on some sort of a mission from Mojave on March 23, 1986, N8544 was damaged and subsequently scrapped. Several ex-RCAF Sabres still fly as warbirds in the US. 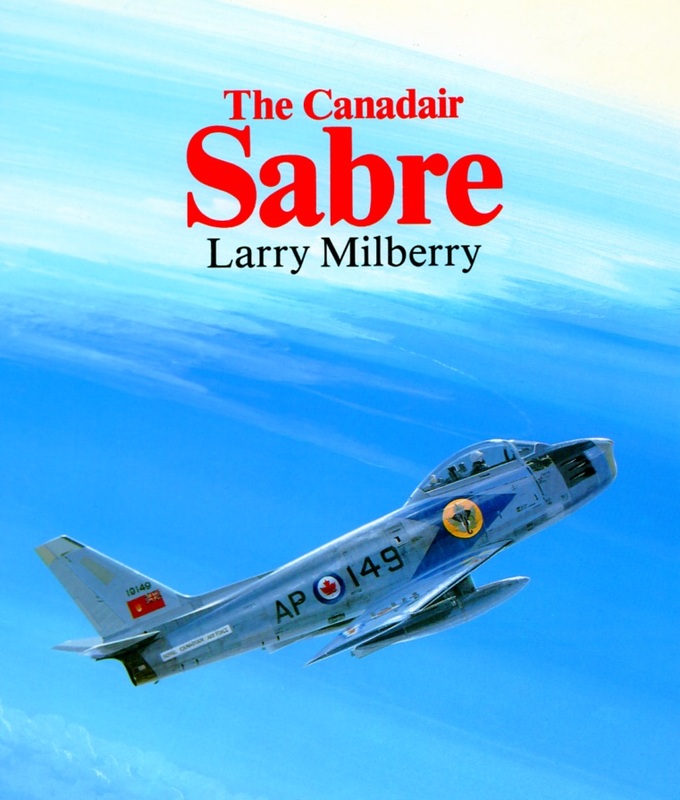 If you’d like an autographed copy of CANAV’s best-selling book, The Canadair Sabre, order using PayPal via larry@canavbooks.com The all-in price with this offer is $46.00. The Canadair Sabre often has been described (all things considered) as the best of the world’s many F-86 Sabre books. I still like what France’s prestigious “Air Fan” journal said about our book when it first appeared. To “Air Fan” The Canadair Sabre was “The aviation literary event of the year”. If you still don’t have a copy, you’ll thank yourself for ordering one today at the price of a few beers. Bob McCaw, one of the many solid Austin Airways people from post-WWII years, mentions two things regarding the blog. First … that Austin didn’t operate the Beech 18. 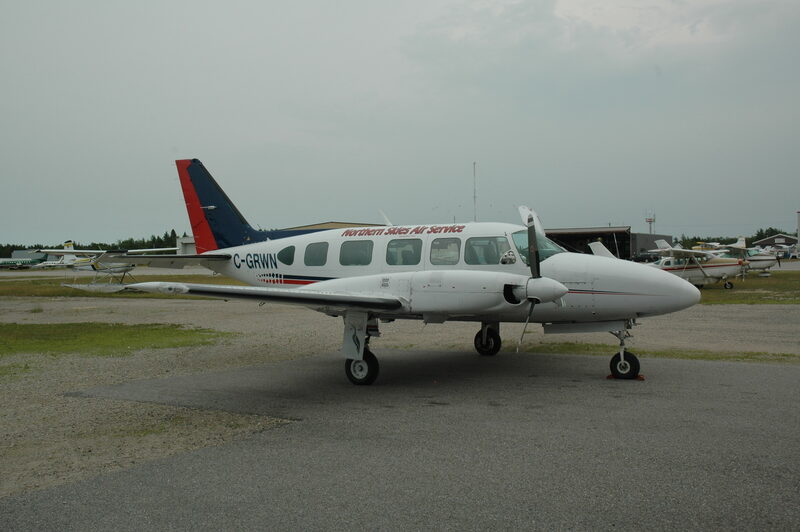 Second … that around the time Stan Deluce’s White River Air Service bought out Austin, White River was operating Beech E18S CF-ANA on a passenger sked between Timmins and Kapuskasing (it’s a hop, skip and a jump between these two centres). Before long, White River became the main contractor in the Ontario Government’s NorOntair, and the Twin Otter took over on all such routes. “ANA” served White River 1970-74, then flew with various operators from Laurentian Air Services of Ottawa to Skycraft of Oshawa. In 1993 it became N5847 with “One Way Ride” in Pennsylvania (let’s go flying with them eh!). Today it’s privately owned in Vacaville, California as N5867. Here’s a photo of “ANA” that I took Toronto YYZ on May 15, 1971. While in Air Niagara colours, it apparently was owned by the Port Colborne Flying Club, which in turn had it on lease to White River. 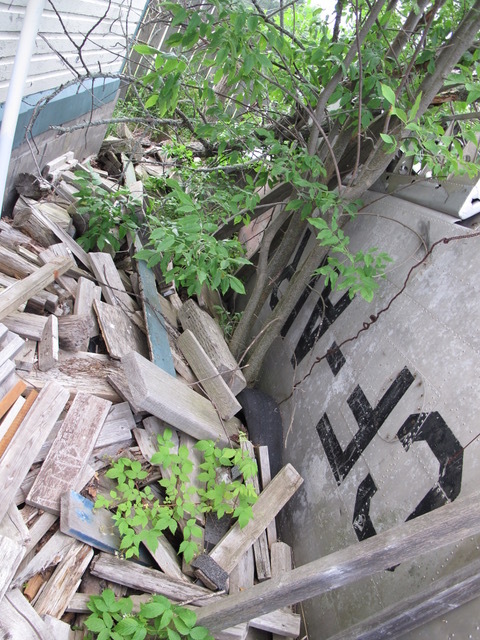 It’s not always easy to figure out such a plane’s historic details. 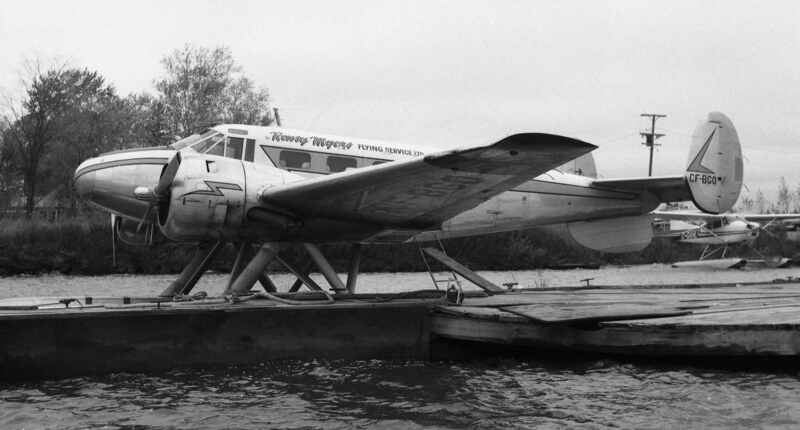 For example, in the Canadian Civil Aircraft Register 1970-74 “ANA” is listed as owned by White River. One of Canada’s leading aviation journalists and publishers was Robert G. Halford of Winnipeg. Having served in the Merchant Navy in WWII, Bob learned to fly, then was a cub reporter in Dryden in Northwest Ontario. 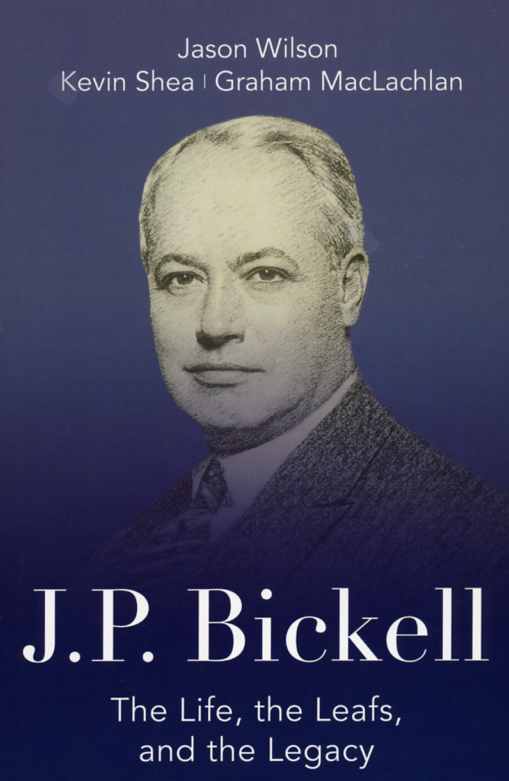 In the late 1940s he became a junior writer at “Aircraft and Airport” magazine in Toronto. 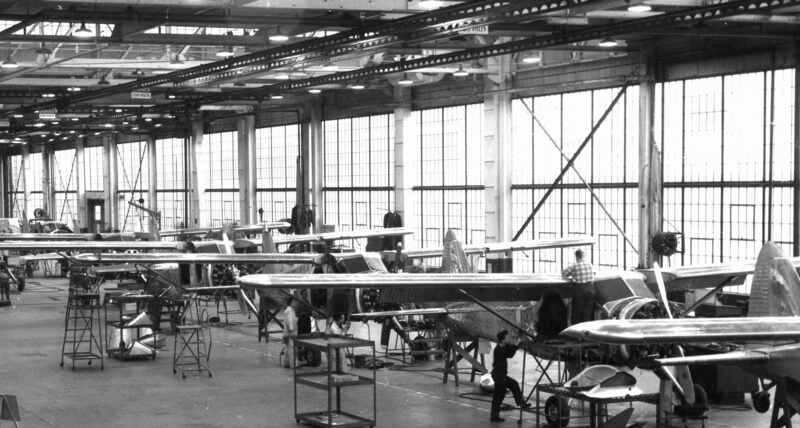 With wartime contracts cancelled and most employees laid off over the summer of 1945, de Havilland of Canada had to scurry to keep its doors open. The old pre-war Fox Moth was reintroduced, some Mosquitos were sold to Chaing Kai-Shek’s army fighting Mao Tse Tung, and some PBYs were civilianized. But something more future-oriented was needed. The solution was a new basic trainer to replace the old wartime Tiger Moth. This project became the DHC-1 Chipmunk. Shown is the beginning of Chipmunk production at DHC. The Chipmunk first flew on May 22, 1946. 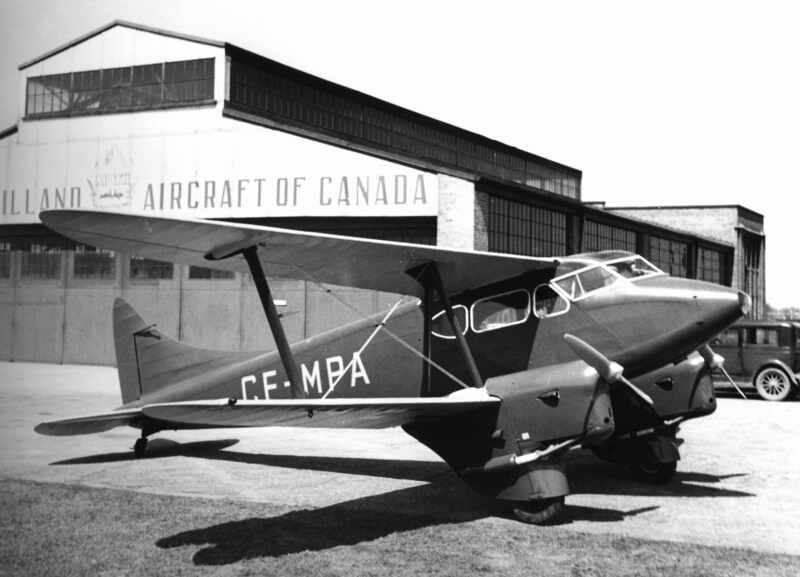 Details of this era are best found in Fred Hotson’s landmark book The De Havilland Canada Story (later revised as De Havilland in Canada). Copies can be found at http://www.abebooks.com … no kidding, you need this one. 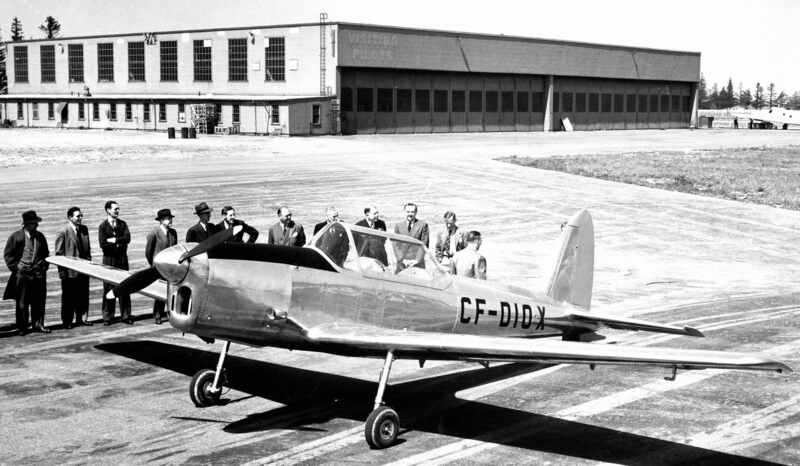 Sleak and shiny Chipmunk No.1 CF-DIO-X at Downsview in 1946 with a crowd of proud DHC fellows. A.F. “Sandy” MacDonald is 2 nd from the right, then are W.J. “Jaki” Jakimiuk, P.C. “Phil” Garratt and W.D. “Doug” Hunter. Chipmunk CF-FHY in the early years at DHC. Note how the canopy had changed from the squarish look to the bubble type. Most Canadian Chipmunks featured the bubble, while those built under licence in the UK, India, etc. had the squarish look. A pair of early Chipmunks on a bright winter’s day at Downsview. Then, a fine air-to-air shot of CF-CXB, part of a batch built for the Canadian Flying Clubs Association. Following the Chipmunk came the DHC-2 Beaver. 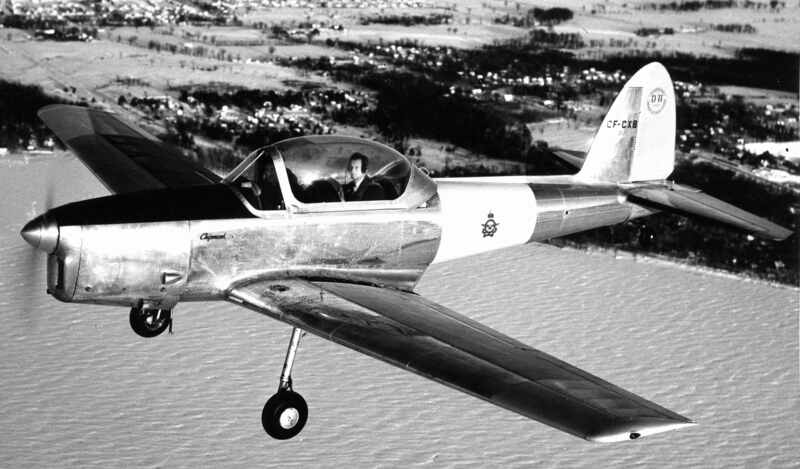 First flown on August 16, 1947 by Russ Bannock, the Beaver went on to global fame as one of the great bushplanes. I found this historic view of prototype CF-FHB-X in Bob’s DHC files. It was taken a few minutes before Russ fired up “FHB” on first flight day at Downsview. The crowd would have been anxious to see how “their baby” was going to fly! Where is “FHB” today? Thanks to the stalwart efforts of the very founder of the Canada Aviation and Space Museum, Ken Molson (nothing seems to work to get Ken inducted into Canada’s Aviation Hall of Fame) “FHB” today is a premier display at the CASM in Ottawa. The Halford files have endless surprises. For example, I only lately noticed this photo – “FHB” with an early Chipmunk. Beaver production gets under way. Some 1600 eventually would be built. 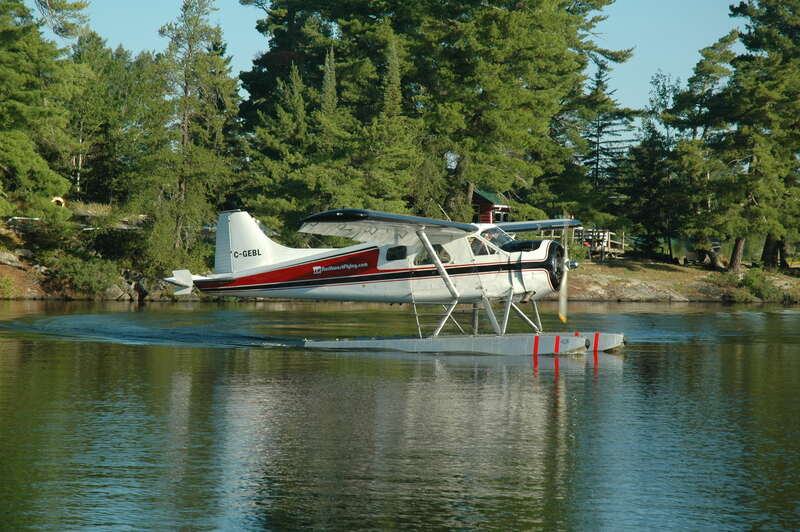 Beavers remain popular far and wide to this day and come in many versions compared to the “basic” old DHC-2. 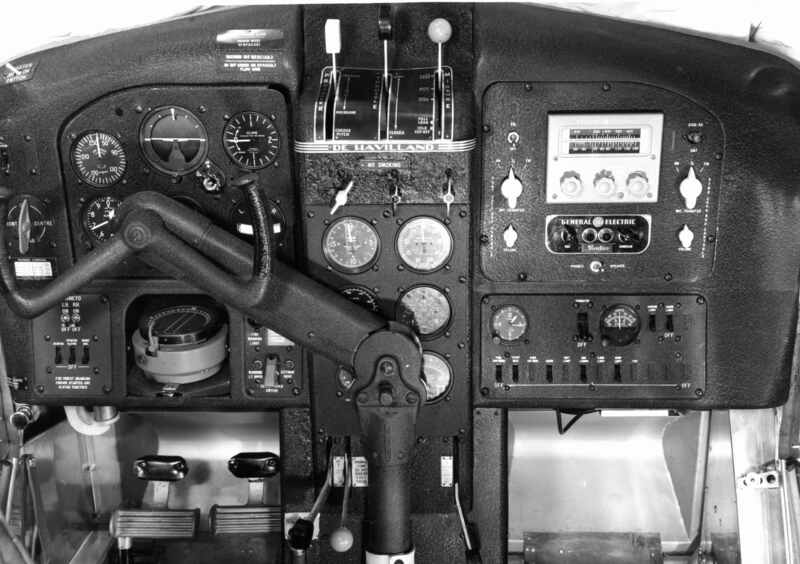 The standard Beaver cockpit set-up c1950. People around “de Hav” were known as a jolly bunch, who loved their jobs. Here’s a typical scene from early Beaver days. Test pilot Russ Bannock, “big boss” Phil Garratt, and some co-workers are getting a good laugh out of something. Russ was a famous WWII Mosquito ace, while Phil had been a WWI DH bomber pilot. 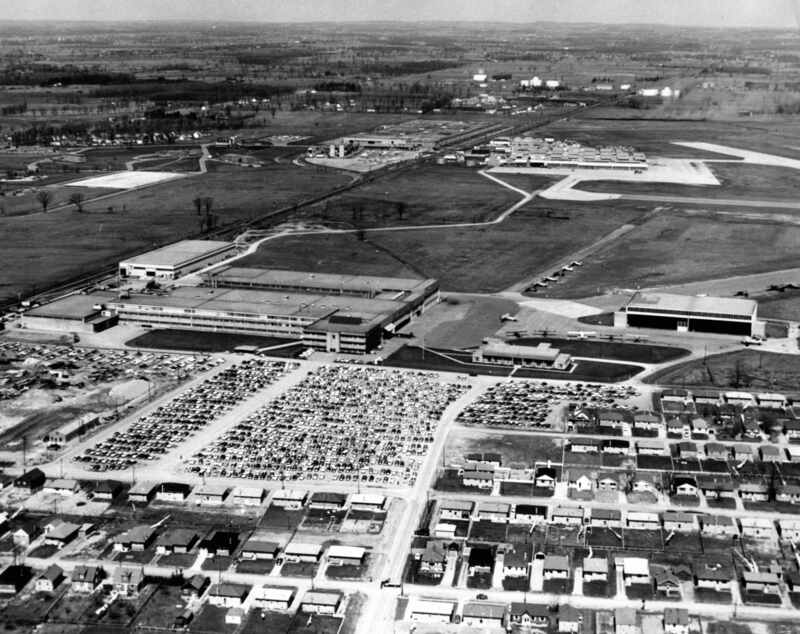 Here’s the “big picture” at DHC in the early 1950s. We’re looking north. At the bottom is some of the new housing spurred on by jobs at DHC. Notice the tightly-packed parking lot – things were hopping. You can see the big new post-war DHC factory in the middle ground. Across the field are the wartime hangars where the Mosquito was built. See the twin white towers to the left of there? 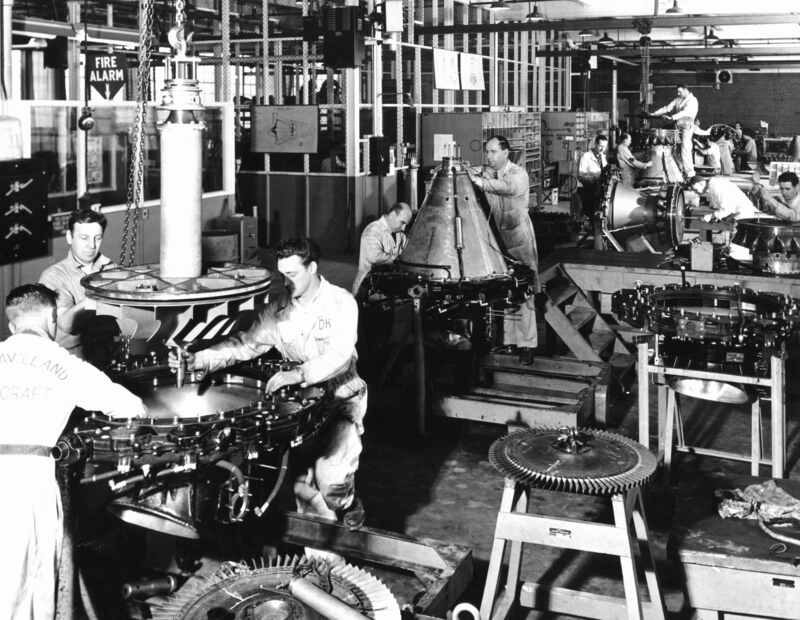 Those were newly-erected jet engine test cells needed to support DHC’s contracts overhauling jet engines for the RCAF. These solid concrete structures still stand as artifacts of a forgotten era. Much of the land in the mid-part of this scene today comprises Downsview Park. New production bays have been added over the decades. Today, these turn out Bombardier Q400s and bizjets. Here’s a lovely 1951 Beaver pose: Serial No. 19 CF-FHF purring over Toronto Bay with the city’s iconic islands below. Soon “FHF” was delivered to the BC Pulp and Paper Co. Sadly, it would crash disastrously in Labrador in 1996. As often happens with wrecks, however, it was recovered, rebuilt, and flies to this day back on the BC coast. 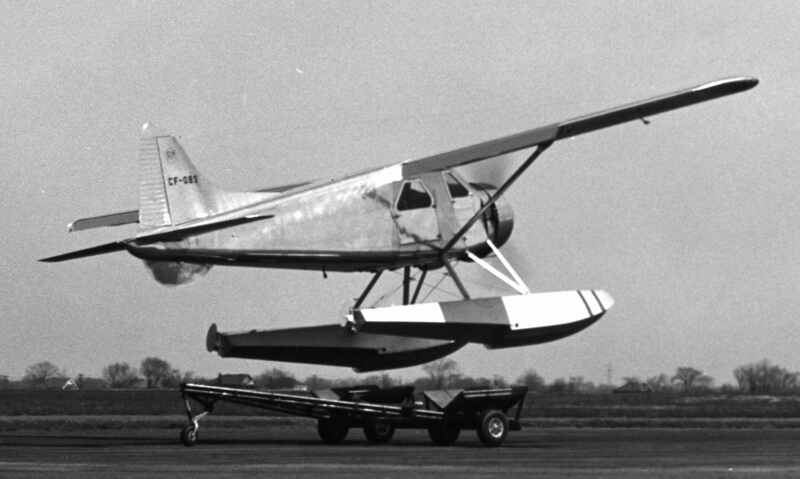 There were many Beaver R&D projects, including CF-GQE with its ungainly empennage. This was the prototype for the Beaver with a 550-hp Alvis Leonides engine (vs the standard 450-hp P&W R985). After years in the UK, “GQE” served on missionary duties in South America. 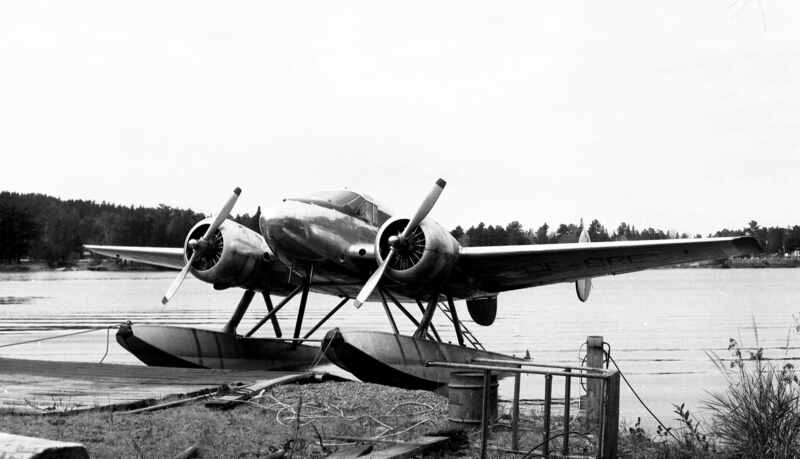 It later had a Polish PZL engine. In the 2010s it was in Saskatchewan as C-GHGN. Really … Beavers do have their stories to tell. Happily, these are beautifully covered on Neil Aird’s website dhc-2.com … make a point to visit! Fred Hotson writes hilariously about efforts one day to launch a Beaver from a makeshift dolly. But dolly takeoffs soon became common. Here, the Ontario government’s CF-OBS (Serial No.2) “has a go” at Downsview. “OBS” today resides in the Bush Plane Heritage Museum at Sault Ste. Marie. Beavers quickly were at work around the world, whether as US Army L-20s doing air ambulance work in Korea, spraying the dreaded spruce budworm in New Brunswick, or as “ag” planes dropping fertilizer on sheep grazing lands in New Zealand. Fieldair’s ZK-CKC had begun as a 1956 US Army L-20, then reached New Zealand in 1964 to do ag work. It was wrecked in a 1968 prang. ZK-CLP (beyond) had also been a military L-20. It was destroyed by fire in a 1969 ag accident. Beaver No.500 at Downsview in May 1962. It may read “For Export” on the side, but No.500 became CF-MAA with the Manitoba government. Today it resides with the (presently dormant) aviation museum in Winnipeg. 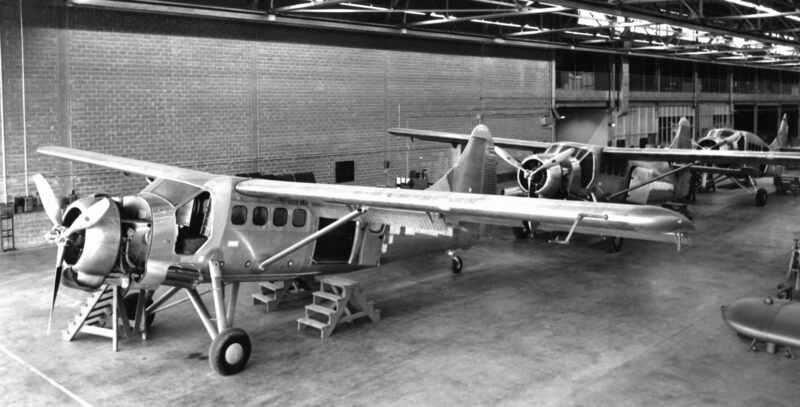 DHC-3 Otter prototype CF-DYK-X ready at Downsview for its first flight on December 12, 1951. The great test pilot, George Neal, did the honours that day. What could possibly go wrong? Nothing did. Note DYK’s small vertical tail. This quickly was redesigned to give a lot more area. “DYK” later was RCAF 3667 used for some exotic flight test programs at DHC. From 1965 it was CF-SKX for further trials, then was sold to Lamb Airways in 1969. While with Laurentian Air Service, on May 1, 1970 both wings came off “SKX” during a fatal test flight from Ottawa. 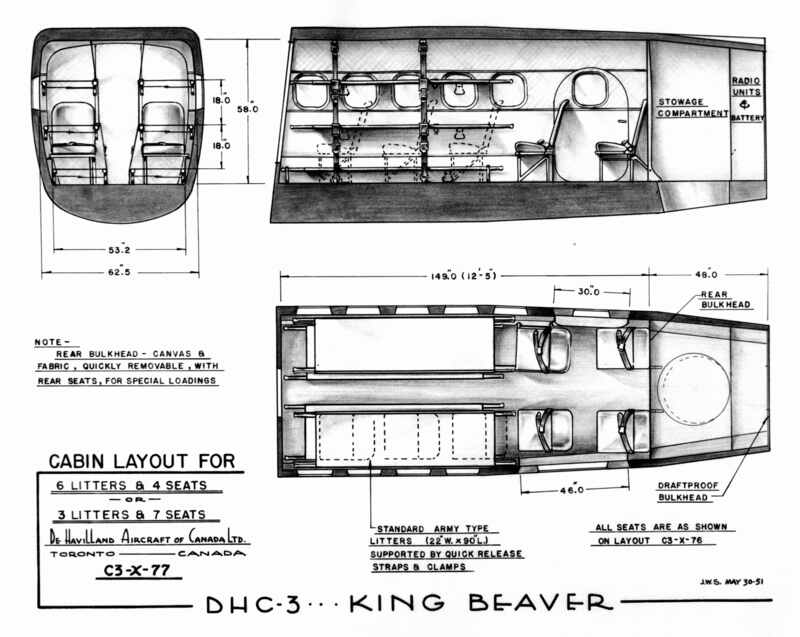 Even by May 1951 DHC still was referring to the Otter by its original name — King Beaver. This diagram shows it configured for aero medical evacuation. One of many US Army U-1A Otters from the 1950s. 55-3290 shows how it could carry a ready-to-fight squad. U-1As served in many theatres and were (along with L-20s) prominent in the Vietnam War. 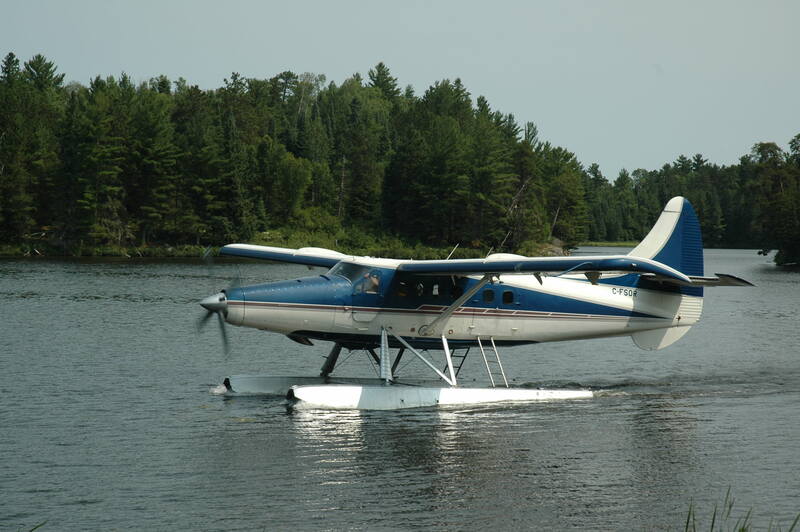 “3290” eventually ended back in Canada – at Kenora on Lake-of-the-Wood as C- GCQK with a 1000-hp PZL engine. In 2004 it migrated to Alaska to work as N560TR. By that time it had logged more than 15,000 flying hours. Otter No.45 at Downsview on wheel/skies in 1954 ready for delivery. RCAF 3654 would have a short life. While on a supply run on the Labrador coast on December 15, 1956, it cracked up on landing. The damage was severe, so 3654 was “written off” as a dead loss. Otters would serve on every continent. PAL Otters PI-C51 and C-52 were welcomed when they reach the Philippines in 1955 to serve remote communities. The great Otter aficionado Karl Hayes explains, “The benefits of these Otter services were clear. The land journey from Gingoog to Buenavista took five hours by car and cost 40 pesos. The Otter took 20 minutes and the fare was 9 pesos. Bislig to Davao was a 50 minute Otter flight – the alternative was a week on a coastal freighter, which sailed once a month. North from Lianga, the flight to Buenavista took 30 minutes by Otter and there was no land communication except a three-day foot trail.” On June 21, 1957 PI-C52 had to make a forced landing on a road due to engine failure. Both wings were torn off in the attempt, C52 was a complete loss, but all eight aboard were OK. Sadly, on May 20, 1954 PI-C51 crashed, killing all 11 aboard. Many Otter mods were devised over the decades. Today, most Otters use turbine engines, mainly the PT6 or Garrett. The first such conversion was done in the 1970s by Ray Cox of Edmonton. The Halford Collection includes this lovely air-to-air photo of his prototype C-FMES-X. Originally (1961) with McMurray Air Services, “MES” next served Gateway Aviation, which crashed it badly near Cambridge Bay in 1973. Cox bought the wreck, repaired it and installed a PT6-27 to prove his brilliant idea that the turbine engine was the way to the Otter’s future. “MES” later was N4247A, when Cox moved to Seattle. On December 19, 1984 it crashed near Boeing Field. There were no injuries, but Cox then was forced to leave his vision behind. Others soon picked up on his PT6 idea and the “DHC-3T” now rules Otter skies. Here are a few miscellaneous DHC photos from my Halford files. This of CF-AGL is a rare one (aviation fans just love oddball conversions, right). 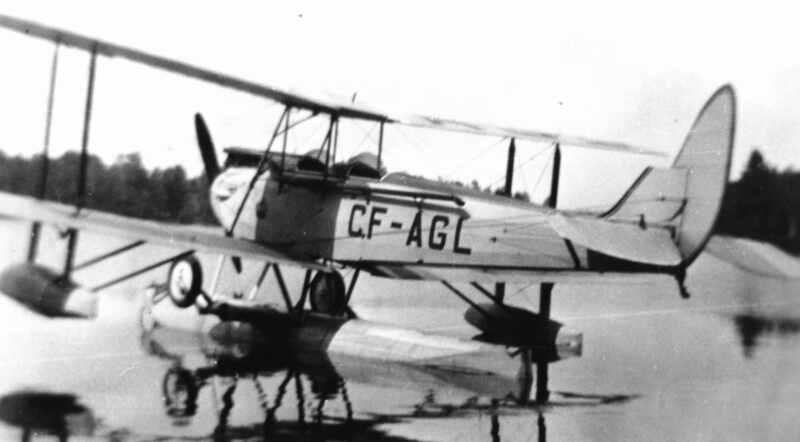 In 1930 DHC executive Phil Garratt had this Gipsy Moth modified so he could more conveniently make the flight to his Muskoka summer cottage from Downsview. 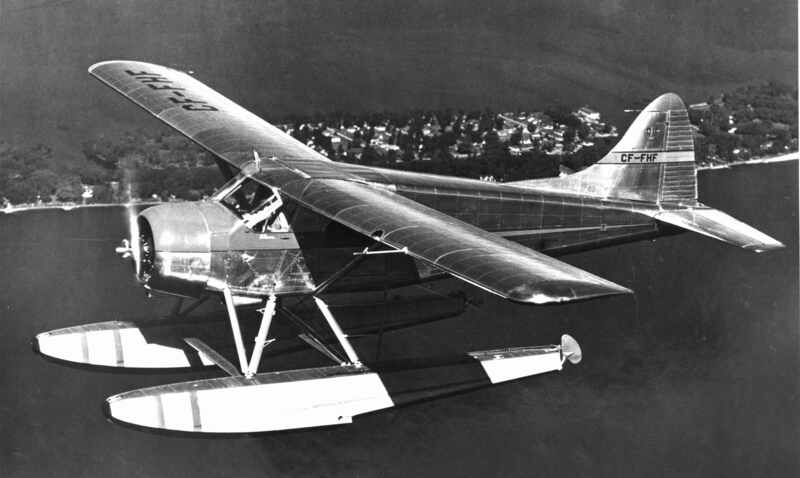 “AGL” simply was mounted to a centerline float and used underwing sponsons for stability on the water. 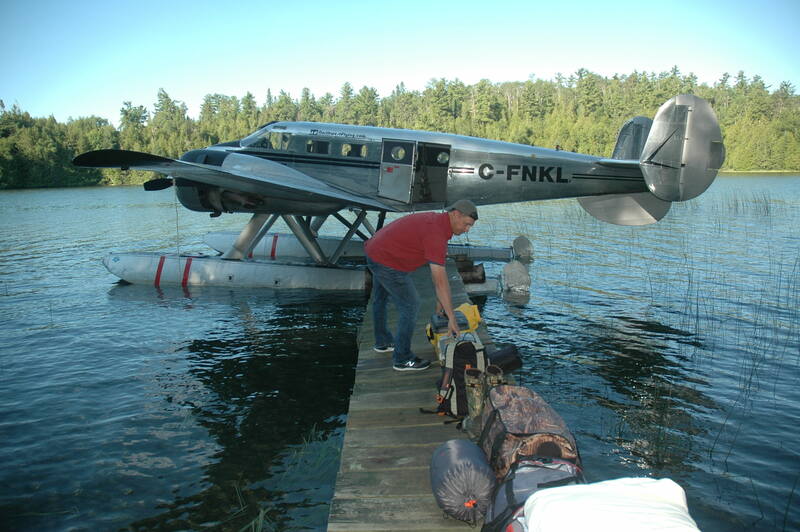 Now, Garratt could take off from Downsview on wheels and land on the lake at his cottage. Later that year “AGL” was sold in Newfoundland. While on a 1932 flight, it disappeared forever. 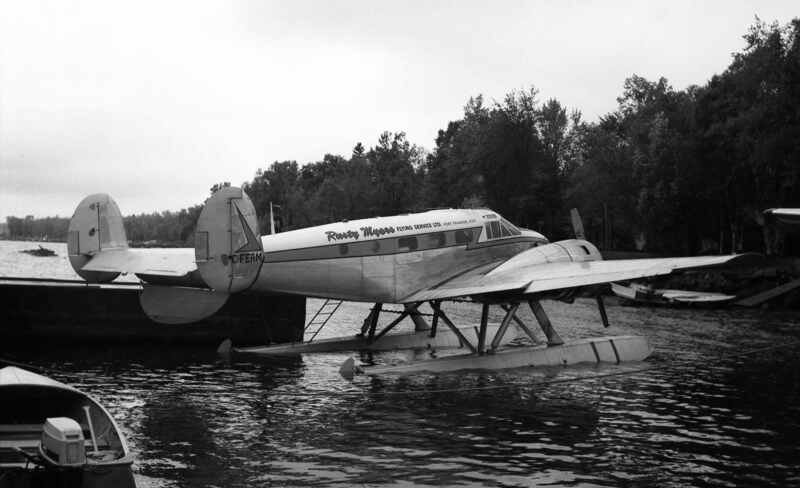 In later years, DHC provided Garratt with Beaver No.1000 CF-PCG, which he flew for years on his Downsview-Muskoka cottage get-aways. Even in tough Depression times, DHC kept its doors open. One profitable sale was of several D.H. 90 Dragonflies to the RCMP. This was the beginning of the now-famous RCMP Air Division. 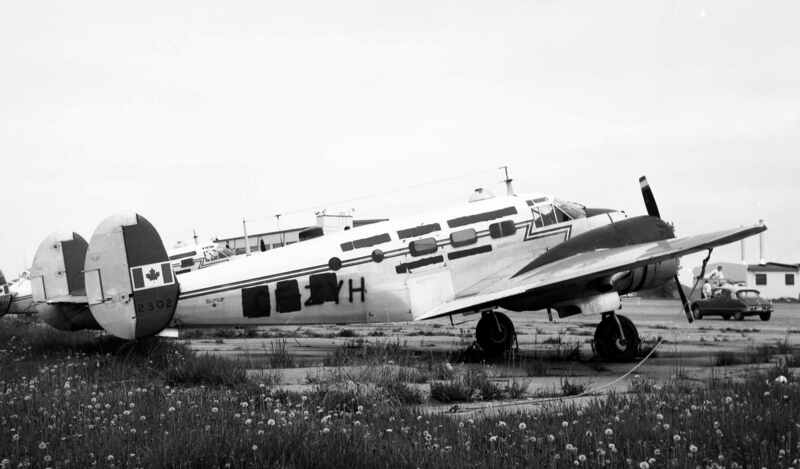 Here is the first aircraft awaiting delivery at Downsview in 1937. 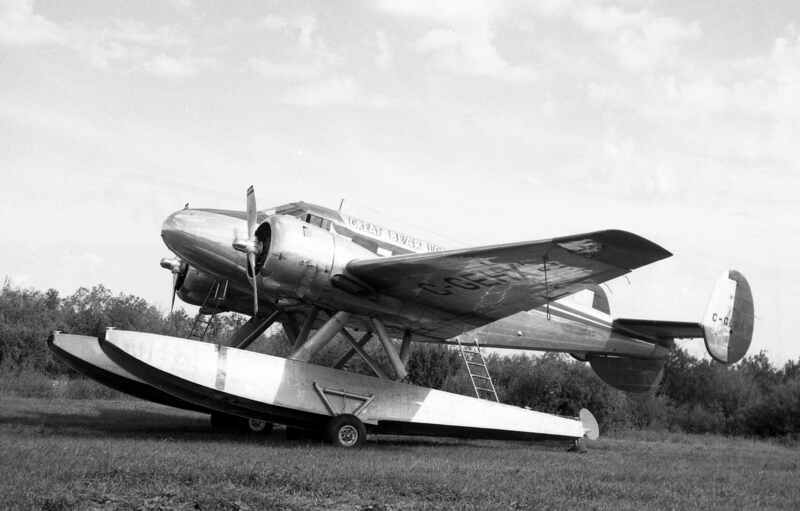 CF-MPA served into late 1942, then went for scrap. 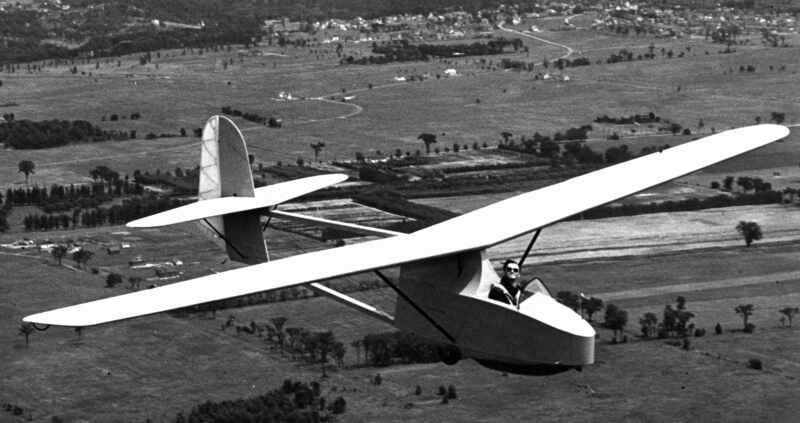 The Sparrow glider was designed and built during the war by members of the DHC gliding club. Members included W.J. 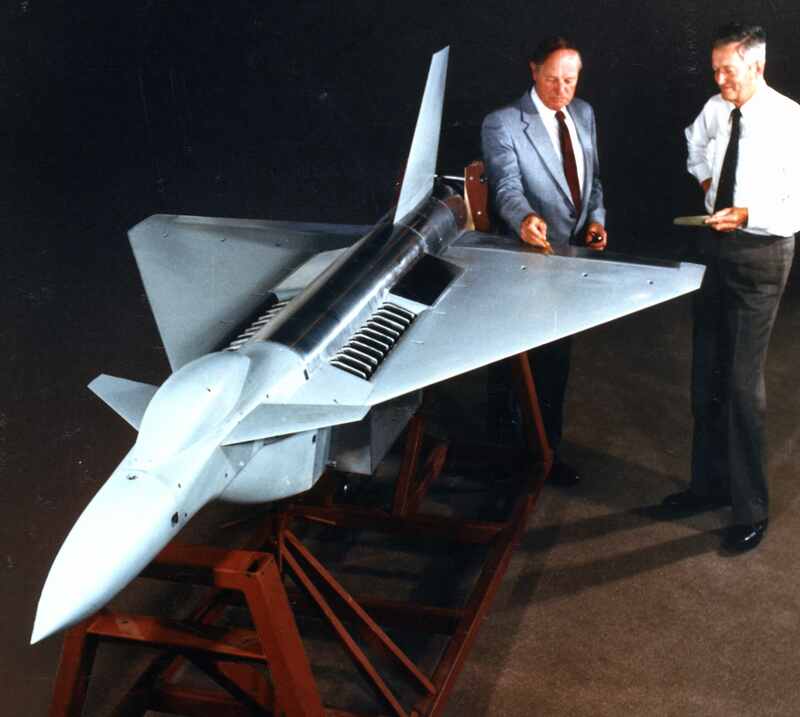 Jakimiuk, who later headed the Chipmunk design team; and Walter Czerwinski, who would create the project-saving fix when a grave design flaw arose with the CF-100 wing-to-fuselage attachment. As so well told in Fred Hotson’s book, DHC was swamped with work through WWII. Tiger Moths were mass-produced for the wartime air training plan, then a Mosquito line was established. Meanwhile, much overhaul work was completed. When the war ended, all this came to a screeching halt. To keep something going, the last few Mosquitos were completed while, behind the scenes in Ottawa, a deal was made with Chaing Kai-Shek for about 200 Downsview-made “Mossies” (mainly RCAF aircraft in postwar storage). 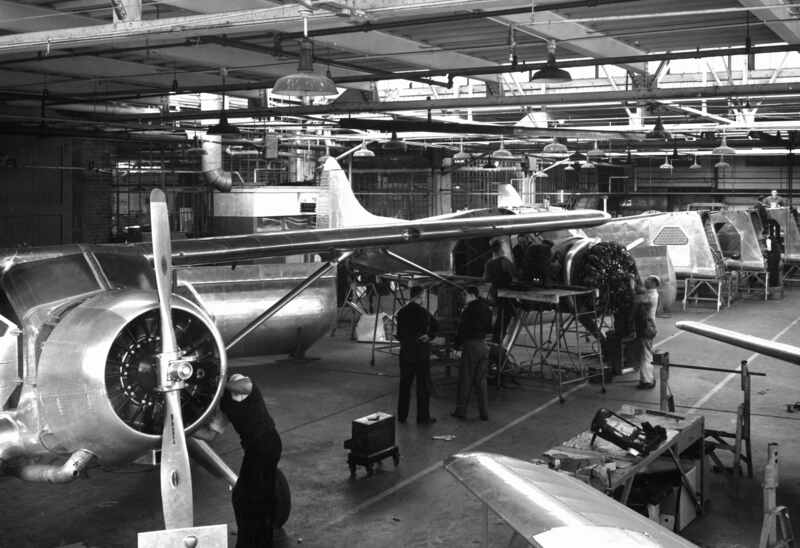 This rare view shows the last of the DHC Mossies being completed. Beyond, you can see some war surplus PBYs being converted for commercial operators. This “busy work” served its purpose until DHC could find its way in the new peacetime economy. Also in this period, DHC took the ancient D.H.83 Fox Moth, engineered a few improvements, and offered it to commercial operators. 54 were sold, mainly to Canadian bush operators, but a few were exported as far away as India and Pakistan. Using a bank loan, a young Max Ward purchased a new Fox Moth, set up in Yellowknife, then went on to build Wardair into a respected global airline with 747s. 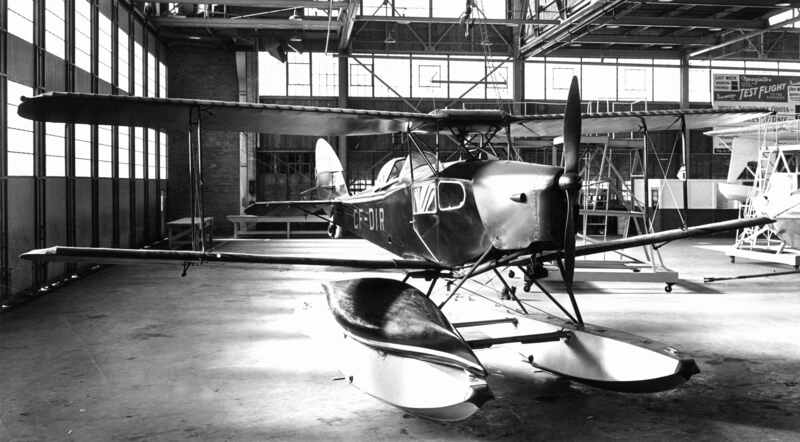 Shown at DHC in August 1946 is postwar Fox Moth CF-DIR. Within a year it was with Nalanda Airways in India. In 1946 the RCAF acquired its first jets – two Meteors and a Vampire. It then ordered 85 Vampires — its first operational jet fighters. These were assembled at Downsview and, later, went back and forth there for overhaul (D.H. Ghost engines included). Shown at Edmonton is TG372 — the first Vampire in Canada. TG372 remains in storage at the Canada Aviation and Space Museum. Its experience with the Vampire engine likely helped DHC win major overhaul contracts involving the GE J-47 and Orenda series engines used by the RCAF. A busy scene in the DHC engine shop. These look like D.H. Goblins used in the Vampire. For this little-known DHC story see Fred Hotson’s book pages 141-143. Last year’s Northwestern Ontario travels took me to Thunder Bay, Sioux Lookout, Lake-of- the-Woods and, finally, Red Lake. It all really came together with support from Porter Airlines, Bearskin Airlines, Rich Hulina, Northwest Flying Inc, Red Lake Airport, the Sinkowskis and others. The following photo album completes my brief coverage of this busy and productive aviation history-gathering pilgrimage. 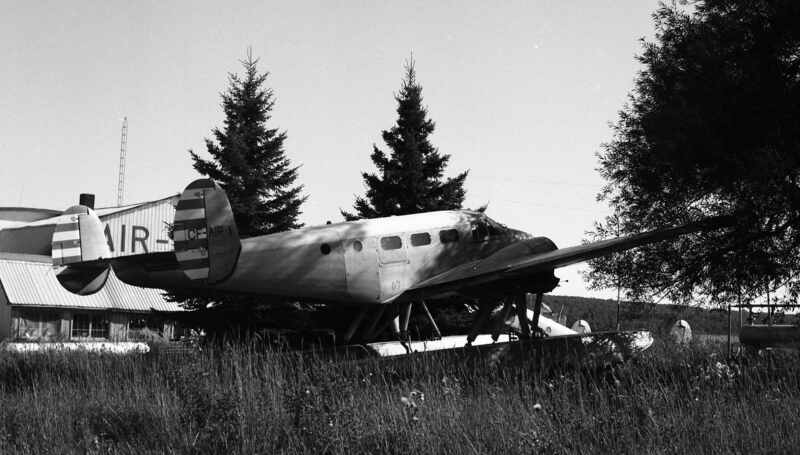 Having begun on July 19 with a Porter Airlines flight from Toronto to the Lakehead, then on later in the day to Sioux Lookout on Bearskin, I overnighted at the Hulinas. Next day Rich and I enjoyed flights in his Cessna 206 and one of Northwest’s spiffy Beech 18s. Back in Sioux Lookout that afternoon, I connected with Bearskin again for the half- hour hop over to the historic gold mining town of Red Lake. Speeding along in Bearskin Metro C-GJVW and watching the great Canadian Shield rolling out below, got me thinking of the pioneers confronting this massive Canadian region, the first aviators included. 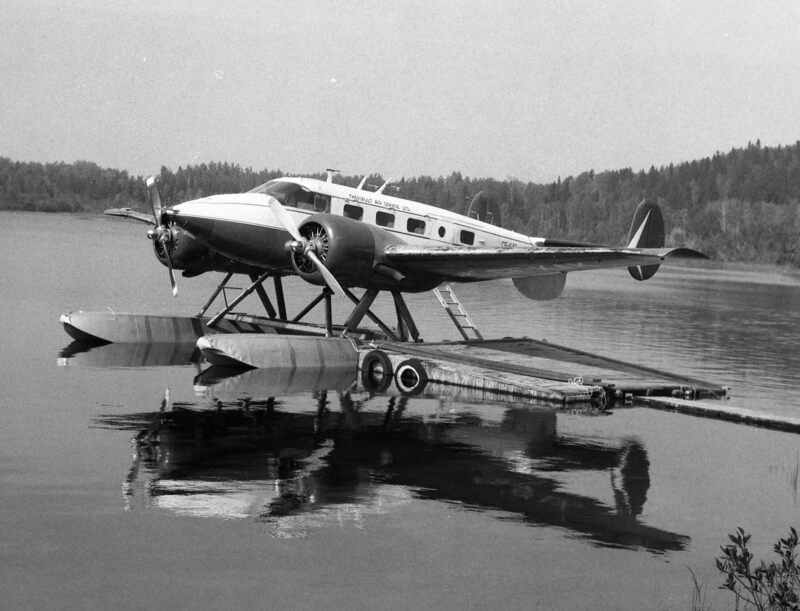 As early as 1925 some Ontario Provincial Air Service Curtiss HS-2L flying boats operating from Kenora, carried men and supplies into what soon would become the Red Lake mining district. When news of a strike leaked out, the Red Lake gold rush was on. Over the winter of 1925-26 the first few airplanes were serving the region, mainly from the railroad town of Hudson, near Sioux Lookout. A couple of war surplus Curtiss JN-4s, an impressive little Curtiss Lark and the first new Fokker Universals soon were transporting men and supplies into the area, so that the prospecting could begin. The first claims were staked, then, beginning with “The Howey”, the mines started producing in 1930. None of it could have happened without the airplane and those stalwart pioneer aviators – Jack Elliott, “Doc” Oaks, J.R. Ross, etc. As our Metro started its decent, I also thought of my own dad, Basil Emerson Milberry (1901-1948), who had done his bit around here, starting in the gold rush era and finishing at the Uchi Mine, before moving c.1935 across to the Kirkland Lake and South Porcupine gold mining camps. His name still appears on Kenora District claims maps. History, eh … we live it and we love it. Ruth W. Russell has written a history of the Red Lake gold rushes. Pick up a copy — North for Gold: The Red Lake Gold Rush of 1926. Also, see if you can find copies of the late Donald F. Parrott’s Red Lake books – The Gold Mines of Red Lake, etc. 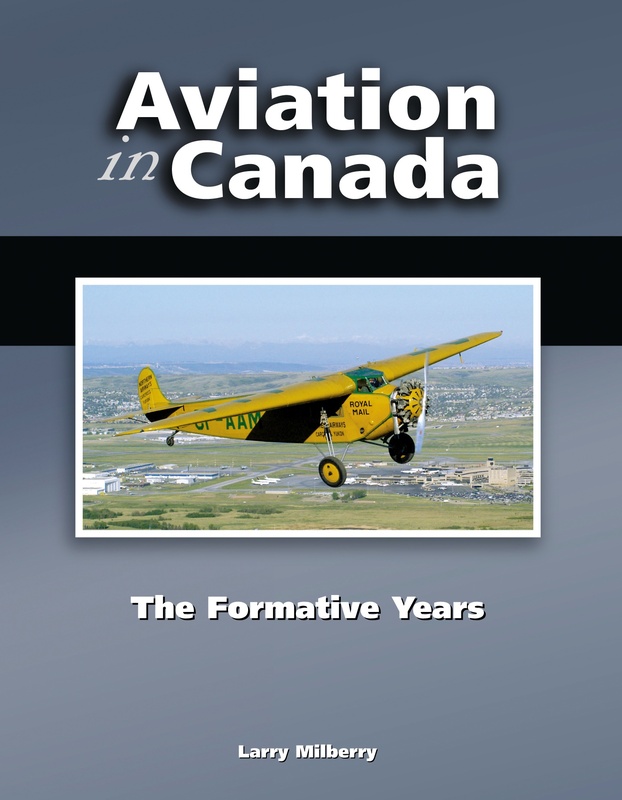 As to the general aviation history of the region, you can’t do better than with Air Transport in Canada and Aviation in Canada: The Formative Years. When the usually noisy Metro cabin suddenly got quieter and the flaps and gear came down, I returned to the present and soon was stepping off Bearskin at the Red Lake terminal. Meeting me was Joe Sinkowski, who was keen to provide a quick airport run-around. A long- serving bush pilot, in his “retirement” Joe’s on the airport staff doing a host of interesting jobs. He had taken me on my first Norseman flight back in 1995. Today, he introduced me to some of the local operators and for the next three days I had great fun photographing around Red Lake airport — a.k.a. “YRL”. Red Lake is one of the great Canadian (and global) gold mining centres. Flying over in the summer of 1995 in a Green Airways PZL Otter, I took this photo that has Red Lake written all over it. On the same flight, I snapped this view of Red Lake Airport. Pretty well at the centre, that looks like a Beech 99 at the terminal. This old building has been replaced by today’s modern one. Near the bottom, you can spot an Apache and an Aztec, two of the standard types serving the area (they’ve all but disappeared, even the Beech 99 has faded). Notice the big yellow MNR Canadair water bomber sitting on forest fire standby. 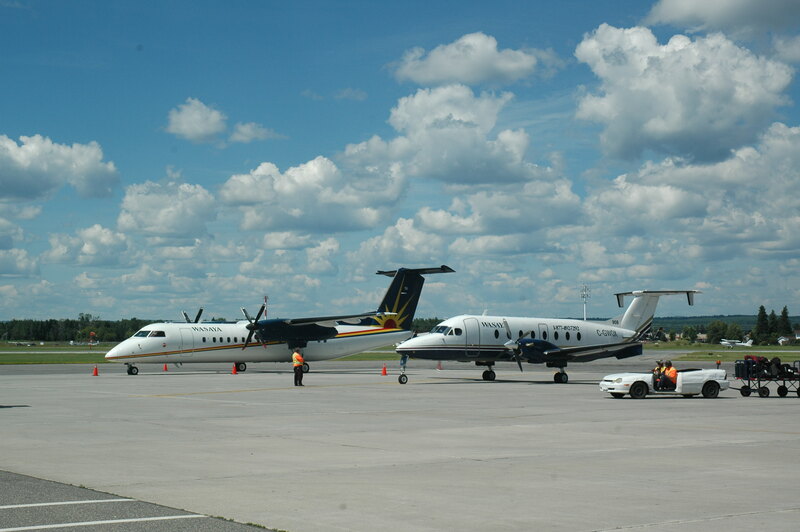 The daily scene at YRL terminal includes several arrivals by the ubiquitous Bearskin Airlines Metro. Shown on July 22 is C-GJVH. Built in 1996 and operated with Merlin Airways for a number of years as N898ML, “JVH” has been in the Bearskin fleet since May 2007. Bearskin belongs to the Exchange Income Corporation of Winnipeg. EIC’s other aviation holdings include Calmair, Custom Helicopters, Keewatin Air, Perimeter Aviation and Provincial Aerospace. 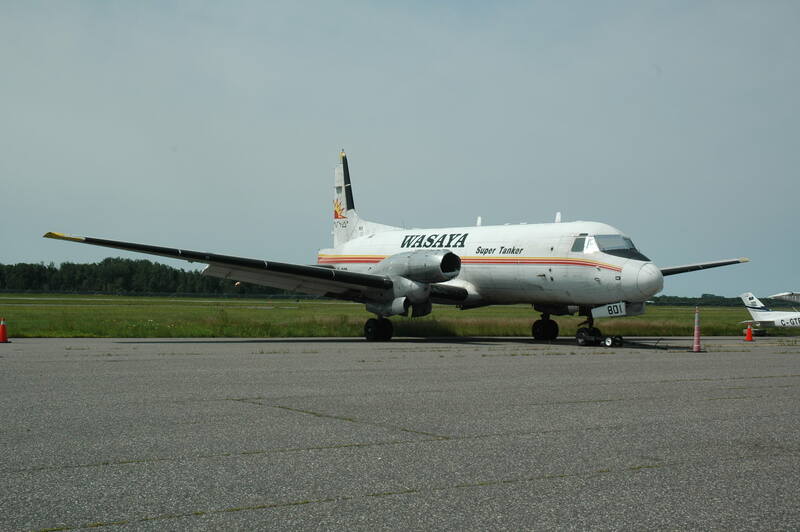 Just today (April 20) comes news that EIC has added Bearskin’s traditional competition in Northwest Ontario — Wasaya Airlines. On the right in the top photo sits Norseman CF-LZO, which has graced the terminal for several years. 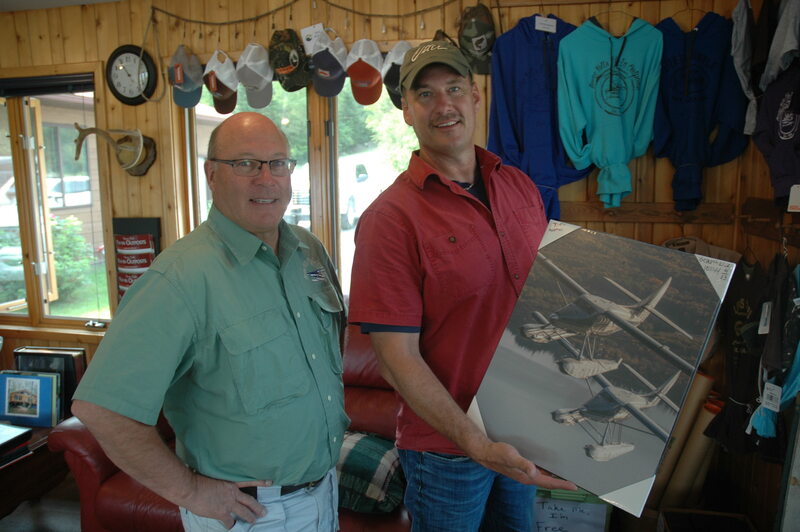 For any visitor to Red Lake airport there’s no shortage of subject matter on a typical day. What’s common to see for the locals will be exciting for the out-of- town “plane spotter”. Let’s start with the DC-3, a plane that’s no stranger to Northwest Ontario, except that today’s DC-3 is vastly different from yesterday’s. Now known as the Basler BT-67, it’s powered by PT6 turbine engines. 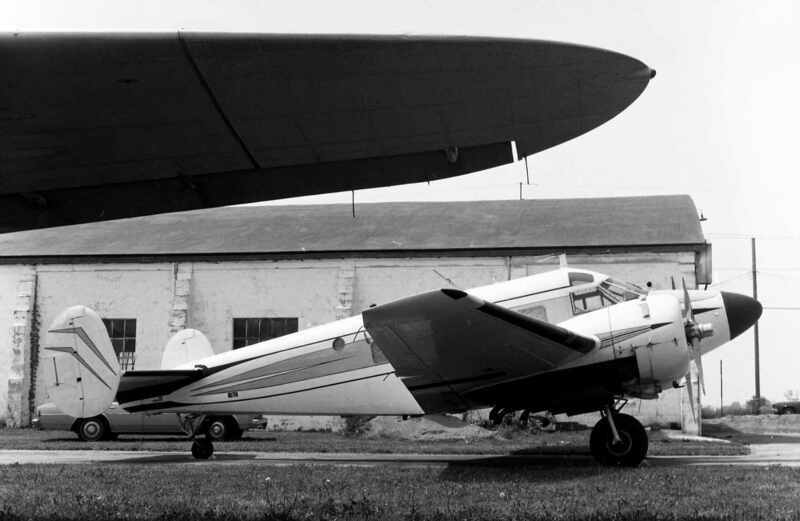 It carries pretty well twice the payload of a standard DC-3, so is much more efficient and profitabler by comparison. 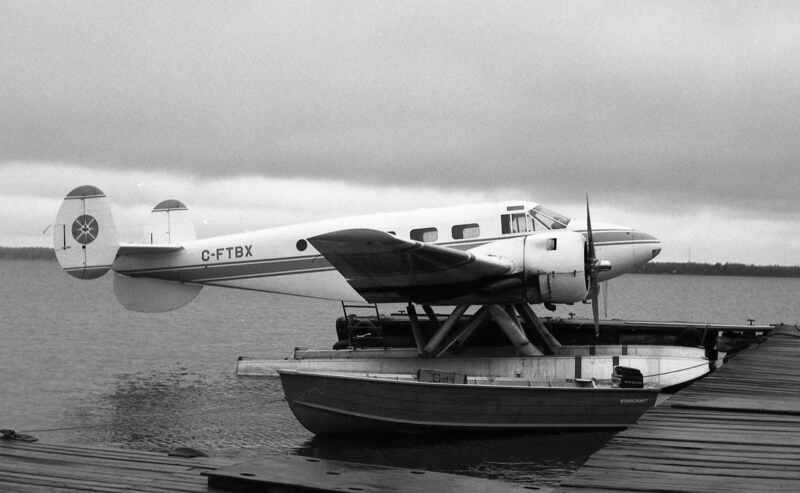 Shown is one of the Baslers brought to Canada by Frank Kelner of Caravan and PC-12 fame. Initially, he operated under the Cargo North and North Star banners, but has sold this part of his operation to the Northwest Company of Winnipeg. Shown at Red Lake on July 21 is C-FKGL. Notice the extra wide doors. Even that bulky motorboat got squeezed in. When you watch an operation like this you might wonder about all the babble about bush flying being so “romantic”. Mostly it’s simply about hard, grubby work done by a tough bunch guys and gals who can take the worst of it and keep showing up day after day. 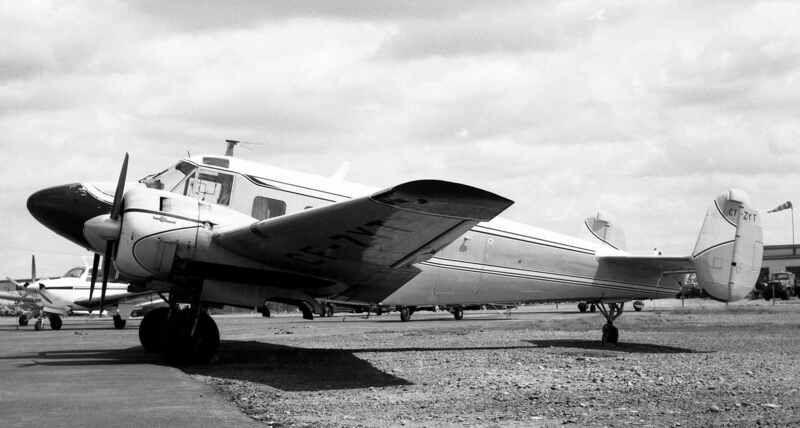 North Star Air’s Basler C-FWUI began in 1945 as RAF KN511. 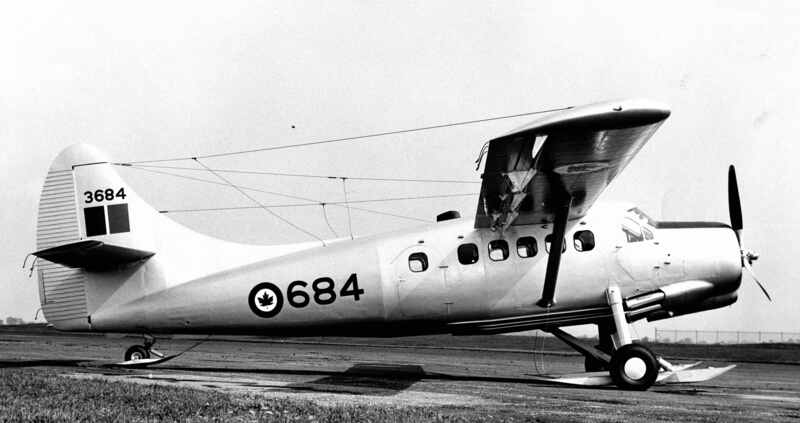 It then operated as such with the RCAF until its identity changed in 1970 to 12926. It retired in 1974, then became C- GWUH. Having flown for several northern operators, it became N707BA in 1985, mostly flying for US courier outfits. Converted by Basler in 2005, it essentially became a completely new airplane. Nonetheless, its heritage dates back almost 75 years. 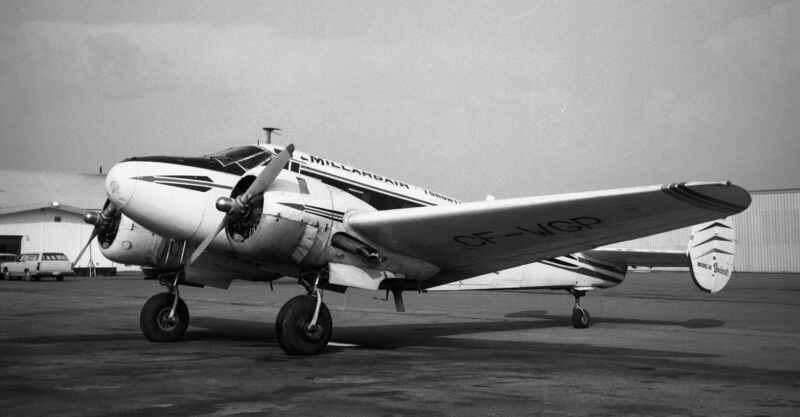 For those who aren’t sure about DC-3s, this is more what they looked like “in the old days”. I shot C-FFAY at Red Lake on July 15, 1991, while it was doing some freighting. 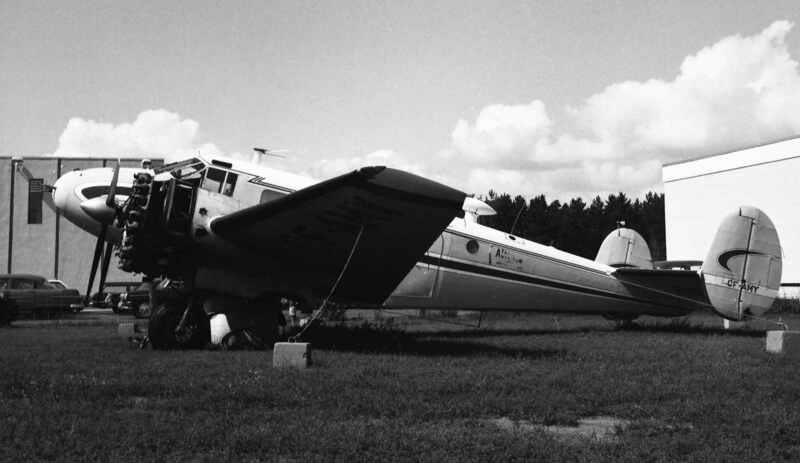 “FAY” is an old bird – serial number 4785 built in 1942. Postwar it spent years in South America, then came to Canada in 1972 for a Red Deer outfit called Astro Aviation. From 1973-81 it was with Lambair of Winnipeg, then was here and there with Perimeter Airlines of Winnipeg, Buffalo Airways of Hay River, etc. In recent years it’s been sitting dismantled back at Red Deer. Here I am beside the Red Lake terminal’s Norseman CF-LZO in a shot taken by Joe Sinkowski. 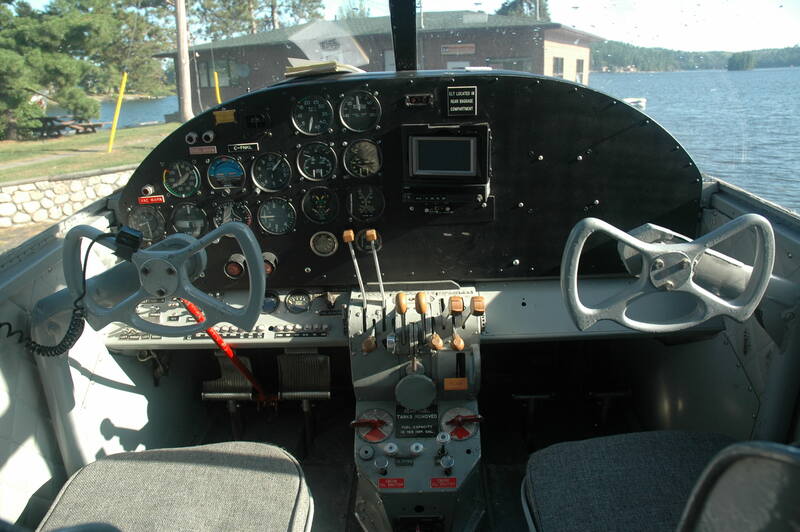 Other aircraft types come and go daily at Red Lake airport, the indispensable Cessna Caravan included. Here, Superior’s C-FYMK arrives from one of the northern reservations that it helps keep supplied with the daily essentials. The bulky belly pack carries much extra cargo. Built in 2010, “YMK” spent its early days in Italy, but mainly has been in Canada. “YMK” loads up for another trip. Due to the steep cost of air transport, a liter of milk, dozen eggs, bottle of pop or bag of chips gets ridiculously expensive by the time it reaches Bearskin Lake, Muskrat Dam, Big Trout Lake, Pikangikum, etc. Note that those last two belly bays carry up to 550 lb. Superior’s “amphib” Caravan C-FYMT gets back to base after another trip. In this configuration “YMT” can get in and out of less accessible spots, and cater to the seasonal fly-in fishing or hunting markets. Also seen pretty well daily at YRL is the Pilatus PC-12. Its roles are varied, whether carrying passengers, freight or, as shown, working as a speedy air ambulance. Air Bravo’s PC-12 C- FTAB was transferring a patient to Red Lake clinic on this July day in 2017. “TAB” previously was C- FMPO of the RCMP, which had acquired it new in 1999. One of the great unsung workhorses of the Canadian north is the 1960s-vintage Hawker 748. Last summer Northwest Ontario, where “The Hawker” once ruled the skies, had only one left. Although expensive to operate in the 2010s due to its “gas guzzling” Dart engines, former Wasaya Airways C-FFFS still was piling up the hours hauling groceries and all sorts of other supplies to the region’s isolated communities. Having begun in the Philippines in 1969, “FFS” eventually showed up in Canada in 1989 with Northland Air Manitoba. Kelner Airways had it on lease in 1991, then it was sold to Wasaya in 1996. The Hawker’s main advantages are how it probably doesn’t carry a mortgage, but it does carry a hefty payload – 12,000 pounds, and it’s fairly speedy, cruising at around 200 mph. No doubt, however, the more recent arrival of BT- 67 and Dash 8 freighters soon will see “FFS” shunted off to the boneyard. Another classic in and around Red Lake for decades has been the Piper PA-31 Navajo and Chieftain. Here, Superior’s Chieftain C-FVWY sits at YRL after a day’s work. Built in 1982, it originally was N4110N. It came to Canada from Hawaii in 2008. Chieftain C-GAJT looking a bit worse for wear at YRL. Built in 1981, it operated in the US as N800SA until migrating to Canada in 2003. As it sat last July, “AJT” didn’t seem to have great prospects. Some such aircraft sometimes return to life, but more often than not progressively get cannibalized, then go for pots ‘n pans. Also “in the boneyard” at Red Lake last summer was this Piper PA-23 Apache – C-FLQN. 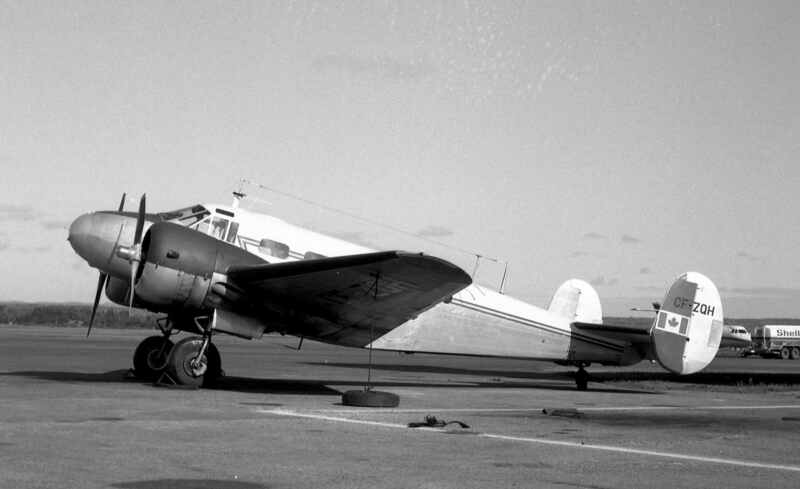 One of Canada’s leading light twins of the early postwar years, the “Plain Jane” Apache gave excellent service as a private, corporate and commercial plane. “LQN” came to Canada in 1959 for Reimer Express, a leading Manitoba trucking company. There it served for years before passing on to a string of Manitoba and Northwest Ontario owners. “LQN” may or may not ever get back into the air. If not, it sure could make a nice little acquisition for any serious aviation museum. Who knows, eh, but it would be sad to see this historic little Apache carted off for scrap. A steady stream of transient aircraft visits YRL, often just to refuel, but sometimes to drop off or pick up business travellers or sportsmen. Here, SOCATA TBM-850 N851MA from KABO Aviation in Kentucky arrives on a charter last July. For last summer’s Norseman Festival, the Canadian Harvard Aerobatic Team flew in from Southern Ontario. They were the icing on the cake for the week’s festivities. Here are pix of the CHAT Harvards at the airport. In decades gone by many an RCAF Harvard used to stop at Red Lake for fuel. For this part of today’s blog, let’s start with a few Red Lake pictures from “way back”, when the Norseman Festival began. I’d only been casually following the Norseman scene since I got interested in airplane photography back in the late 1950s. It took 3-4 trips to Northwestern Ontario starting in 1974 to get me keen on it. Still, I’d never had a ride in one ‘til I visited Red Lake in 1995 and Joe Sinkowski took me flying on July 15 in Chimo Air’s CF-KAO. Later that day Joe McBryan invited a few of us for a flight in his beautifully- restored CF-SAN. Here’s a shot of “KAO” from our flight. Joe was delivering sport fisherman that evening to their lodge on Culverson Lake. Joe’ McBryan’s pride and joy in 1995. He still flies “SAN” from his base in Yellowknife. The scene from above at the original 1992 festival. Just as we flew over the head of Howey Bay there were nine Norsemans (and one Beaver) at the docks. This was the Norseman Festival at its peak. As the years passed, the number of Norsemans gradually dwindled, but they’re still out there. 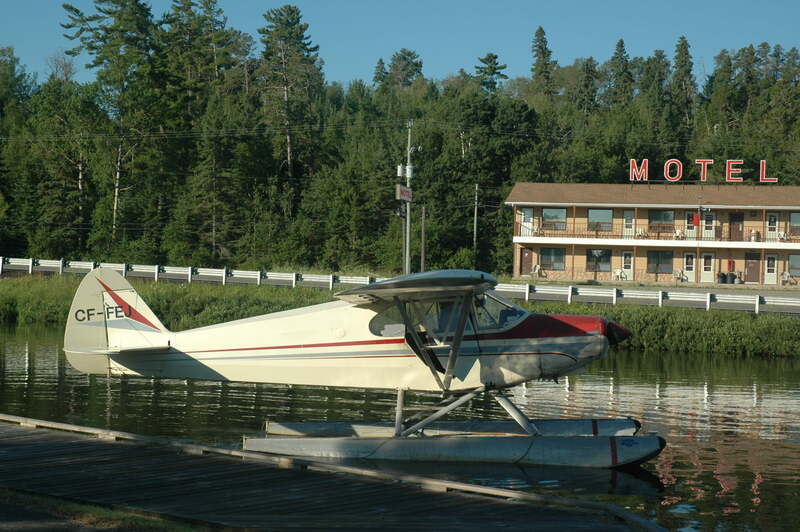 So come on … fill up your tanks, Norseman people, and fly on over to Red Lake this year. Some of “ye olde tyme” Norseman people around Red Lake in 1992. 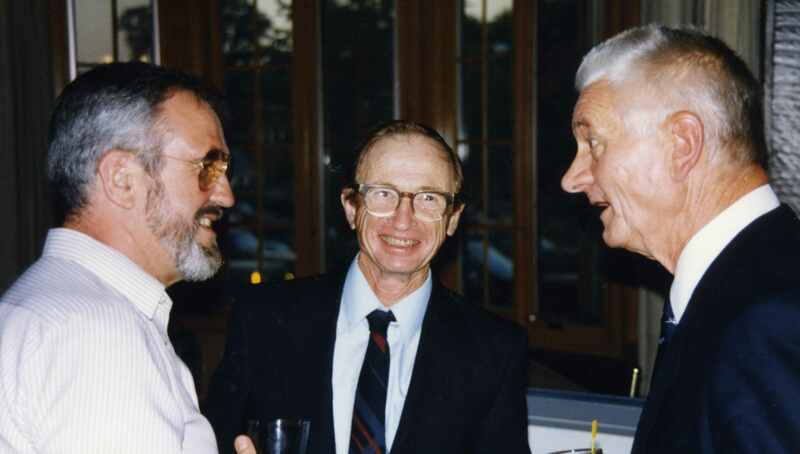 Joe Sinkowski is shown with Bob Green on his left, Bob’s brother Jack Green on his right. Then, Norseman technical wizkids Whitey Hostetler and John “JB” Blaszczyk of Whitey’s famous Red Lake Seaplane Service, where Red Lake’s “town Norseman” CF-DRD was restored in 1991-92. When Red Lake started talking over the idea of a Norseman festival and the idea got wheels, the town acquired the hulk of CF-DRD. This is how I saw it in 1991 soon after it had arrived at Whitey’s hangar. Then, here it is beautifully mounted in 1992 at Red Lake’s Norseman heritage park. To get a true sense of Northwest Ontario you need to bundle up and visit in winter. I did that a number of times in the 1980s-90s while laying all the groundwork for Air Transport in Canada. This is how I saw Norseman “JIN” one winter. 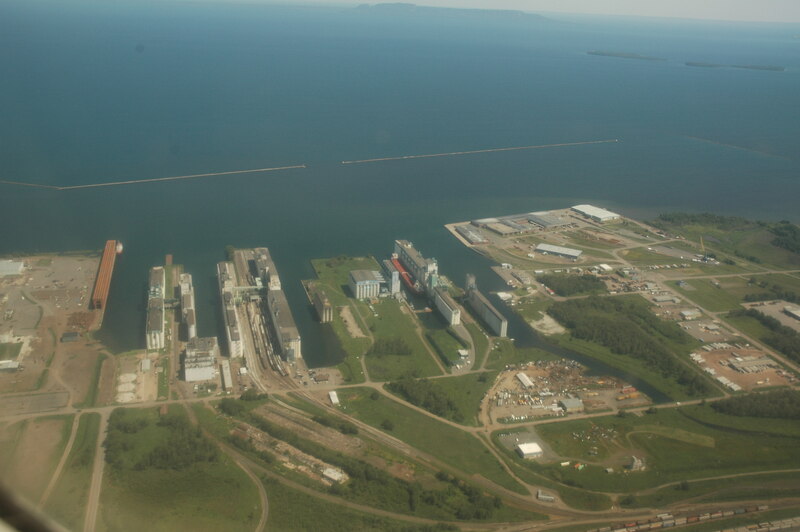 Then, a view of the Howey Bay main docks shot from Sabourin Air’s Cessna 185 C-GDSJ on March 26, 1992. Joe Sinkowski took the time to put some labels to my aerial shot. Joe flew all the planes in the Green Airways cluster. He got along fine with them, but had a special love for Beech 18 CF-GNR. Let’s have a quick look at some of last year’s Norseman Festival scenes in downtown Red Lake and around and about. 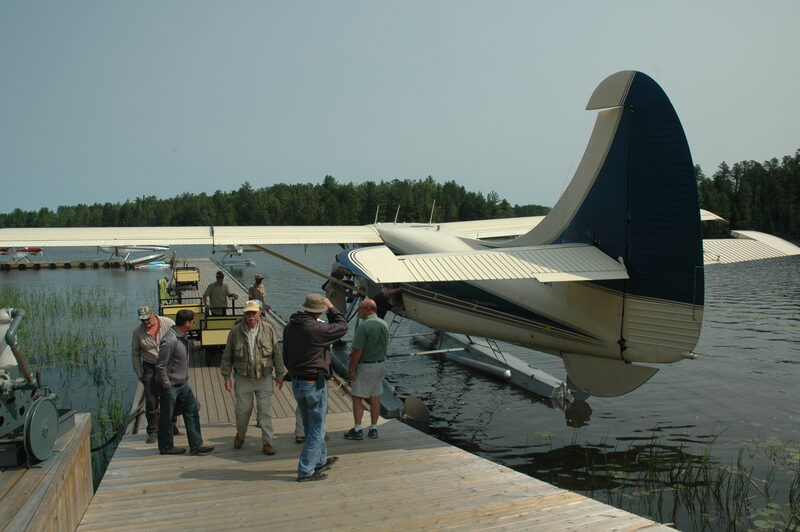 Here some folks get ready for their flight of a lifetime in Norseman “KAO”. Then, “KAO” pushing off. Sightseeing passengers get to see Red Lake and area from on high, and definitely get to feel, hear and smell “the wonders” of the Norseman first hand. You get your money’s worth, no doubt about it. Last year there also were Otter and Caravan rides. Chimo’s Norsemans “JIN” and “KAO” last summer. Even though the festival was on, they still had to do their daily trips, mainly going back and forth among the many local fishing lodges. 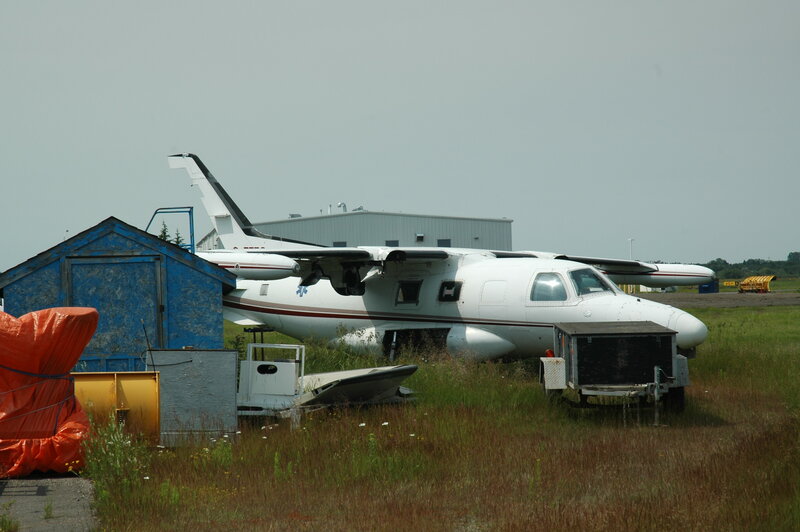 Turbine Otters “ODQ” and “RRJ” also were at Chimo last July. They represent the future of bush flying here, especially since the Chimo Norsemans were damaged last year by a furious hailstorm. “JIN” at the dock. Note “DRD” up behind in Norseman Park. Then, a view from the park overlooking down at the docks. 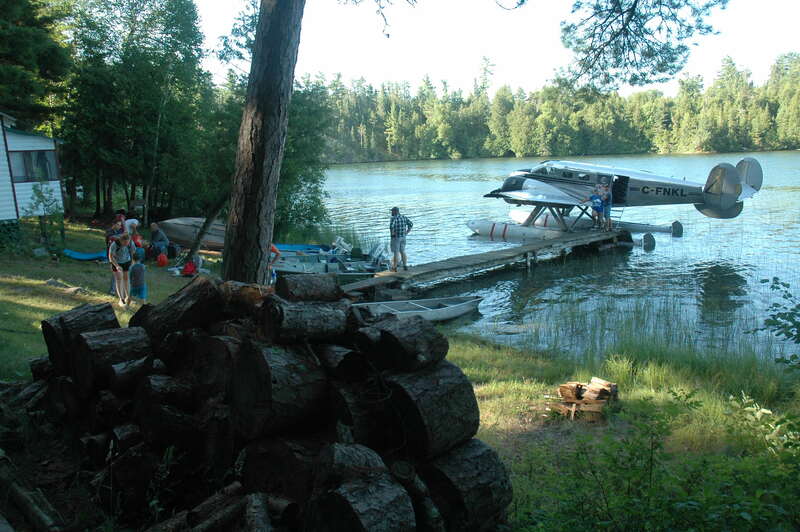 Lots of other bushplanes call Howey Bay home, including another indigenous Canadian plane – Found FBA-2C1 Bush Hawk “EJM” of Canadian Fly-In Fishing. Beavers at the famous Viking Outpost base on Howey Bay. Then, Green family Norseman CF-ZMX. Many years earlier Harvey Friesen had started up Bearskin Airlines with “ZMX”. Except for showing up annually at the Norseman Festival, “ZMX” is based at Selkirk (downstream from Winnipeg on the Red River). 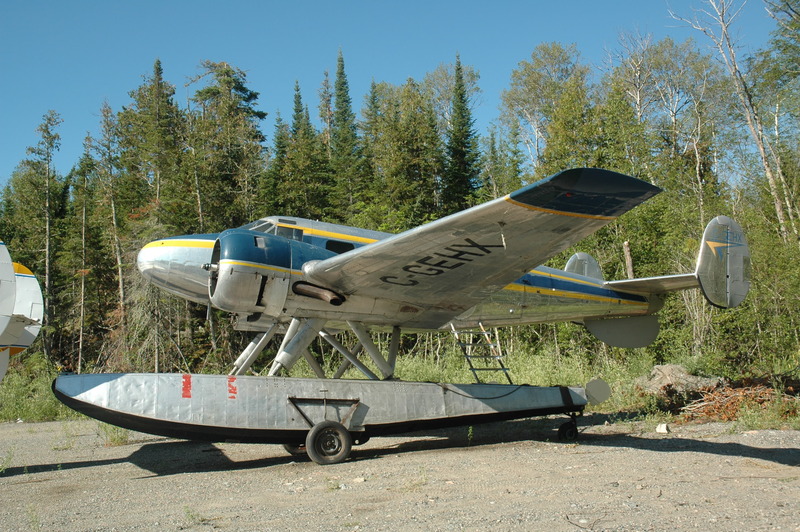 Last year I decided on a flight in Chimo’s “Steam Otter” C-GYYS. I blasted off a lot of frames during our 20 minutes with bush pilot Alex Moore. Here are a couple of shots of the great Goldcorp Mine at nearby Balmertown. Still one of the world’s most productive gold mines. Several other operators call the Red Lake region home. In nearby Cochenour is Faron Buckler’s base from where he operates Otter C-FODJ mainly to support of fishing camps, and bear and moose hunting trips under the Excellent Adventures brand. “ODJ” is powered by a 1000-hp Polish PZL engine. Then, Joe Sinkowski and Faron talking shop. The pilot’s front office in “ODJ”. The PZL Otter conversion gained a bit of popularity in the early 1990s, Green Airways operating two. Eventually, however, most became turbine Otters. Amik Outpost’s PZL Otter C-FHXY roars away from its base at Chukuni bridge on Hwy 125 on the way to the airport. Drive up Red Lake’s Forestry Road to the end and you’ll find the Ministry of Natural Resources main district fire base. The fire threat last July was low, so there was only one helicopter on standby — Heli-Inter’s Bell 205A C-GLHE “Tanker 2” flown by Swiss pilot, Steve Feuz. In the control centre scene, Randy Crampton of the MNR briefs Joe Sinkowski and George Holborn about the day’s fire situation. There’s always a load of great Norseman Festival fun at Centennial Park, kids “Norseman rides” included. Each of these little carts is done up in the registration and paint job of an actual Norseman. That’s “JIN” first. Last year there even was a Norseman/Bush Flying/Northern Ontario tattoo contest. Here are a couple of the entrees. Far out, eh! For the total “history nut” a walking tour of the Red Lake Cemetery is a must. The history of the town and region is here in a unique way. Joe Sinkowski gives a fascinating cemetery tour, relating stories galore of the old days, of so many great names and families from prospecting and mining times, of famous bush pilots and air engineers, local doctors, teachers, shopkeepers, trappers, town drunks, you name it. And it’s a very peaceful hour or two. Here’s the grave marker for World War 1 pilot Frederick Carroll, who found himself in Red Lake after the fighting ended and prospectors were pouring into the region. Looking in Royal Flying Corps and Canadian Expeditionary Force records, Hugh Halliday has found a bit about Carroll. It’s known that he was born in Newbrdge, Curragh, Ireland on August 5, 1891. Pre-war he had been a rancher “out west”, then joined the CEF in Winnipeg in September 1914. He was wounded in action on March 17, 1915, then was gassed on April 26. In October 1917 he joined the RFC and a year later was posted to 8 Squadron to fly the FK.8 2-seater on observation and bombing duties. So far we don’t know what had drawn this keen Irishman to Red Lake or what he did there over the years. Here’s Whitey’s marker with a Norseman motif. Such other legendary aviators as George Green (Green Airways) and Jake Siegel also lie here. James Lindokken’s stone features a Cessna T-50 Crane. His father, Oscar, ran a store at Deer Lake north of Red Lake. James died in a 1964 plane crash. Every visitor needs to drop in to Lamar Weavers’s “Treasure House of Red Lake”, the best spot in town to find a good book, a nice pair of hand-made moccasins, or a Norseman cap or T- shirt. Here I am perusing the aviation book section, where Lamar features Rich Hulina’s wonderful Bush Flying Captured and my Norseman books. Something always pops up at the very last, as did these two old slides. First, a photo taken by my late old pal, the great Les Corness of Edmonton. Passing through Kenora on August 20, 1983, Les visited Kuby’s maintenance and parts base. Among the usual variety of old wrecks that used to fill the yard was Norseman CF-DRD of Wings Aviation. “DRD” sat there for many more long years until rescued by Red Lake in 1991. Here’s another shot I took of it in 1992 at the first Norseman Festival — looking very fine indeed under the spotlights. Our good UK supporter, Trevor Mead, visited Bodo, Norway this spring. In the local Norwegian Aircraft Museum, he came across Norseman LN-PAB, which had begun as US Army 44-70546. It served with US forces in Europe following D-Day. Surplus at war’s end, it went to Norway in 1947 — first with Polar Fly, then with Wideroes. Following an accident in September 1952, “PAB” was stripped of useful parts and abandonned. In 2002 the wreck was recovered by volunteers from the Bodo museum, which gradually has been doing the restoration. So far so good by the looks of Trevor’s photo. Wasaya Group, its shareholders and Exchange Income Corporation (EIC) have successfully closed the transaction that was first announced on Feb. 1, 2018. Completing this milestone is one of the most significant events in Wasaya’s 29 year history,” said Michael Rodyniuk, president and CEO of Wasaya. “The strength of our combined aviation assets coupled with our capable and motivated people will result in a strong company ensuring Wasaya continues to be a fixture in the communities for years to come. Perimeter Dash 8 C-FPPW on arrival at Sioux Lookout on July 19, 2017. 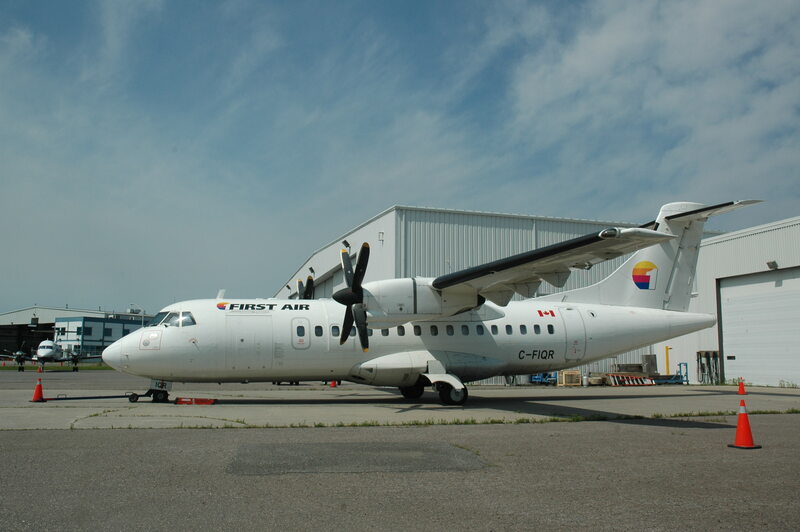 Having served frontline commuter airlines since the early 1980s, many Dash 8s have “come home” to serve northern Canada for such carriers as Air Creebec, Air Inuit, First Air, Perimeter and Wasaya. Having flown to “YQT” Thunder Bay from Toronto on July 19 last year to spend the morning photographing this fascinating airport, it was time to push on. 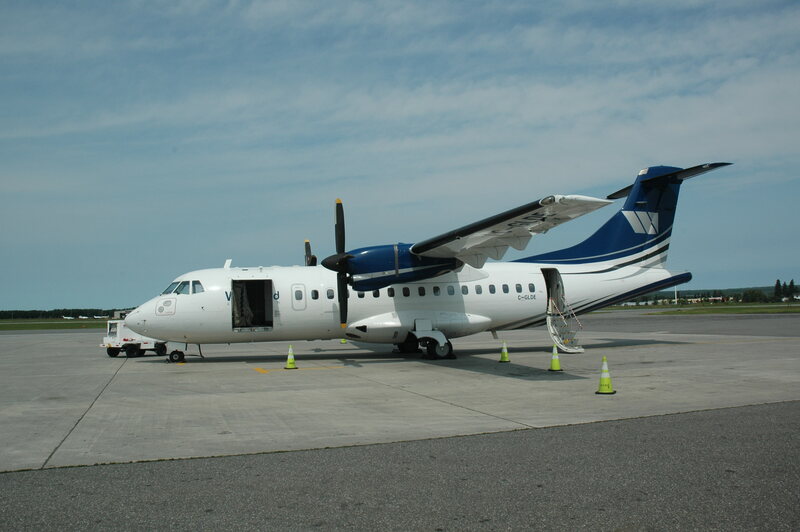 Mid-afternoon I boarded Perimeter’s Dash 8-100 C-FPPW for the 50-minute flight to Sioux Lookout “YXL”. The day remained fine, so it was a pleasant 50-minute trip in 1994-vintage “PPW” (the 390th Dash 8). Formerly N827EX, it served Allegheny Commuter and Piedmont Airlines for many years, before returning to Canada in 2010 for Perimeter of Winnipeg. Bush pilot, award-winning aviation photographer, and writer/publisher Rich Hulina met me at the terminal. We started by touring around the airport, where there’s lots to see and photograph. Here are a few of my shots taken before we headed to the curling club for burgers and beers. Since the days of the PA-23 Apache in the 1950s, Piper twins have done monumental work in Canada’s North. 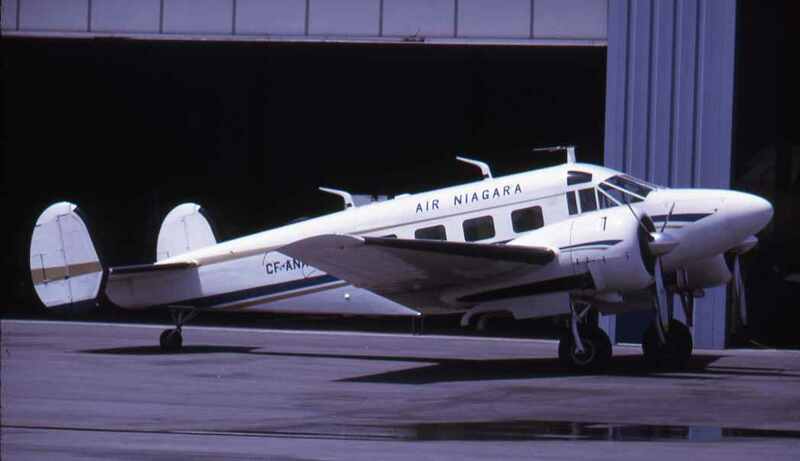 Introduced in 1972, the PA-31-350 Chieftain was a 10-seat version (2-foot stretch) of the 1964 8-seat PA-31 Navajo. Visiting YXL on July 19 was 1981 model year Chieftain C-GRWN in the markings of Northern Skies Air Service. “RWN” had come to Canada in 2007 for Sunwest Airlines of Calgary. In 2015 Sunwest posted it for sale by which time the airframe had piled up some 17,000 hours. By 2018 it was listed to Toronto-based FLYGTA Inc. 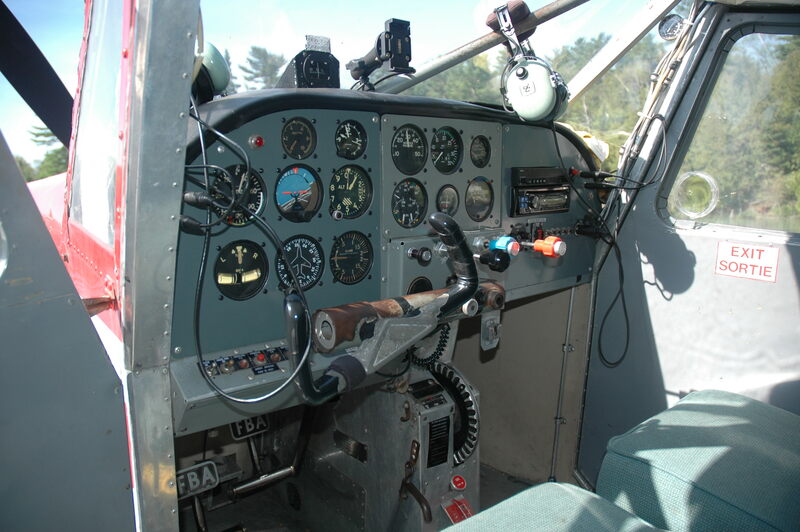 The money-making PA-31 series remains in common use throughout the North. One of the North’s ubiquitous Pilatus PC-12s taxis out at YXL on July 19. 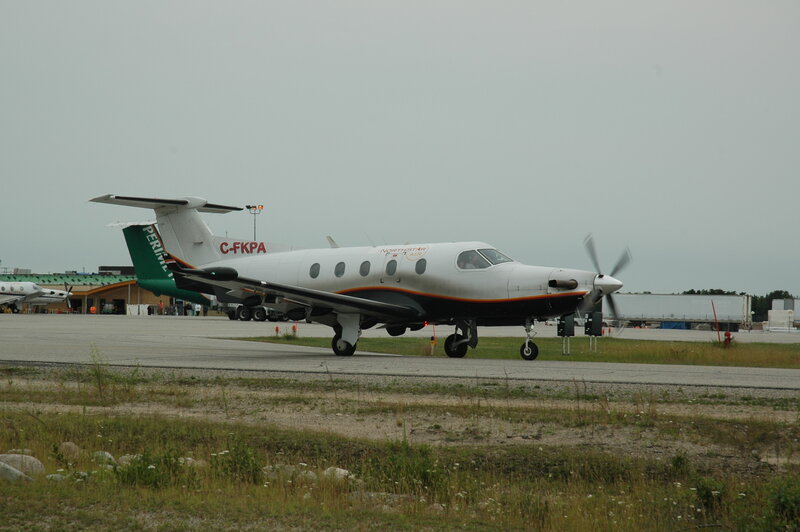 C-FKPA is in the colours of Thunder Bay-based North Star Air. As soon as the PC-12 was introduced to the region c1990, it began taking over from the previous generation of basic backcountry workhorses, especially the Cessna Caravan. 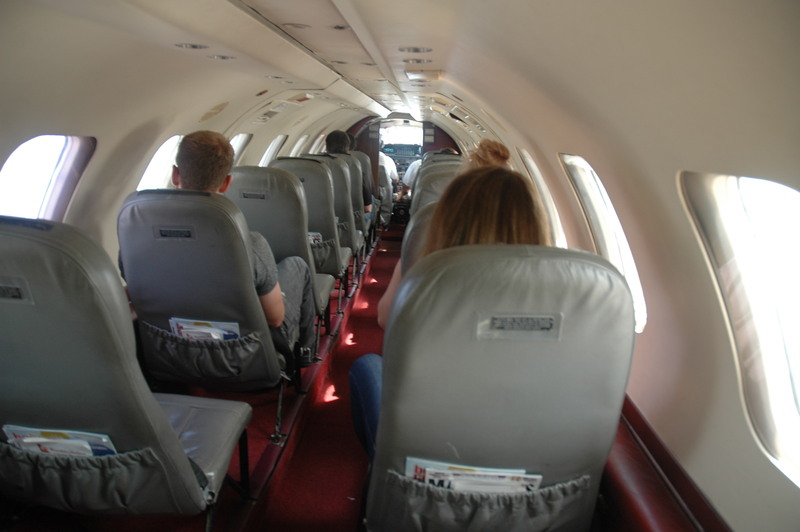 About the same size as the Caravan (which North Star also flies), the PC-12 is much faster and is pressurized – a nice feature when on a long run such as Sioux Lookout to Bearskin Lake or maybe all the way over to Moosonee or Timmins. 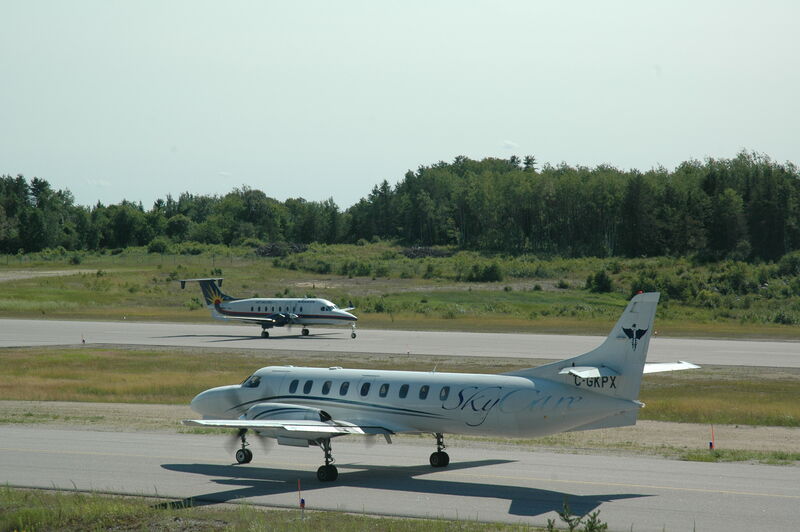 Another typical daily Sioux Lookout scene shows SkyCare’s Metro II C-GKPX taxiing for takeoff as a Wasaya Beech 1900D arrives. Built in 1978, “KPX” operated throughout the EU until becoming N5470M in the USA in 1997. It came to Canada in 2008. Recently established at YXL with the Chieftain, Merlin and Metro, SkyCare specializes in charters and air ambulance service. There’s invariably at least one Beaver being serviced at Sioux Lookout. This day, CF-IPL was waiting to be delivered back to base. Beaver No.132, it originally bought in 1951 by Imperial Oil of Toronto. 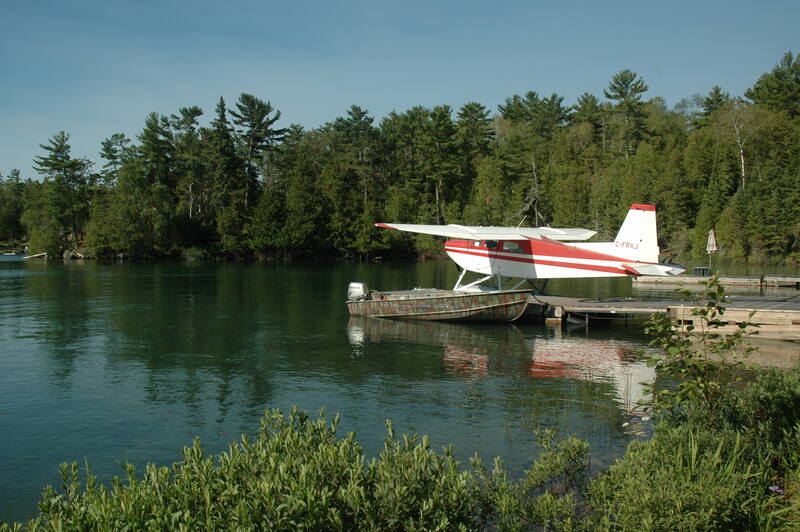 Since 1963 “IPL” has been in the Atikokan area, most recently with Atikokan Aero Service specializing in the summertime sport fishing and wildness trips markets. Across the field you can see the hanger for the locally based Ornge PC-12 air ambulance. 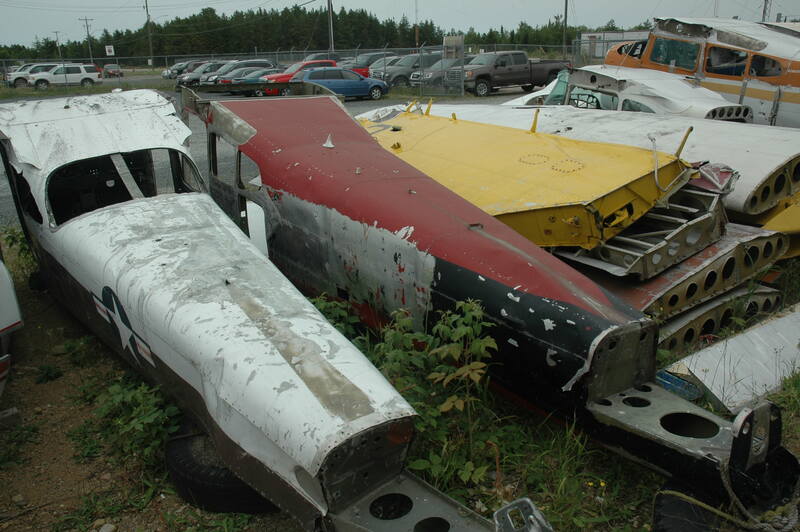 It’s not uncommon on any main northern airfield to find a boneyard of old planes. At YXL the main one sits at the Allen Air hangar. 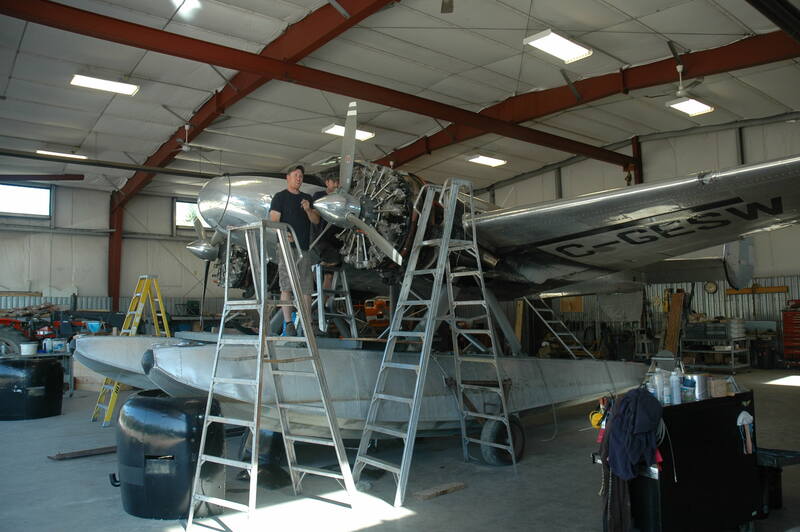 Founded by George Allen offering aircraft maintenance and rebuilding, this is a legendary Sioux Lookout business. Following George’s passing, his son Dave took over the hangar. Dave George’s business has been aircraft maintenance, but also restoring wrecks and cannibalizing others for useful spare parts. This was part of the scene on July 19 with lots of clapped out Cessnas lying around. However, it isn’t beyond the imagination that the odd one might fly again. 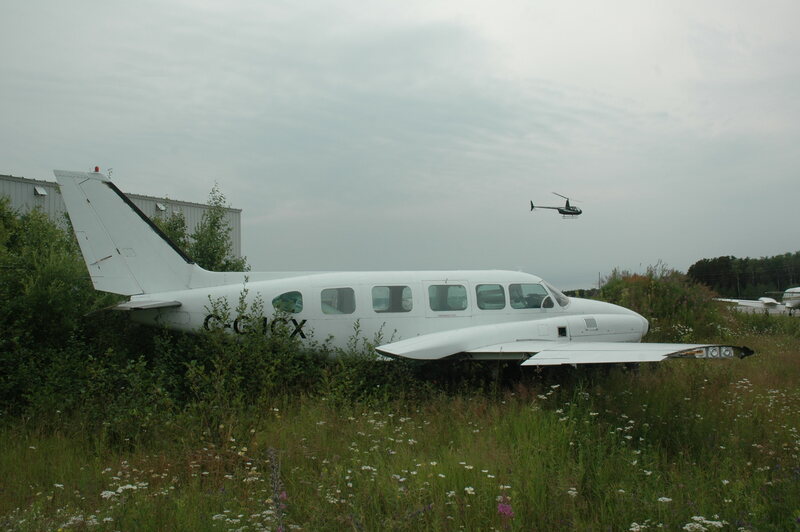 Last summer things were not looking promising ay YXL for SkyCare PA-31 C-GJCX. A 1977 model, “JCX” had been in the UK as G-BEZU with such operators as Oxford Air Training School. Later it was G-HVRD doing charter work with Clasair. It flew the North Atlantic to Canada in 2013. There also were 2-3 old Metros lying in the weeds here. The R-44 helicopter in the distance had just refueled and was continuing its ferry trip to Alberta. Next morning Rich and I were up at sunrise to start a busy day. 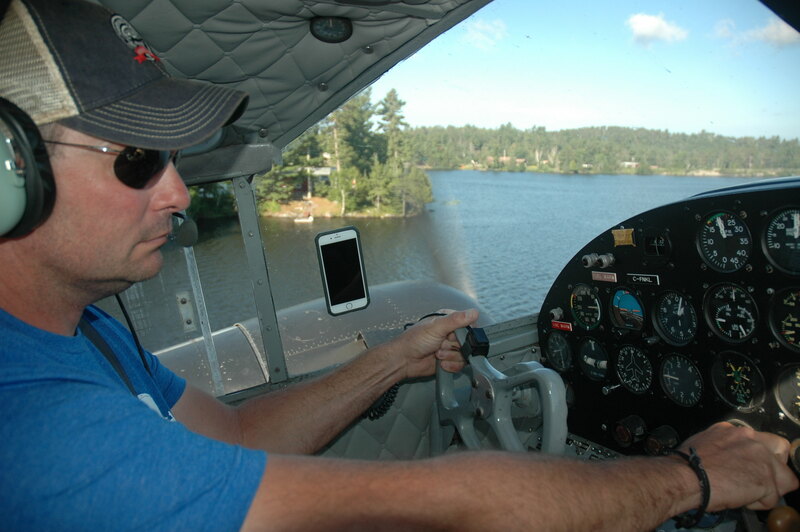 The plan was to take Rich’s beautiful Cessna 206 Stationair C-GGRU down to Nestor Falls on Lake-of-the-Woods for a day of knocking around the bushplane scene. Here, Rich pumps in gas at his home dock for the return trip of about 200 nm. A couple of the local Nestor Falls planes on July 20: Beaver C-GEBL of Northwest Flying Service (NorthwestFlying.com), and Piper CF-FEJ head out on local trips. Beaver No.1068 “EBL” is an ex-US Army L-20A that served in military colours 1957-72. It came to Canada in 1975 and since then has always been in NW Ontario. 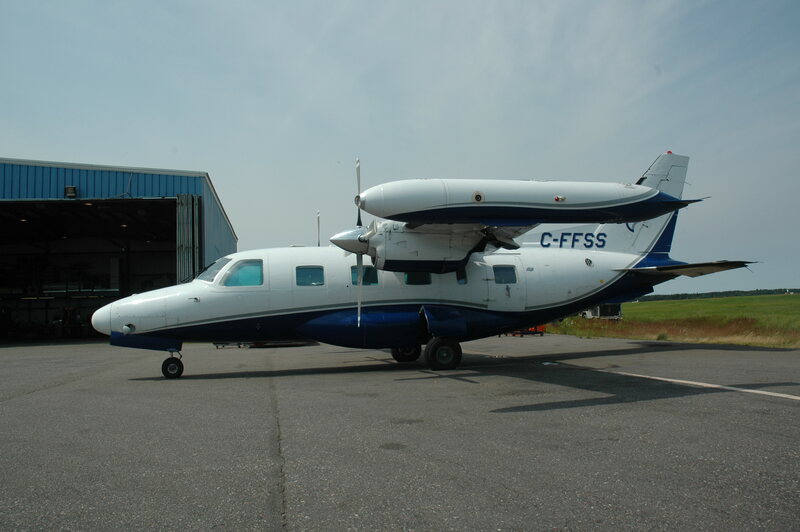 “FEJ” first appeared on the Canadian Civil Aircraft Register in 1973, the co-owners then being in Lively, near Sudbury. Rich (right) with Northwest Flying Service owner Shane Pope make plans for our visit. Shane’s outfit is famous for its two lovely Beech 18s C-FHZA and C-FKL. Here, “NKL” is nearest, as “HZA” is pushed off for an early trip to one of the numerous fishing camps out as far as a hundred miles. “NKL’s” front office. Then, Beech 18 aficionado Shane Pope just as he gets “NKL” neatly into the air for a short camp trip delivering passengers and supplies. The setting out at camp where one of Shane’s Beeches is always a welcomed sight. Rich relaxes in “NKL” on the way back to base. In recent summers he’s enjoyed flying a Beech 18 based at Ear Falls. Back in the 1950s-60s we schoolboy “airplane photo hounds” rarely would let a Beech go by without snapping off a frame. Searching my files lately, I see that I photographed both “HZA” and “NKL” more than 55 years ago. I came across “NKL” at Rivercrest airstrip near Winnipeg on September 5, 1961; and “HZA” at Toronto Malton Airport on March 4, 1962. 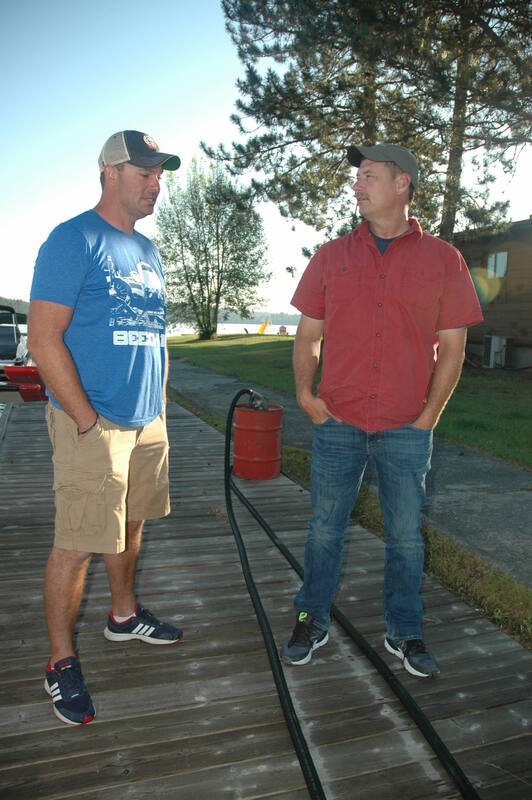 At the time, Warren Plummer of Sioux Narrows was using “NKL” to support his pioneer sport fishing camps on Great Bear Lake. “HZA” was then with Cascade Drilling of Calgary. Of course, one could write a book about any such Beech 18. The amazing thing is that in 2018 both Beeches will again be in the water at Nestor Falls. Various other photo-worthy planes were at Todd’s base on July 20, this fine-looking 1947 Aeronca “Champ” CF-TBY included. From the Beech 18 haven, we drove over to visit Todd’s dock to have a look at his 1964 Found FBA-2C CF-RXJ. Built in Toronto, “RXJ” has spent its career in NW Ontario, where after 50+ years it still does useful work. 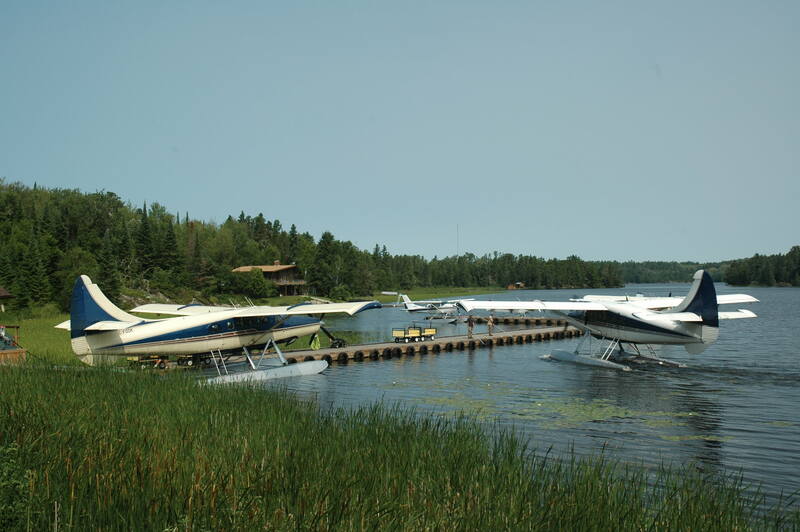 Here’s how it typically looks at the dock in summer. Then, a view of the interior, little of which has changed other than some instrumentation. Finally, Rich and Todd discussing the Found, which proved to be such a solid northern workhorse over the decades. Rich sometimes flies Glen Tudhope’s FBA-2C C-FSDC from Hudson, near Sioux Lookout and rates it highly as a basic bushplane. 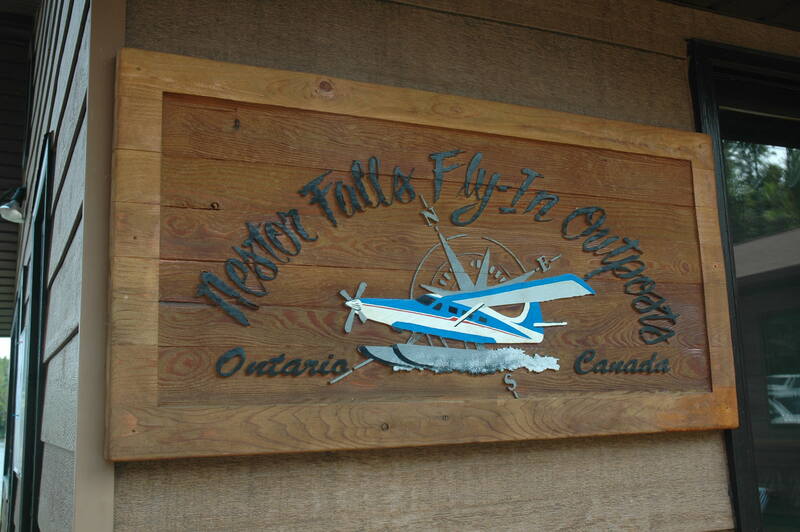 After snooping around some other local docks, we ended at Dave Beauchene’s always-busy Nestor Falls Fly-In Outposts. In former years this was another good spot for Beech 18s, but Dave ultimately converted to turbine Otters. Here are the fellows in Dave’s giftshop, where we found a copy of Rich’s photo of Dave’s two Otters. 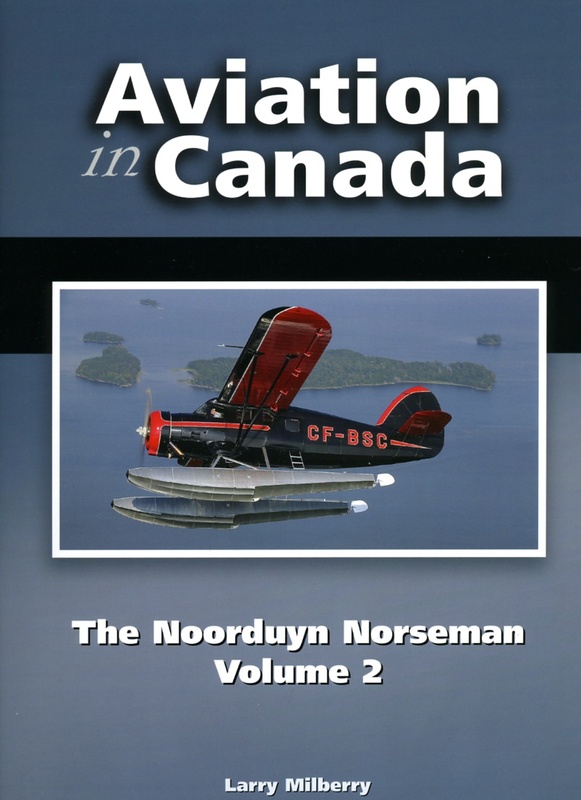 See Rich’s book Bush Flying Captured for the best current coverage of aviation in NW Ontario! Three scenes at Dave’s main dock on July 20. First, his Otters at the dock: C-FODK and C-FSOR. 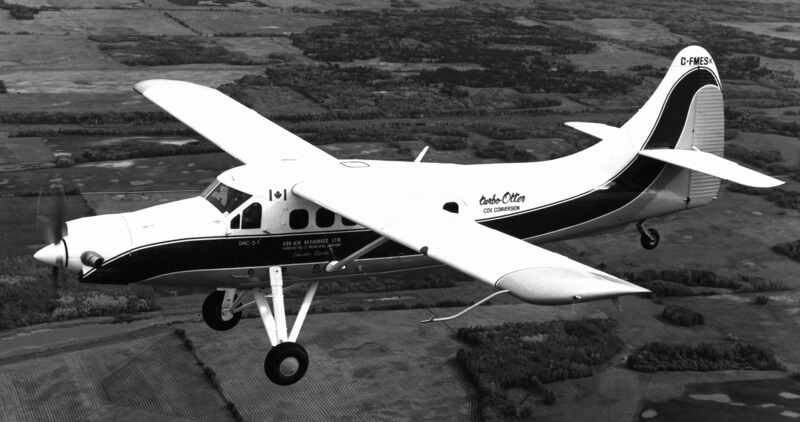 C-FODK had begun in 1953 with the Ontario Department of Lands and Forests. It served there to 1984, then went to Huron Air of Armstrong for another long career. However, things came to a messy ending when “ODK” had engine trouble on May 26, 1998 and crashed into the bush. Rebuilt, it came to Nestor Falls in 1999, then was converted along with “SOR” in the 2000s to the Garrett 1000-hp TPE-331 turbine. Next, a typical dock scene with an Otter just back from camp with a load of happy American fishermen. Finally, “SOR” heading out on a trip. “SOR” had begun 1958 with the Indian military, where it served in major shooting wars with China and Pakistan. By 1991 (when it was retired) it had logged nearly 6400 flying hours. Coming back to Canada, it was restored in Saskatoon in 1994, then found its way to Nestor Falls. Our long, enjoyable day finally over on Lake-of-the-Woods, we got back aboard our lovely Cessna and returned to Sioux Lookout, where I had a flight to catch. Thanking Rich for a great day of meeting people and photographing bushplanes, off I went on Bearskin Flight JV319 (Metro C-GJVW) to Red Lake, a pleasant 30-minute hop. The Metro is basic NW Ontario air transportation and it works! Check in again to see “Part III Red Lake” of last summer’s NW Ontario travels. 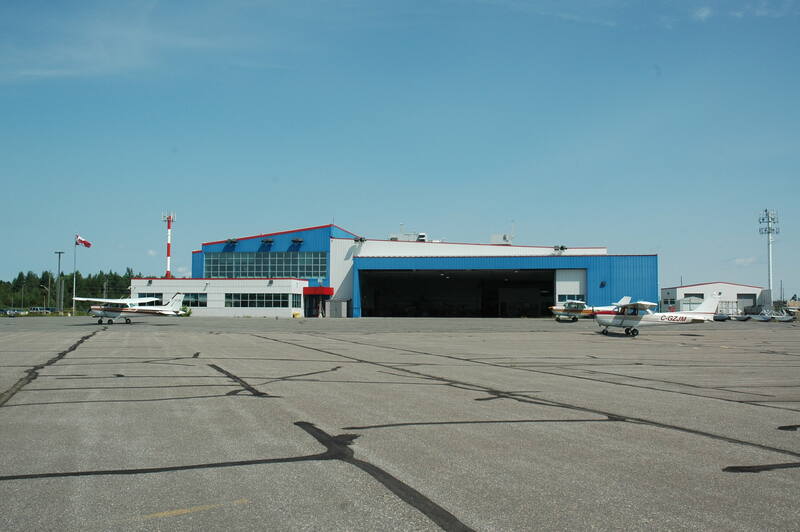 Some years ago the Northwestern Ontario Aviation Heritage Centre was formed in Thunder Bay. The society’s message is just as you might expect — it brings together people of like mind, whether old timers or “the younger set”. Meetings are held at 905 East Victoria Ave., and there’s a regular newsletter. Check out the website http://www.noahc.org (or … email to noahc@tbaytel.net) and get yourself a membership. You don’t need to be a local to belong, so get on the NOAHC bandwagon — you’ll be happy you did! 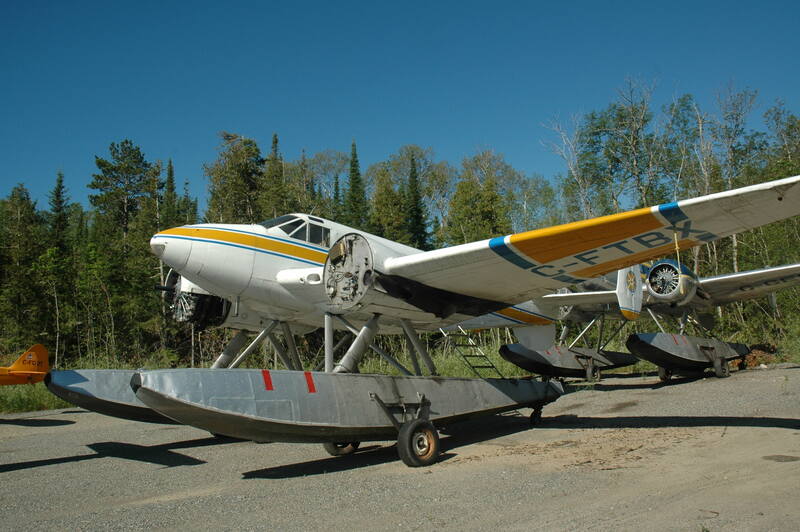 Last July a violent hailstorm hit Howey Bay at Red Lake, severely damaging the town’s iconic Norseman CF-DRD and grounding the two Chimo Air Service Norsemans. Red Lake is setting out to restore CF-DRD. Can you help in this important but expensive aviation heritage cause? Please go to https://www.gofundme.com/Save-DRD?pc=em_db_co2876_v1&rcid=bbcb9c3843a54fd598ade3094e566841 to donate even just a few bucks. Thanks for your contribution! Also … you should google Red Lake Norseman Festival to see what’s shaping up for this July’s festivities. Cheers … Larry. Last year’s field trip to Northwestern Ontario proved to be the usual fantastic experience (scroll back to find our in-depth coverage for 2012). 2017 took me back to my first adventure here away back in the summer 1961, when I flew in to the old Fort William Airport on a TCA Viscount. I’ve returned many times. For 2017 I got rolling on July 19 by stepping aboard a spiffy Porter Airlines Q400 at Toronto Billy Bishop Airport — “YTZ”. Smooth, fast and quiet, this is definitely the most enjoyable way to YQT. You start by climbing out over the sprawling GTA. Toronto Bay, the iconic Toronto Islands and the massive city skyline are right there out your window. But the city soon gives way to scenic rural Ontario as you pass Lake Simcoe on the right and head over Georgian Bay and Lake Huron ‘til you’re looking down on Sault St. Marie. Then comes the long, straight leg (pretty well 250 miles) all the way across Lake Superior to your landing at “YQT” Thunder Bay. The whole flight covers about 550 miles from YTZ. As is usual for a bright summer’s day, YQT was busy this morning with all sorts of airplanes in their many colours. First stop was the airport manager’s office to check in for my pre-arranged airside photo tour. YQT went all out, providing a vehicle and a staff member who knew every nook and cranny. Here are a few of my photos. To see a photo full frame, click on it once. A typical scene on descending via Porter Q400 to land at Thunder Bay on a fine summer’s day. Highlighted in this grab shot out the window is the city’s historic waterfront. Even though by now a shadow of its former self, the old industrial shoreline still has its landmark grain elevators and you also can spot the modern development. At the very top (on the horizon) I barely caught “the Sleeping Giant”. 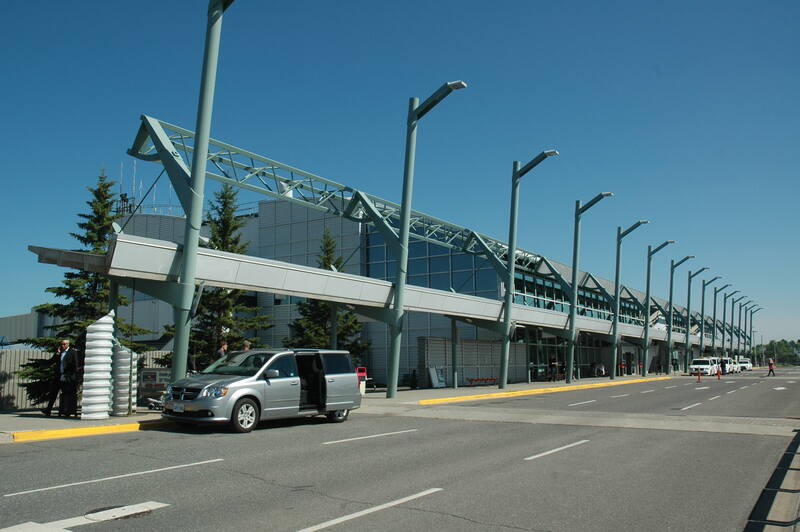 Thunder Bay International Airport as you’ll find it– an attractive example of functional airport architecture. YQT is at the heart of a vast region sweeping across Northern Ontario from Bearskin Lake 400 miles to the north, and northeasterly 400+ miles to Moosonee. Westward it’s a straight line 370 miles to Winnipeg. From Winnipeg to Moosonee are dozens of small, mostly “air only” communities that look to Thunder Bay and Winnipeg for their daily necessities. 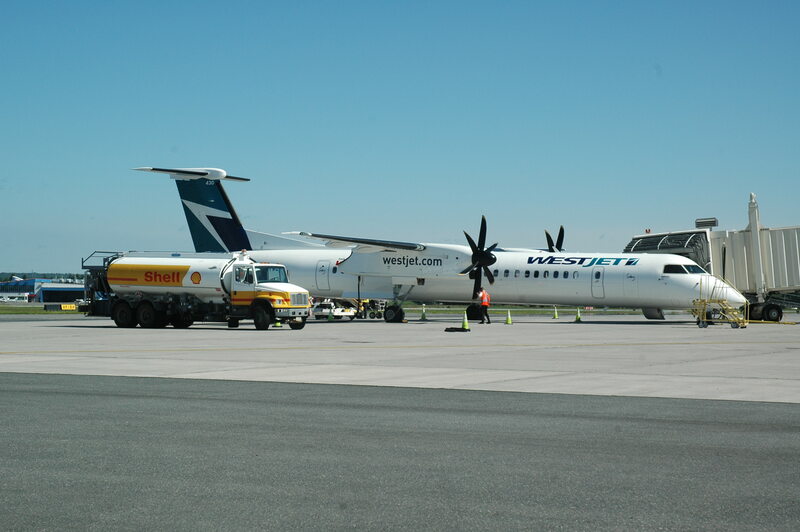 The chief east-west carriers between Winnipeg and Toronto are Air Canada, Porter and WestJet. 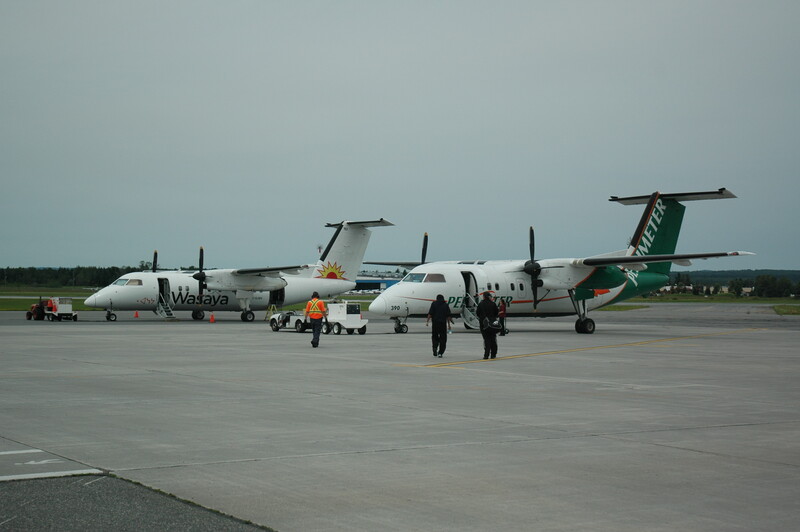 The main local carriers are the ever busy Bearskin, North Star Air, Perimeter, Thunder Airlines and Wasaya. YQT is an impressive operation. For 2017 it handled a record 845,000 passengers and supported about 5000 jobs. As noted by the airport authority in January 2018, “TBIAA receives no government funding for the operation of the airport. Economic activity … is responsible for an estimated $645 million dollars in GDP …” For more YQT info see http://www.thunderbayairport.com. Porter Q400 C-FLQY at YQT with the Ornge air ambulance base as backdrop. “LQY” was delivered to Porter in April 2010. 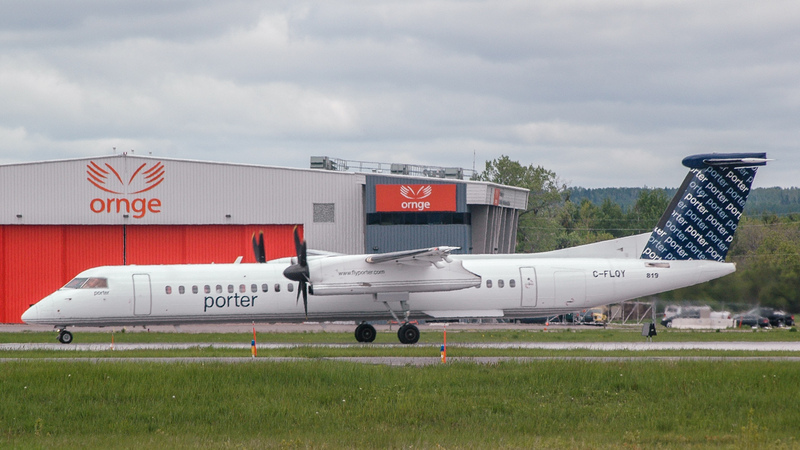 For 2018 Porter had 29 74-seat Q400s in the fleet and was operating 5/6 daily Lakehead flights. The comfortable and speedy Q400 cruises at 360 knots. 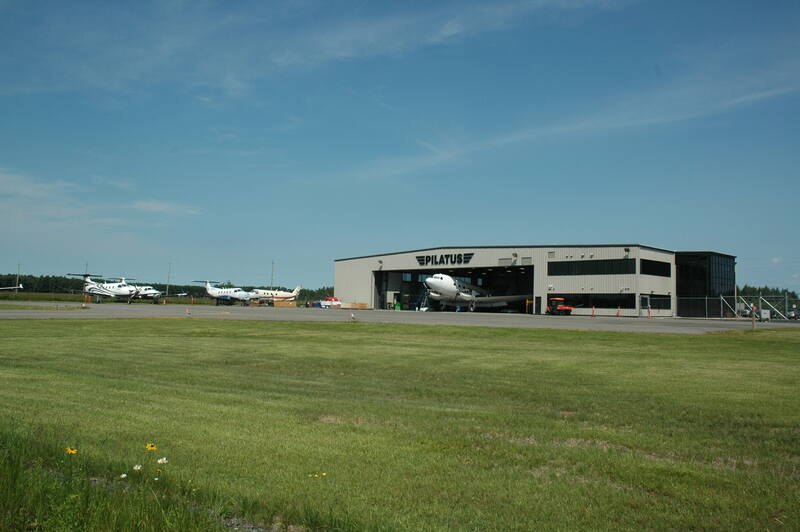 In 2018 Porter opened a crew base in Thunder Bay, the first such in Northern Ontario for any major airline. To book your Porter Q400 trip, go to http://www.flyporter.com, right! One of Westjet’s 78-seat “Encore” Q400s during a YQT turn-around on July 19. Encore’s fleet totals 43 Q400s providing regional service from BC to the East Coast. Porter concentrates on Ontario, but also flies as far east as Newfoundland and to US cities from Chicago to Boston and south into Florida. One of the most important northern workhorses is the Swearingen/Fairchild Metro III and IV series (and predecessors). The Metro IV (also known as the Metro 23) of the late 1980s is the epitome of Ed Swearingen’s life’s work that began by tinkering with Beech Twin Bonanzas and Queen Airs at his Texas base in the 1960s. His efforts led to the Merlin light corporate twin using PT6 or Garrett turboprops. Further development resulted in the SA226 Metro series, first flown in 1969. In the 12,500-lb, 19-passenger category, the Metro steadily evolved. Of the whole Merlin/Metro series, some 700 planes were delivered until production ceased in 1998. Here’s Bearskin Metro IV C-GYTL at YQT on July 19. 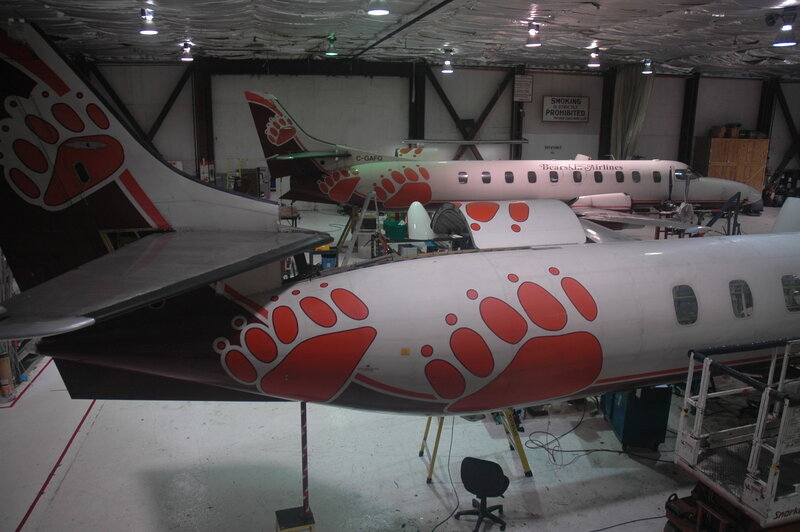 See http://www.bearskinairlines.com and Air Transport in Canada Vol.2 for more good Bearskin coverage. Metro “YTL” has been retrofitted with 5-blade composite propellers. The Metro cruises at around 250 knots. It’s been a good performer on the gravel strips that typify the north. 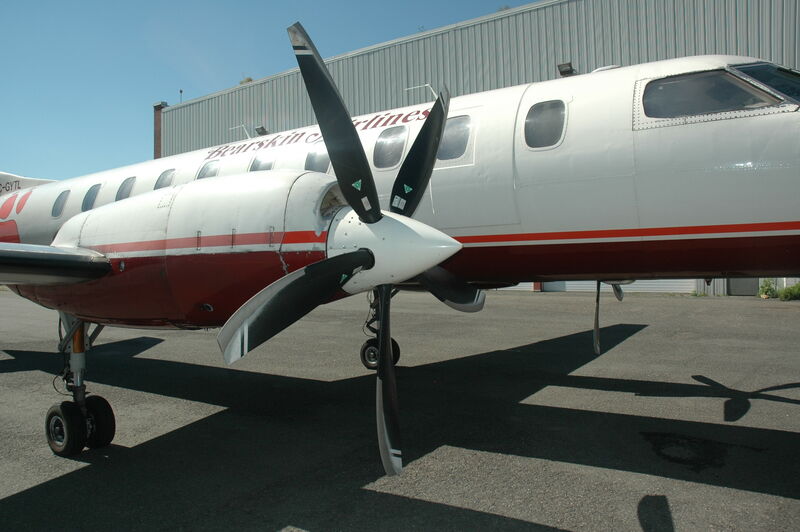 Its 1000-hp Garrett TPE331s are among the most reliable light turboprop engines in aviation history. Of all the 19-seat types over the decades, the Metro has proven itself best to the people of this vast hinterland. Sure, it’s noisy and cramped, but it’s fast, reliable, safe and makes a profit. 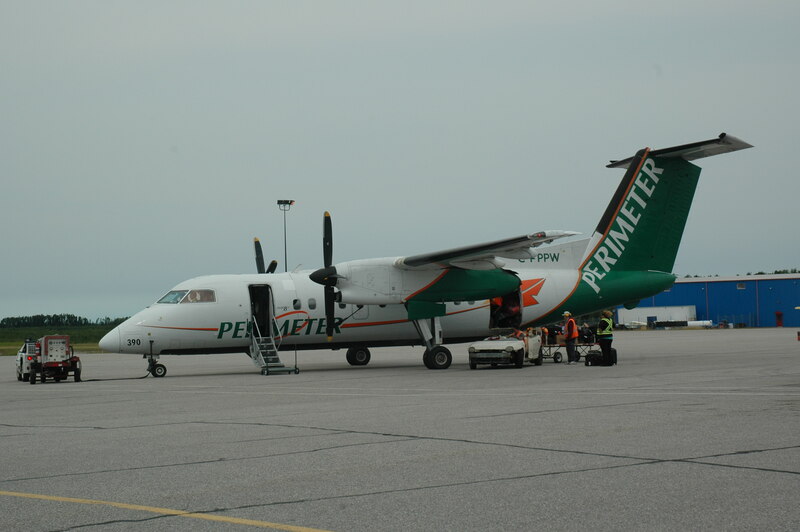 Bearskin’s sister company, Perimeter Airlines of Winnipeg is another longtime Metro operator. Appearance of the Metro let operators in this region quickly replaced their hodgepodge of old piston-pounders from the Aztec to the DC-3. Bearskin Metros – C-GAFQ included — undergo scheduled maintenance checks at YQT. 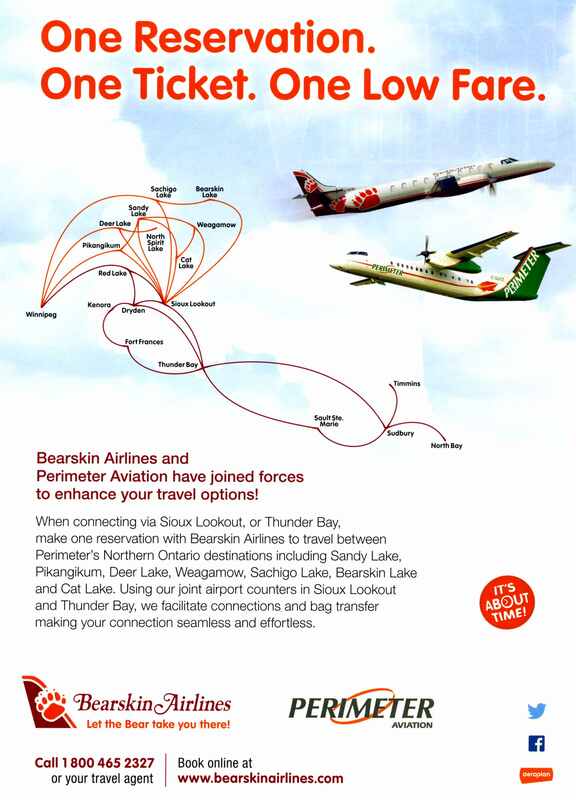 Bearskin/Perimeter’s 2017 route map gives an idea of the vast region served by the Lakehead’s northern air carriers. (Below) The Confederation College YQT campus. Hundreds of young pilots have graduated from “Confed” over the decades. The 2018 fleet includes 16 Cessnas and three flight simulators. One of North Star’s Basler DC-3s at YQT on July 19. When lucky enough to have a guided tour at YQT, any fan with a camera has no trouble keeping busy for a good couple of hours. You’ll always see courier and cargo planes awaiting their next trips. 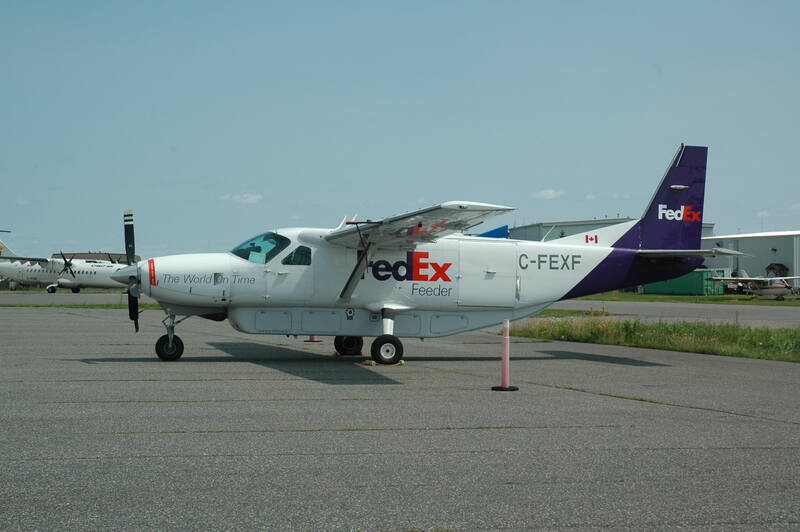 Present on July 19 were First Air ATR-42 C-FIQR and FedEx resident Caravan C-FEXF. With any such planes, there usually is some interesting history. 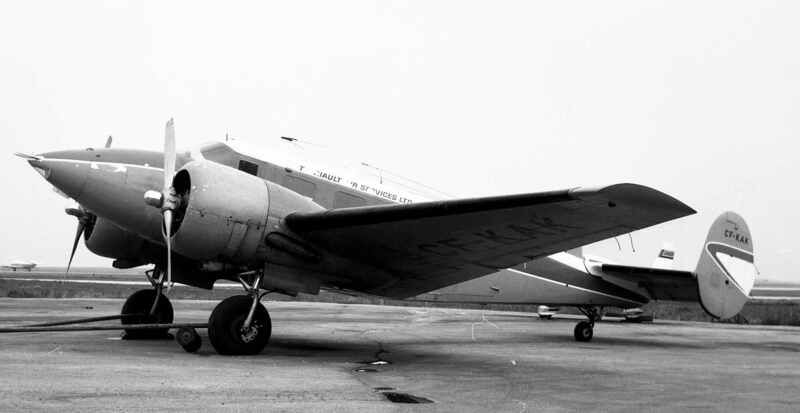 “IQR”, for example, for decades was the registration on one of Canada’s most historic DC-3s, CF-IQR. 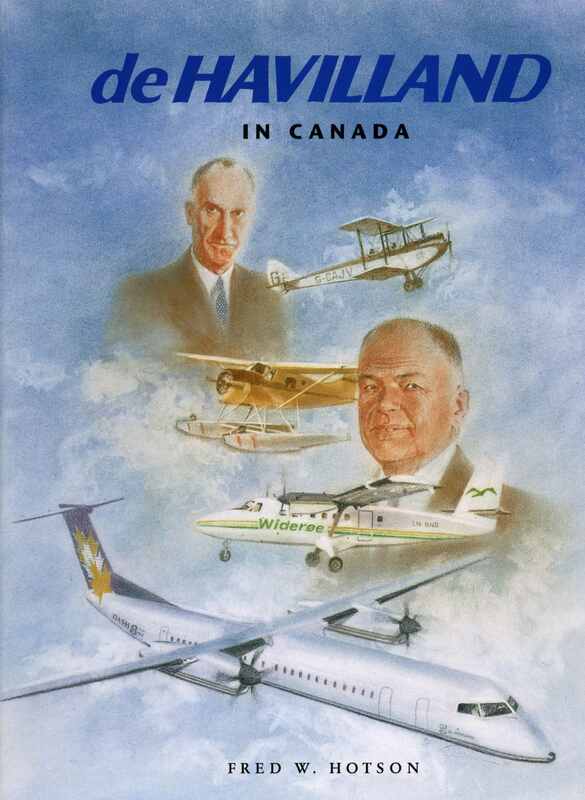 First in Canada in 1956, “IQR” served such companies as Wheeler Airlines, Nordair and Bradley Air Services. Its flying days finally ended in a 1977 crash. Today’s “IQR” also is registered to Bradley Air Services, parent company of First Air. The ATR-42 broke into the northern market especially due to its standard cargo door. This gave it a jump on the Dash 8-100, which started appearing with such operators as Perimeter in the 2010s, but without a cargo door. Recently, however, cargo doors have been retrofitted to Dash 8s, broadening their usefulness in the north. Way out in YQT’s “Back 40” sits this old clunker of an ATR-42 that along with HS748 C-GBCY is used in training EMS personnel in emergency scenarios. 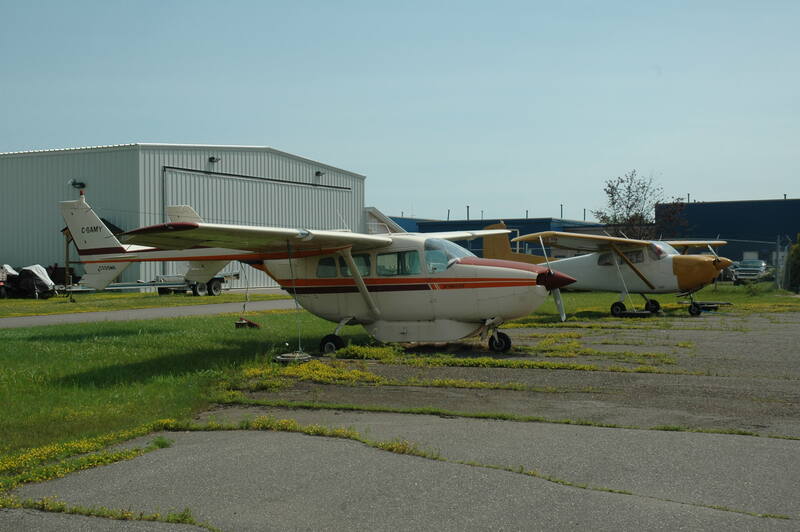 Here are a couple of other vintage planes on the YQT tiedowns on July 19: 1966 Cessna 337A C-GAMY and 1959 Cessna 175 C-FLIO. (Above) There invariably are some interesting transients at YQT. In summer these often bring sportsmen north for some world-class fishing at the region’s famous outpost camps. On July 19 I spotted these beauties. 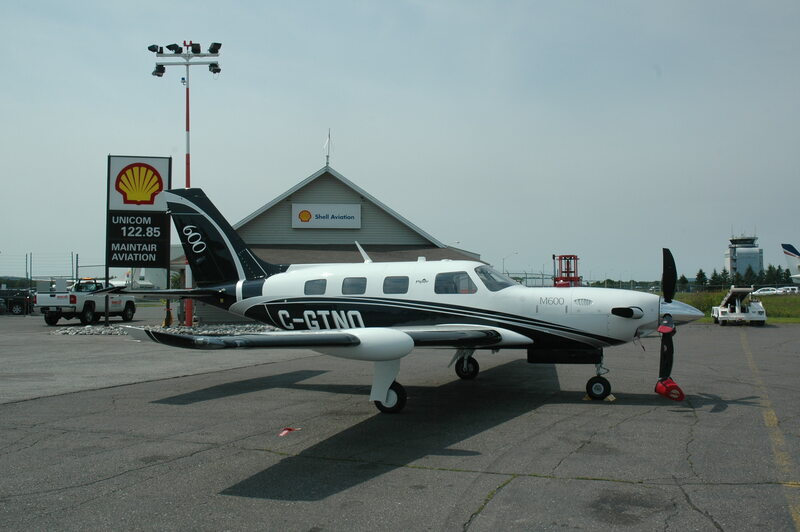 Piper PA-46 M600 Malibu (US$3M basic new price) C-GTNO was at the Shell FBO. Waiting nearby was Citation 560 Citation N535GR (G&R Aviation) on a charter from Louisville. Another stalwart on the YQT scene for decades is the Mitsubishi MU-2 “Rice Rocket” (first flight 1963). 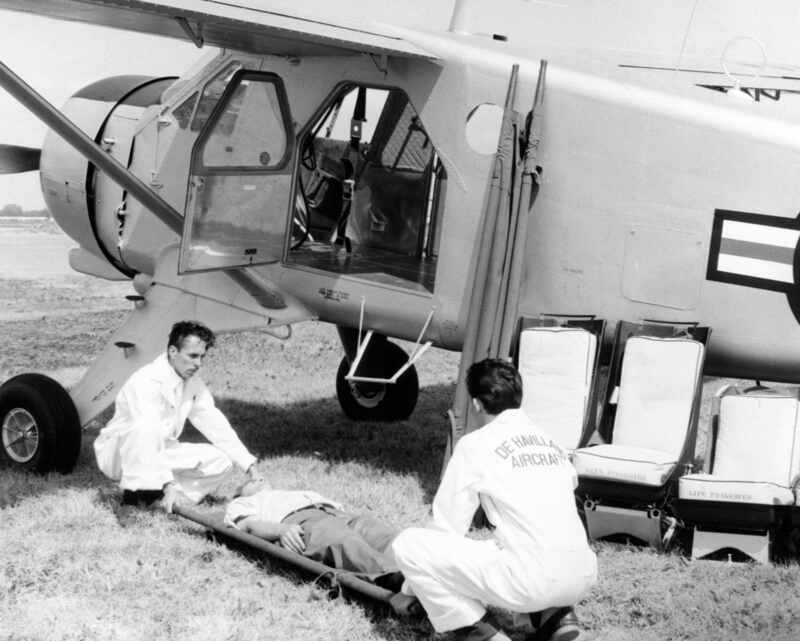 Once the MU-2 started reaching the hand-me- down stage in the 1980s, it found lots of work in northern Canada as a speedy air ambulance, while still doing general duties. MU-2B- 60 C-FFSS of YQT’s Thunder Airlines was sunning itself on the ramp on July 19. Parked in the bone yard around the corner was a superannuated MU-2 that probably still was useful for particular spare parts. As do so many older such planes, C-FFSS has its “history”. In one case (September 27, 1991) it almost met a brick wall. 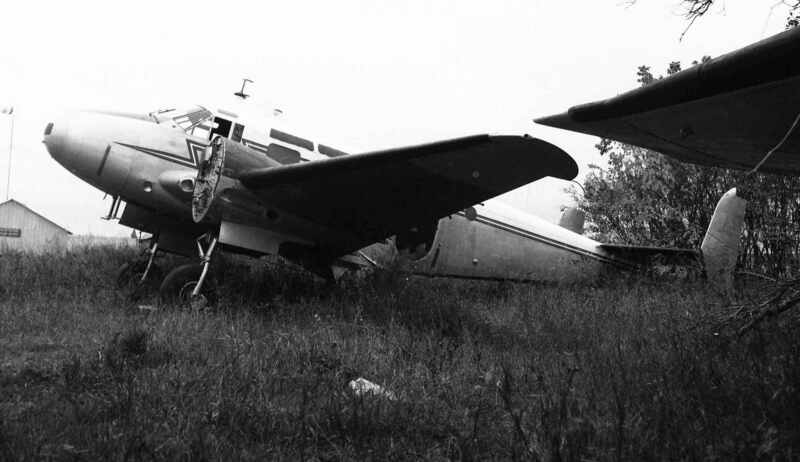 As explained on the Aviation Safety Network, that day it was on a cargo flight from Utica, NY: “During the climb, one of the four propeller blades on the No.2 engine separated from the propeller hub, damaging another propeller blade and the fuselage… The rotational unbalance was accompanied by extreme vibration and resulted in distortion and damage to the engine/cowl assembly and the wing. The upper portion of the engine cowl was deflected upward over the wing at an angle of about 30 degrees, resulting in distortion of airflow, buffeting and degradation of roll control. Due to excessive drag, maximum power was required on the No.1 engine in order to control the rate of descent and land successfully. A metallurgical examination disclosed evidence of fatigue cracking of the propeller hub arm. The NTSB determined the probable cause to be: “Fatigue cracking of the propeller hub… Aircraft repaired and returned to service.” The Rice Rocket is one tough old bird! Like the Metro, it uses the Garrett TPE331. Also at YQT (on its last legs) on July 19 was Wasaya’s HS748 “801” C-GLTC. Originally delivered to the West German government in 1969, “LTC” came to Canada in 1986. It joined Kelner Airways in 1990, then Wasaya in 1992, where it toiled for 25 years. The end of 801 left Wasaya with just one in these historic planes on the go. The sight of “LTC” reminded me of the time a few years ago when I interested the CEO of First Air in offering a 748 to Canada’s national aviation museum. First Air agreed to fly its most historic 748 into the museum at Rockcliffe and “hand over the keys”, but in its wisdom Ottawa said “No thanks”. Soon there won’t be one 748 left flying in Canada. Will the last one go for pots and pans, or will one of Canada’s more visionary museums smarten up and grab itself a 748? Also sitting “in the weeds” at YQT was Metro 227DC C- GSOQ, one of the famous Australian Metros vintage 1993. I heard that when Bearskin purchased several of the “Down Under” Metros, they came all the way across the vast Pacific to Thunder Bay on single-pilot ferry trips. A Wasaya Beech 1900D and Dash 8 sit on the tarmac — but not for long. At this time Wasaya’s fleet was listed as: three 748s, four Dash 8-100s, one Dash 8-300, eight Beech 1900Ds, three Caravans and four PC-12s. The Dash 8-300 was operated for Goldcorp to rotate miners in and out of an isolated gold mine. All day long commuter planes buzz in and out at YQT. Above is Westwind’s 1994 ATR-42 C-GLTE was on lease to North Star during a busy spell. 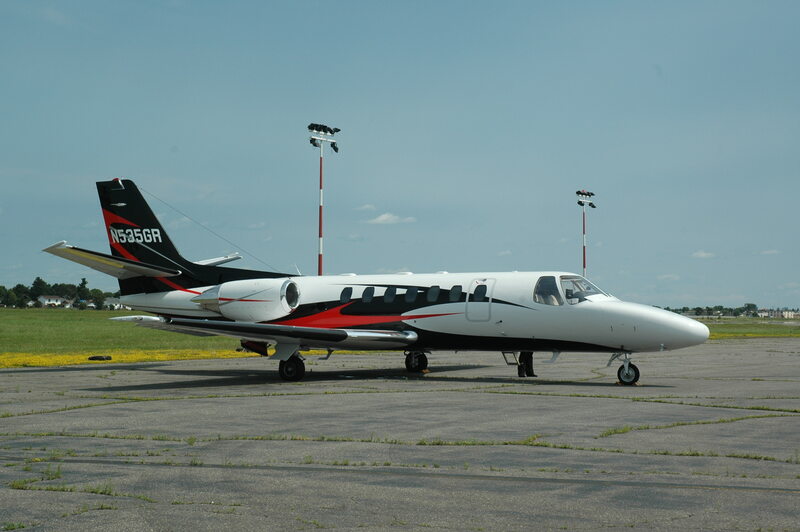 As a Beech 1900D, Metro or PC-12 taxis out, something new arrives at YQT from the north. Here’s a nice pair – Dash 8-100s of Wasaya and Perimeter. I flew on the latter (C-FPPW) to Sioux Lookout soon after my whirlwind YQT visit. “PPW” had spent from 1994-2010 in the US as N827EX. Note that Wasaya Dash 8 C-GJSV has the rear cargo door mod. Built in 1987, “JSV” spent is life in Canada starting with Air Ontario then finally joining Wasaya in 2016. There are some famous names on the street signs around YQT. 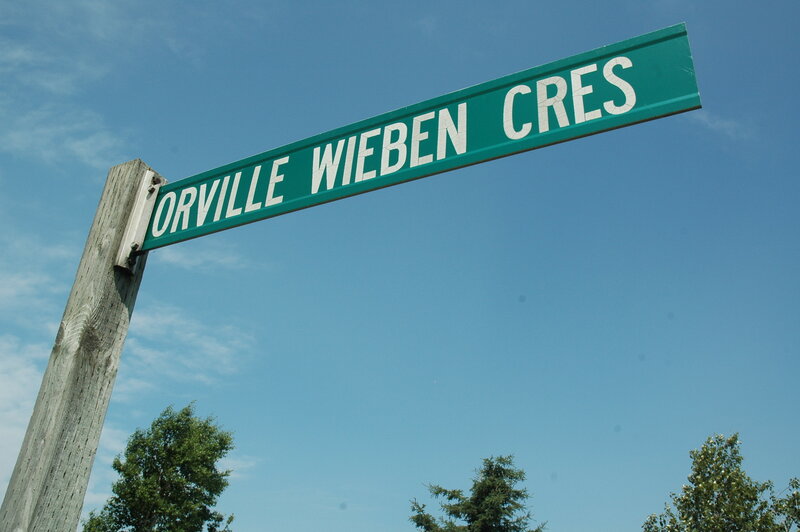 This one honours the great Orville J. “Porky” Weiben, a legendary Canadian aviation hero. During the war he was a test pilot for Canadian Car and Foundry at Fort William, flying Hurricane fighters and Helldiver dive bombers as they came off the Fort William production line. Weiben’s Superior Airways was the local air carrier through the 1950s-70s. On the other side of the field today is Derek Burney Drive, named in honour of Burney, whose credentials include such highlights as Canada’s ambassador to the USA and president of CAE Inc of Montreal. Naturally, there also is Kelner Drive at YQT. Thunder Bay Airport (YQT) volumes hit an all-time high by hosting 844,627 passengers in 2017. Traffic grew by 4.6 per cent over 2016 volumes. Traffic volume growth was supported by a number of positive factors. Additional capacity offered by a number of airlines into northern destinations has contributed new volume. The early start of the winter charter season also brought new passengers to the airport. Airport volumes also benefitted significantly from the Under 18 World Baseball Championships and the rise of international student enrolment at both Lakehead University and Confederation College. “Hi, Larry … I came across your website while researching Noorduyn Norsemans, after finding an old crash site on a mountainside near our home in north Georgia. Thought you might be interested in seeing some of the photos. To date I have been unable to find any record of the crash, after checking online Norseman records as well as US civilian and military records. Local inquiries haven’t uncovered anything yet either. “The site is at approximately 3760 feet in a wilderness area just south of the North Carolina state line, near Hiawassee, Georgia. We are wondering if perhaps the crash occurred on the way to or from the Augusta, Georgia location of the Reconstruction Finance Corp., which handled surplus US Army UC-64 Norsemans. But that’s just conjecture. “We also think the aircraft may have been salvaged, since a number of large components are missing. Including the engine, engine mount, firewall, landing gear and wheels, wing struts, instrument panel, control stick, one wing, etc. Although, I don’t know how these large parts could have been salvaged, since it is very difficult to even hike to the site today, and the old 1930s logging roads never reached such steep parts of the mountains. A 98-year-old Royal Canadian Air Force (RCAF) Second World War veteran and former Prisoner of War now living in Colorado Springs, Colo., received a surprise visit Feb. 23, 2018. George Sweanor, a retired RCAF Squadron Leader, was met by members of 419 Tactical Fighter (Training) Squadron at the Colorado Springs Airport following the unit’s training mission in El Centro, Calif.
Sweanor was one of the founding members of the squadron that stood up in 1941 in the United Kingdom as the third RCAF bomber squadron overseas. 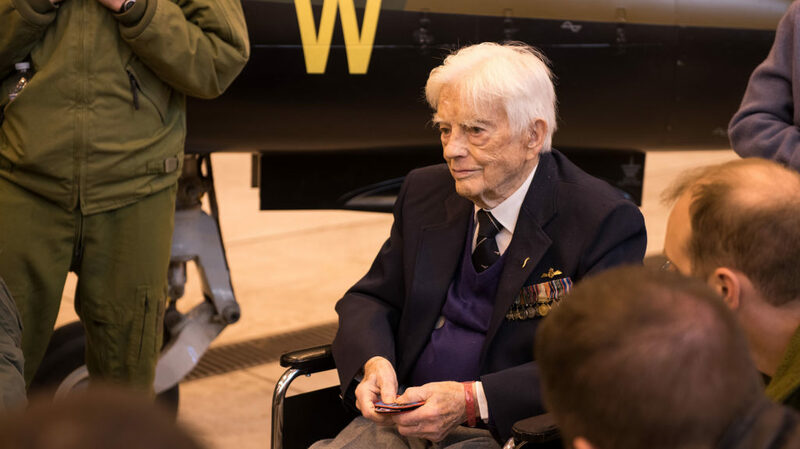 Members of 419 Squadron talked with and listened to Sweanor for more than an hour as he reminisced about his time with the squadron and his experiences during the Second World War. 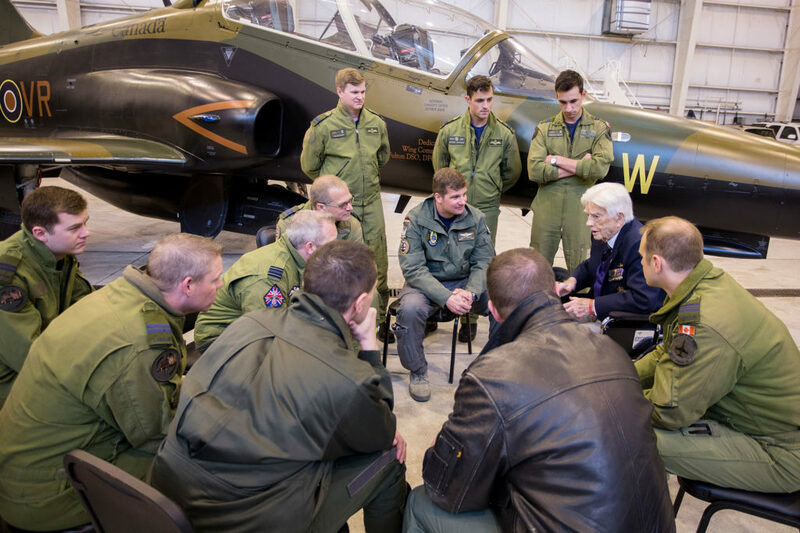 “It was an honour for us to meet such a distinguished veteran and founding member of 419 Squadron,” said Maj Ryan Kastrukoff, deputy commanding officer of the unit. During the war, Sweanor served with the RCAF in the United Kingdom with 419 Squadron. In 1942, he was shot down and captured after multiple flights over enemy territory, spending 800 days as a Prisoner of War. Following the war, Sweanor remained with the RCAF. Also of note, he was one member of a group that opened Cheyenne Mountain, former home to North American Aerospace Defense Command (NORAD), which is celebrating its 60th anniversary this year. His last assignment was in Colorado Springs, where he retired and began teaching at Mitchell High School. He is also a founding member of 971 Royal Canadian Air Force Association Wing in Colorado Springs and regularly attends events as a special guest, along with members of the Canadian Armed Forces serving at NORAD. As part of the visit, Squadron members presented him with a book commemorating the 75th anniversary of the squadron, a current squadron patch and a squadron patch with his name stitched into it. Sweanor has written one book and continues to write his own blog. The current 419 Tactical Fighter (Training) Squadron was formerly known from 1941 to 1945 as No. 419 Squadron, Royal Canadian Air Force. world’s worse loss of life in an airline accident. Cause? Same. narrative finely interwoven, e.g. the DC-10 crash at Sioux Falls. If you follow airline history, you’ll want a copy of this gem of a research effort. become one of the great jetliners. 232 pages, hardcover, notes, index. 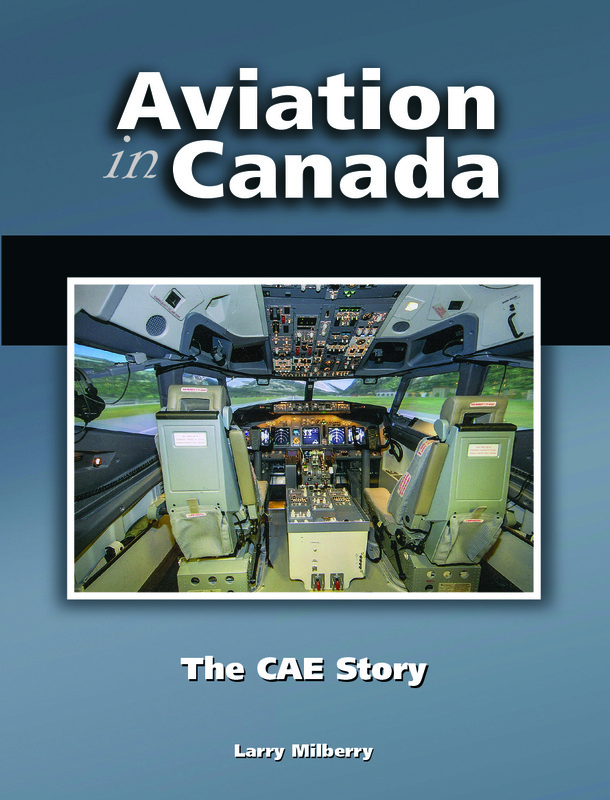 You may not yet have your copy of Aviation in Canada: The CAE Story. industries? Developed control systems for naval and commercial vessels? Produced the hand controller (still in use) for the Space Shuttle and ISS? nothing about a small Canadian company developing into a world leader). *Payment info: Pay directly to larry@canavbooks.com if using PayPal. If not, mail your cheque to CANAV Books, 51 Balsam Ave., Toronto ON M4E3B6.